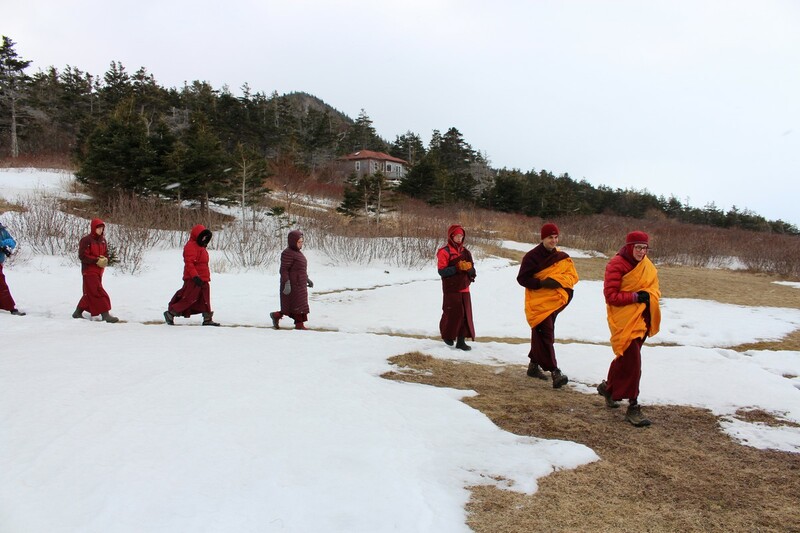 From this page you will be able to explore photos of many different aspects of life at Gampo Abbey. 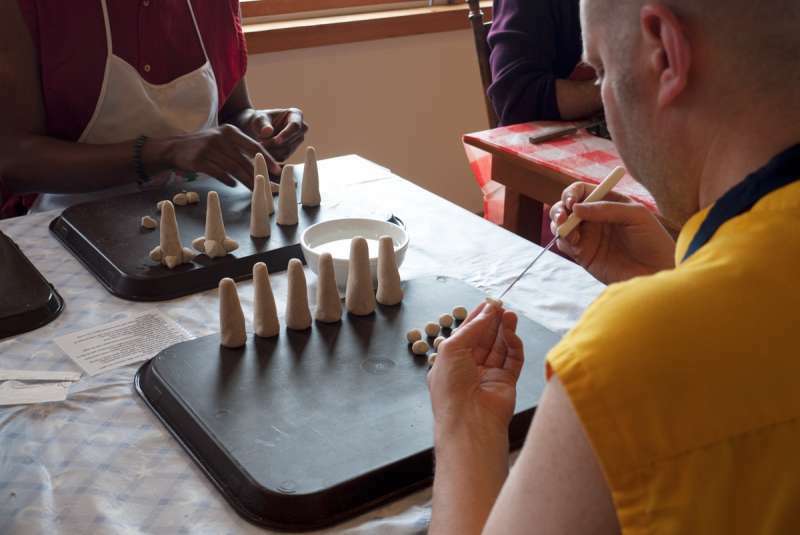 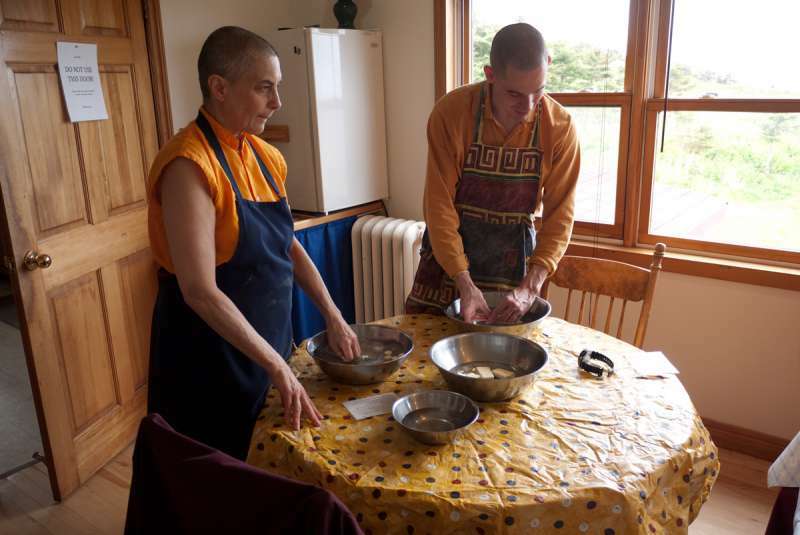 During Yarne, practitioners benefit from tighter discipline in the form of longer practice sessions, boundaries to the retreat space, and other restrictions. 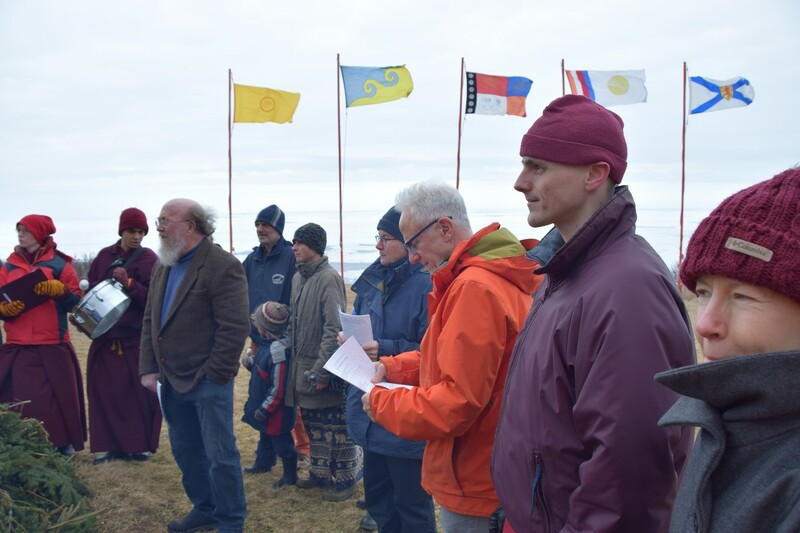 However, there is a risk that the community may become attached to the restrictions themselves! 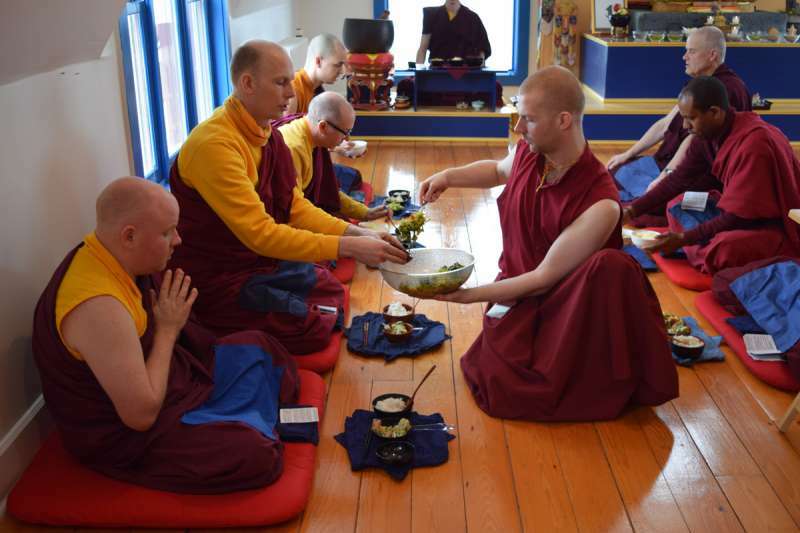 Therefore, since the time of the Buddha, Yarne has been followed by Gagye, the lifting of those restrictions. 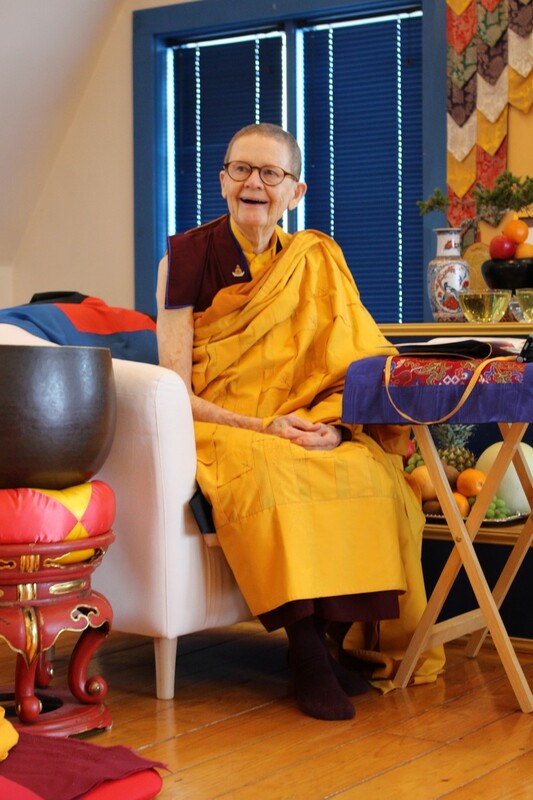 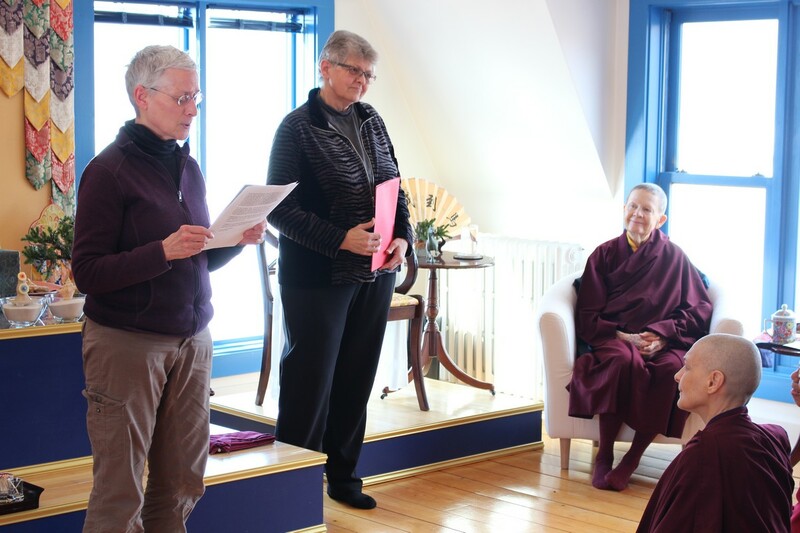 On April 15, Acharya Pema Chödrön led the retreat community in the Gagye ceremonies, bringing an official end to the retreat. 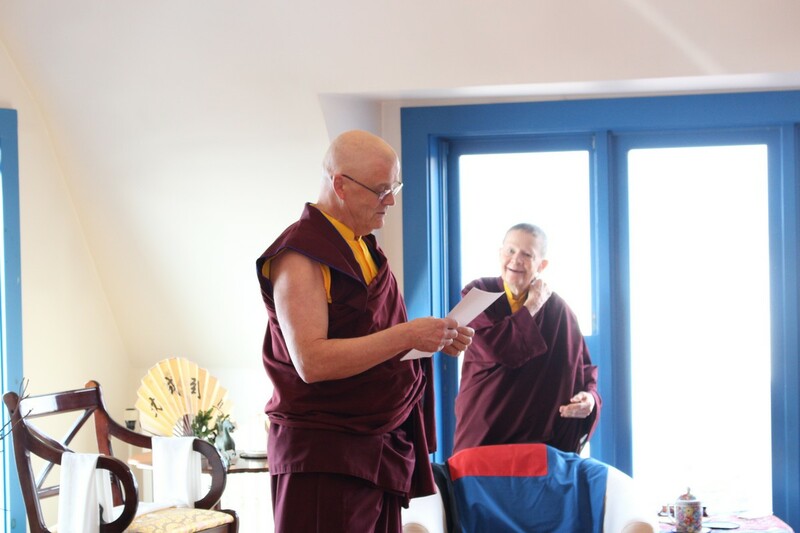 We thank all of our wonderful guests and hope to see them again soon! 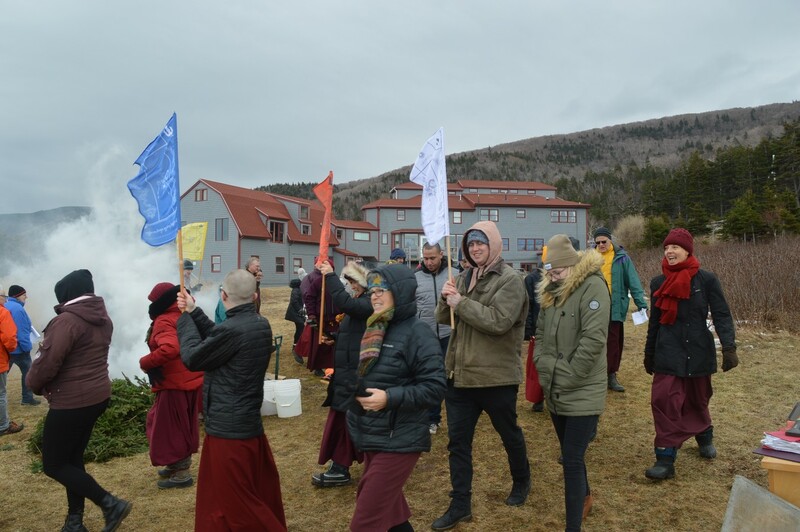 The evening before Gagye, the lifting of restrictions that officially ends the Yarne winter retreat, every monastic at the Abbey gives a short dharma talk to the entire retreat community. 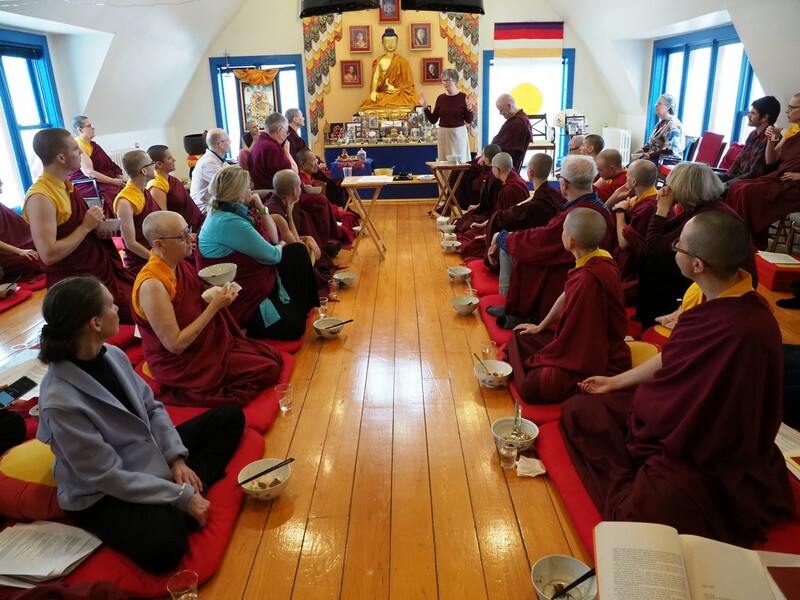 This tradition, dating back to the time of the Buddha, is a way for monastics to share the insight they have gained through practicing and listening to the teachings. 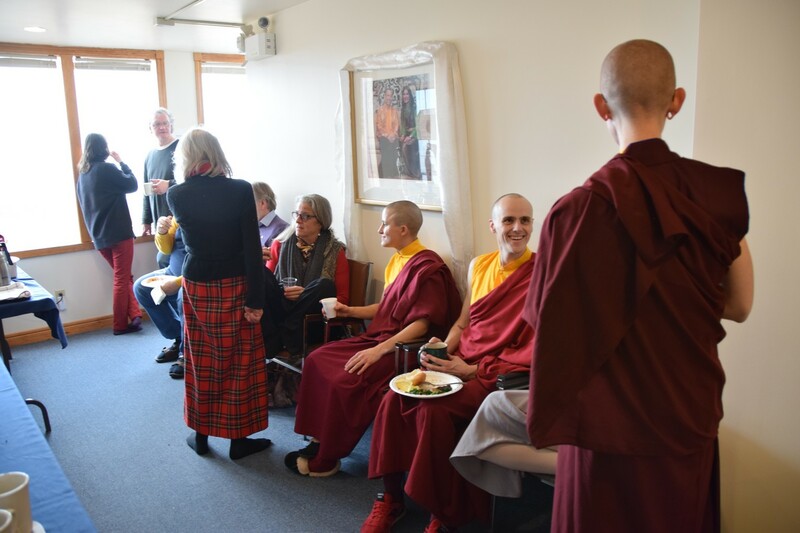 Starting with Pema Chödrön, the monastics (and some brave lay practitioners) gave talks on practicing for the bardos, working with the groundlessness of the present moment, and working with the six realms of samsaric existence. 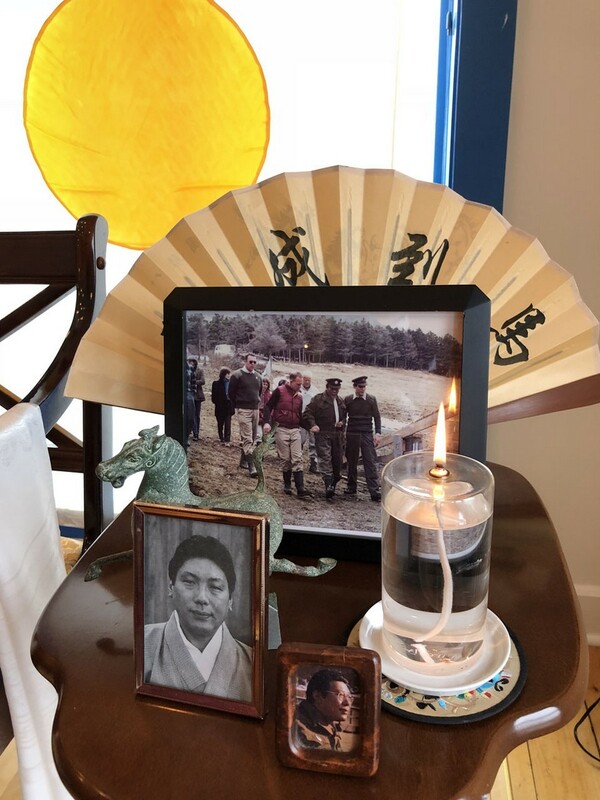 Happy Year of the Earth Dog! 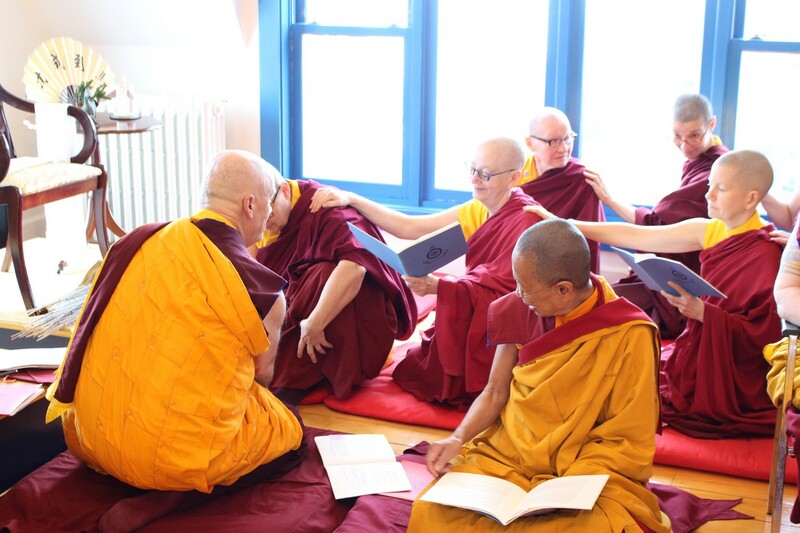 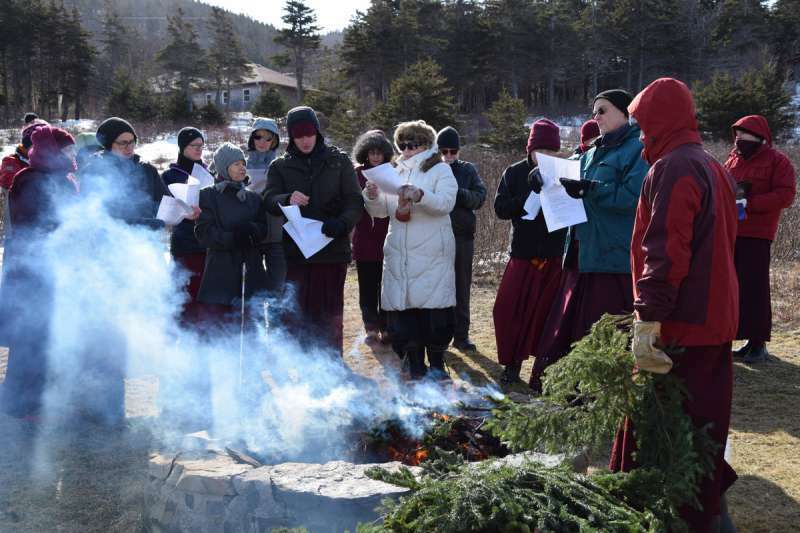 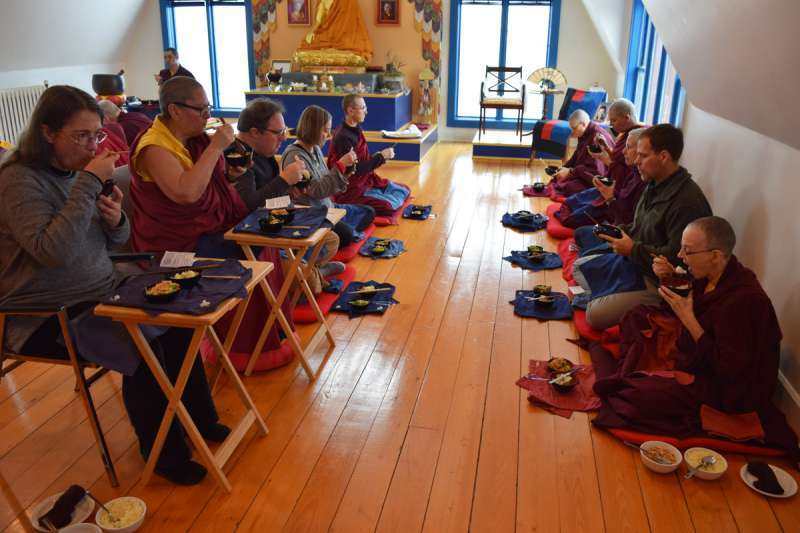 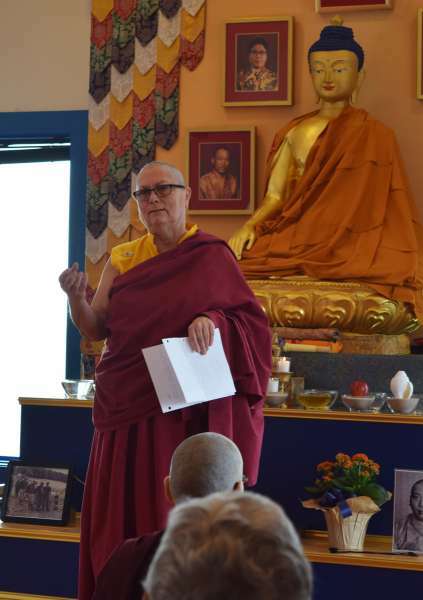 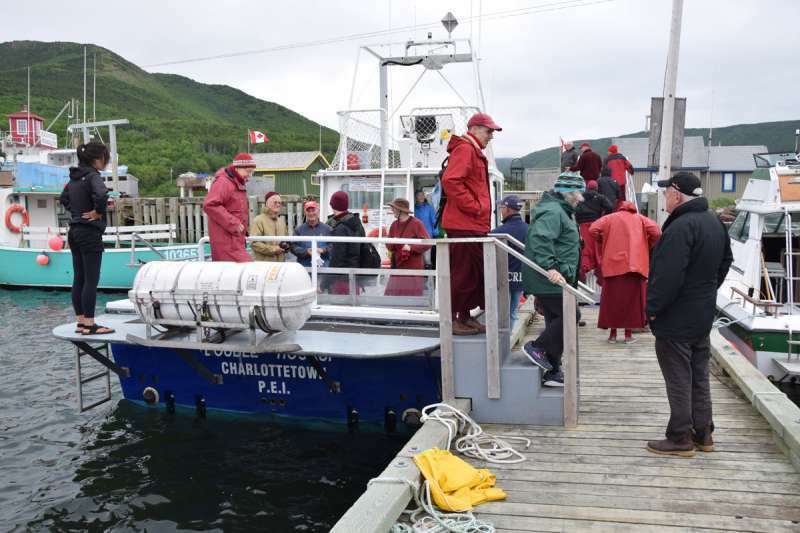 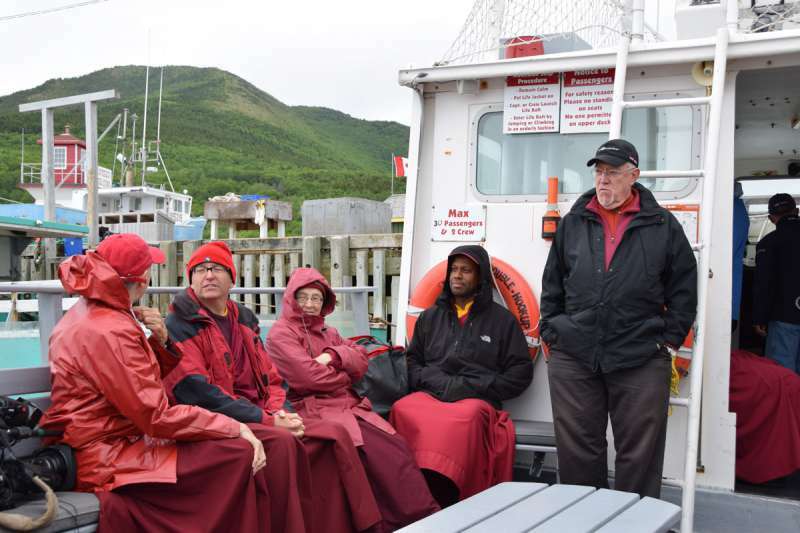 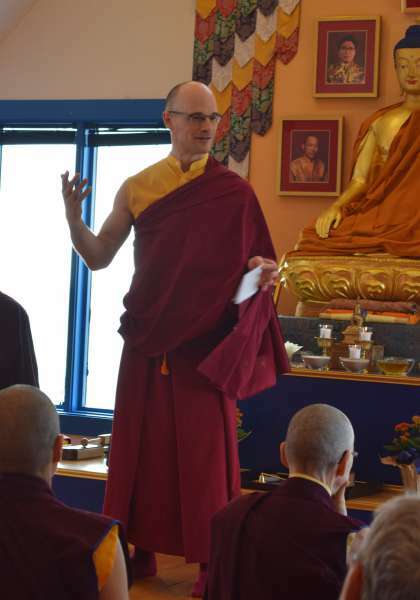 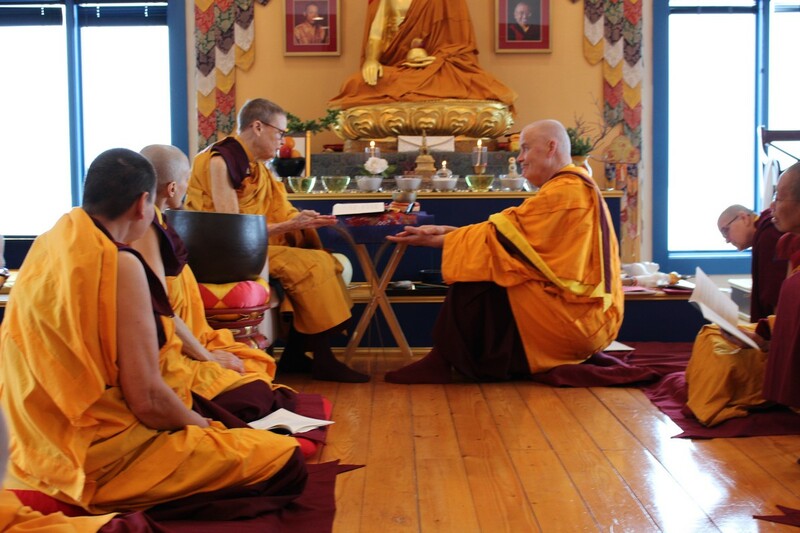 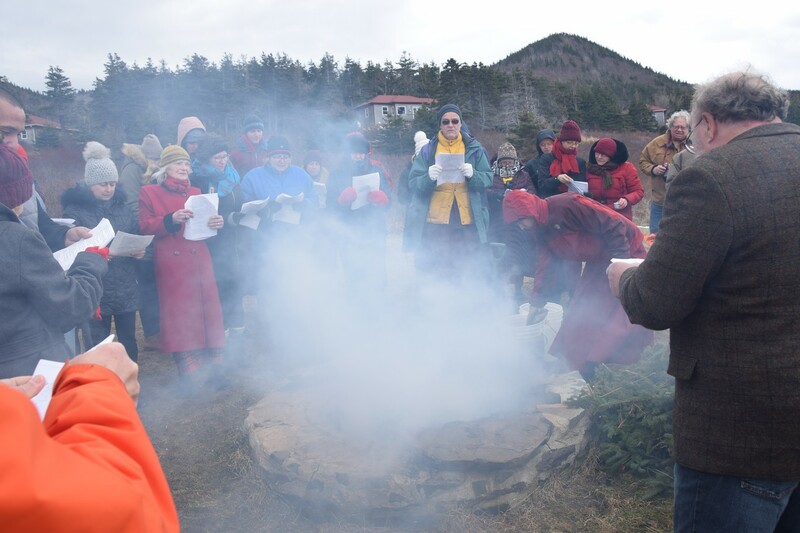 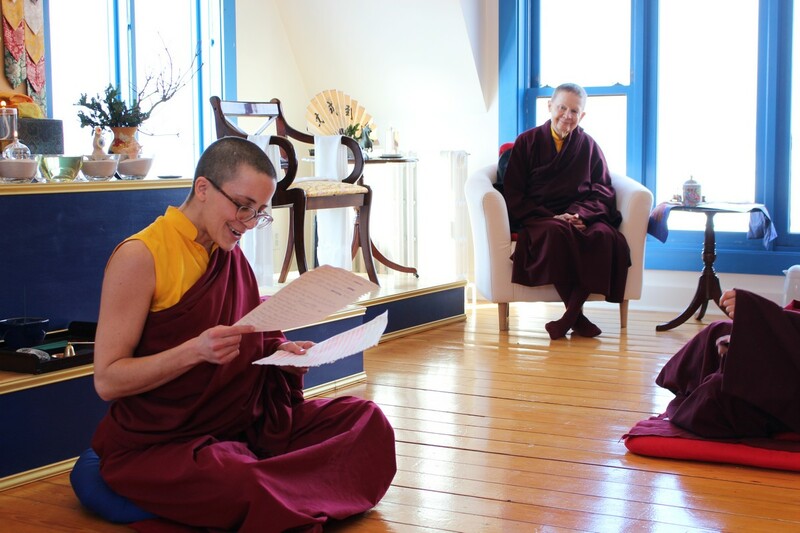 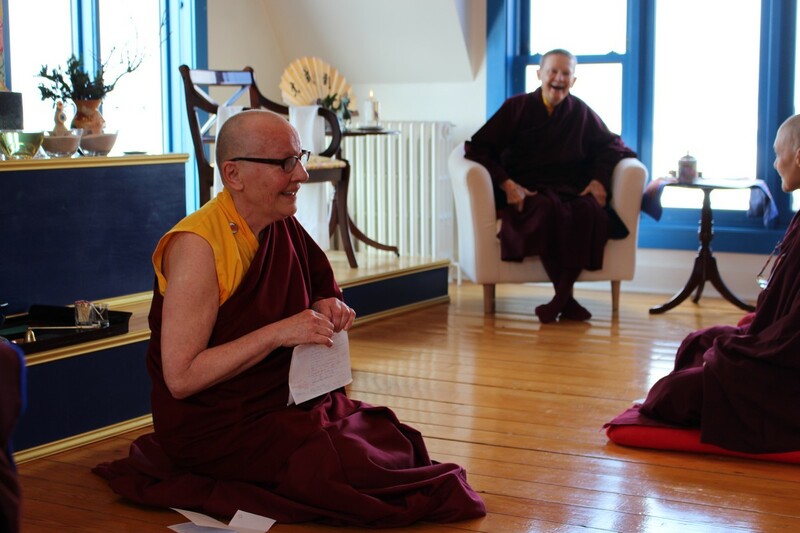 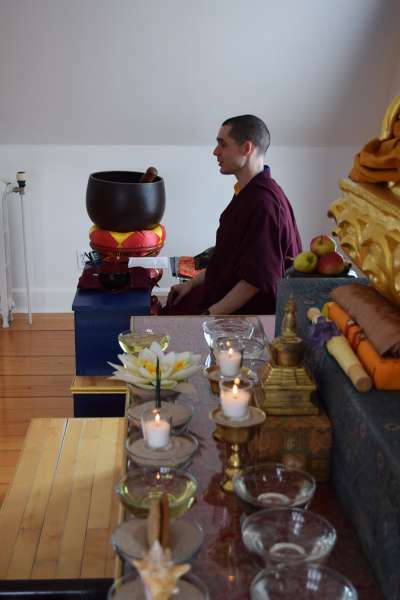 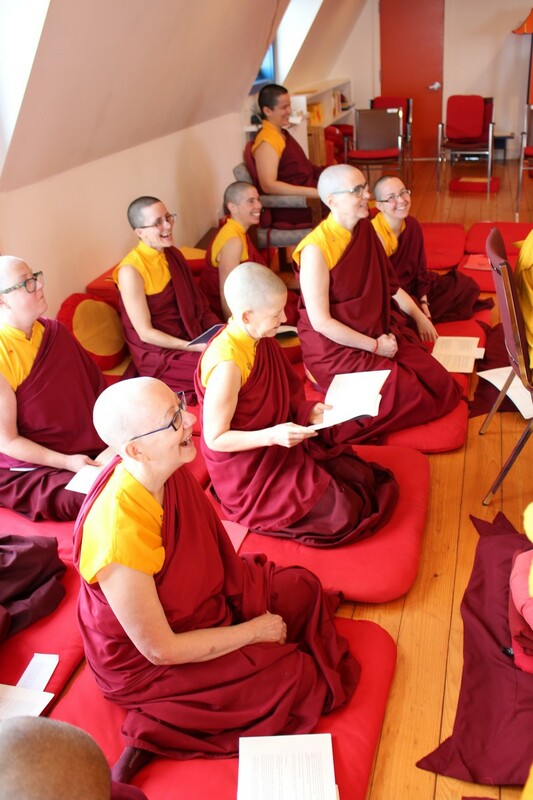 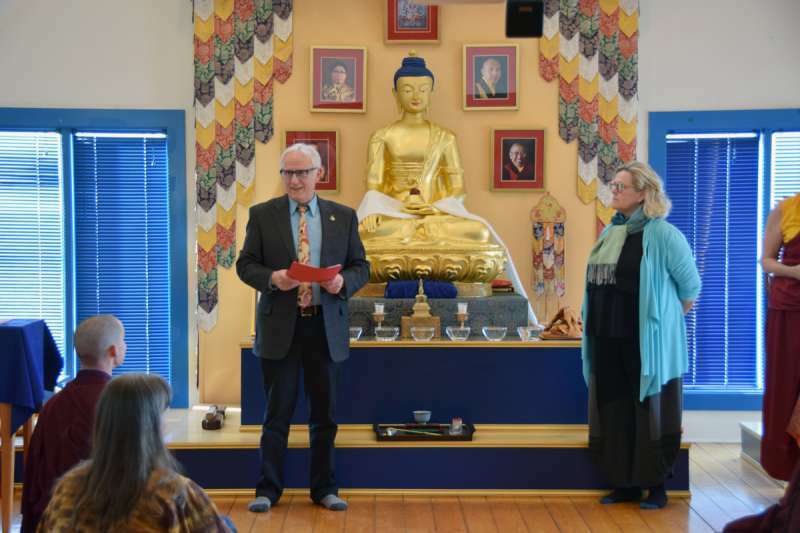 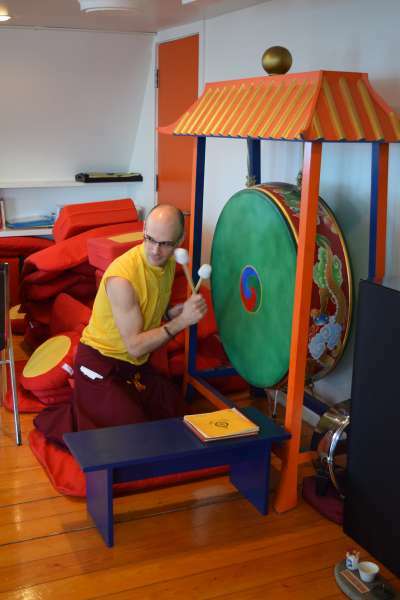 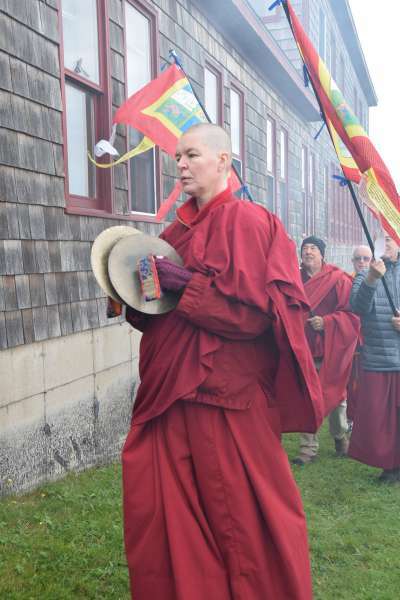 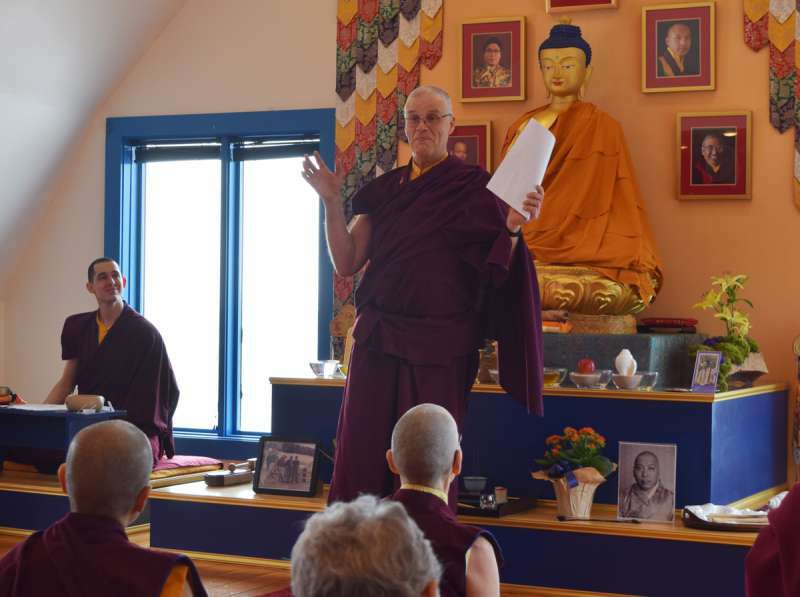 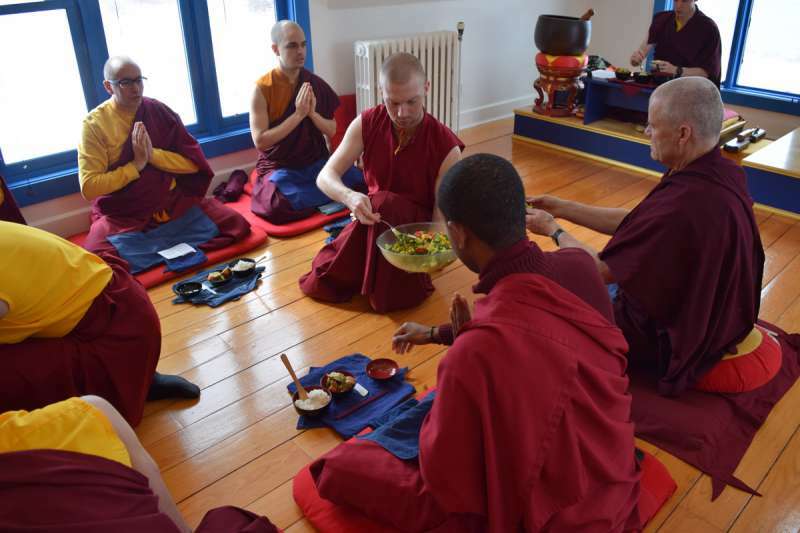 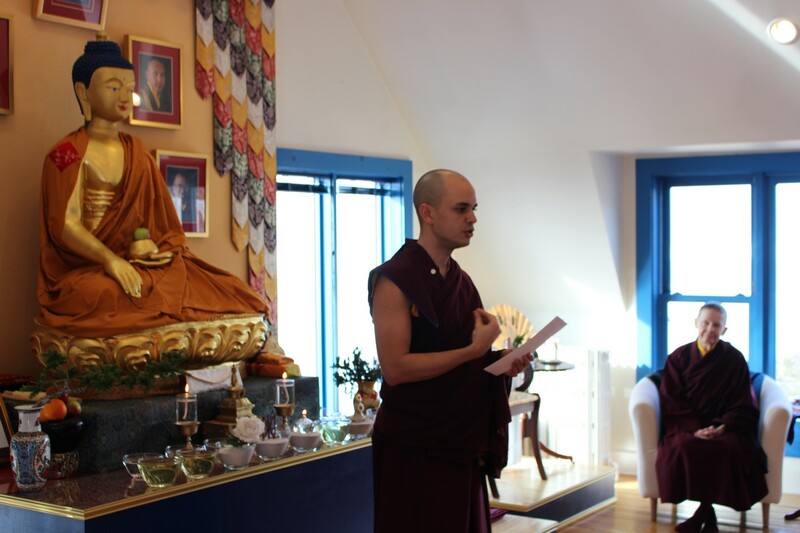 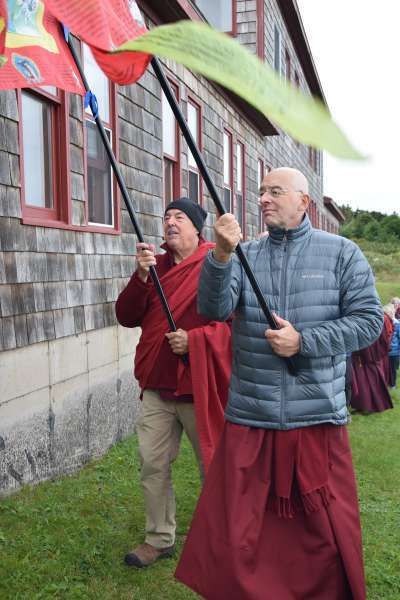 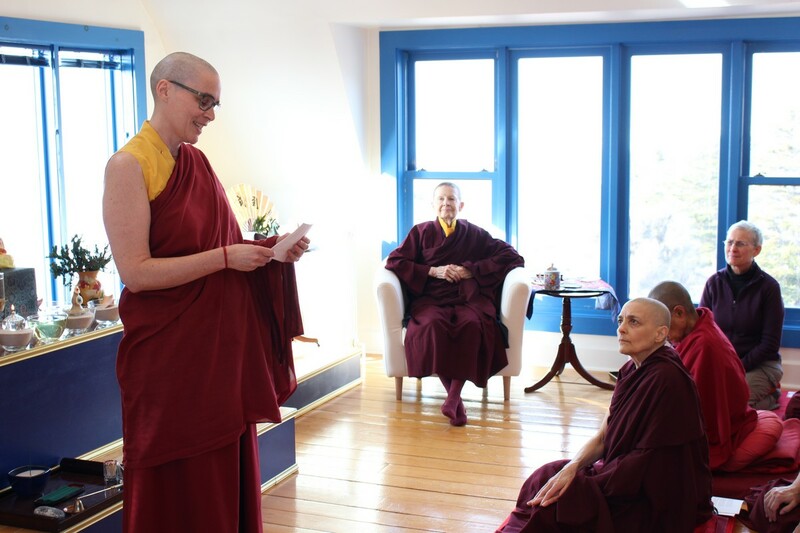 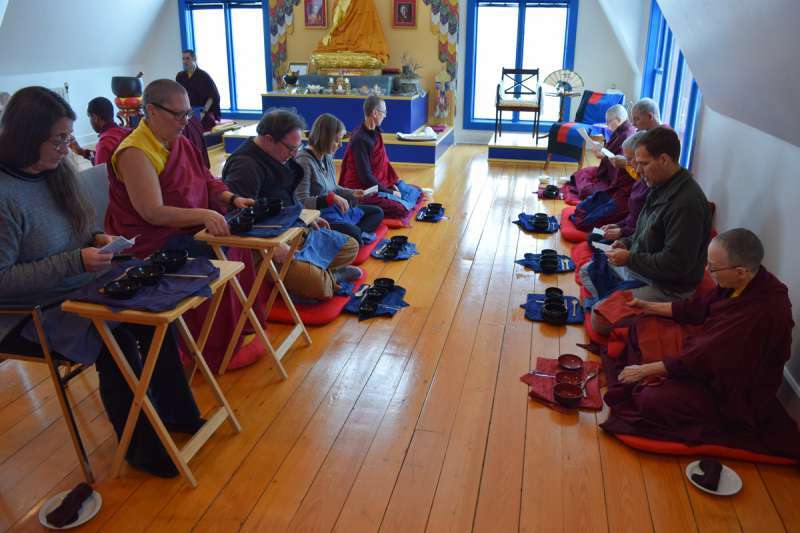 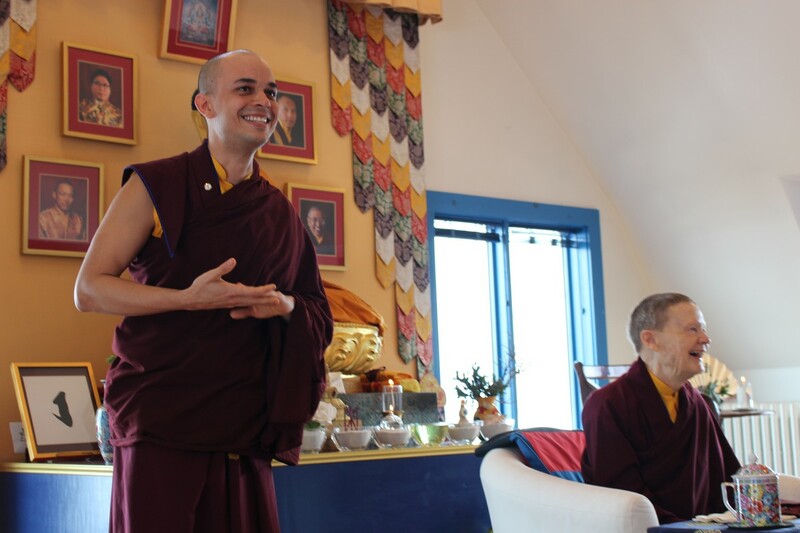 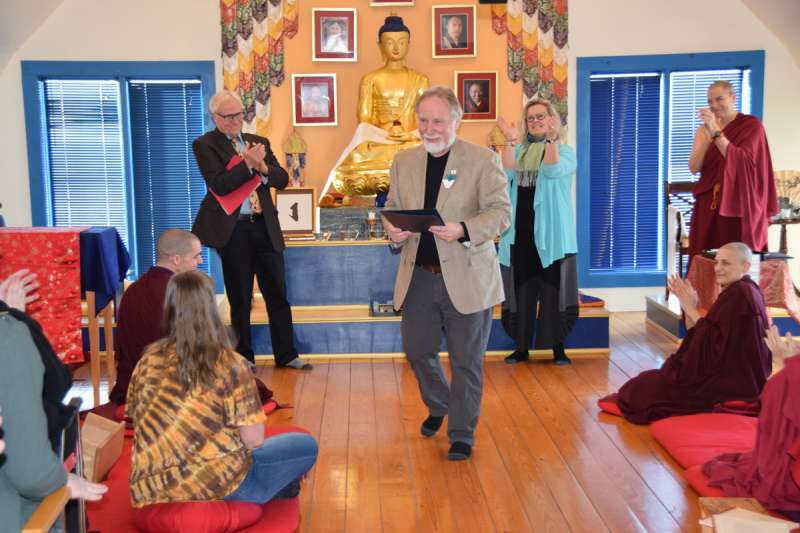 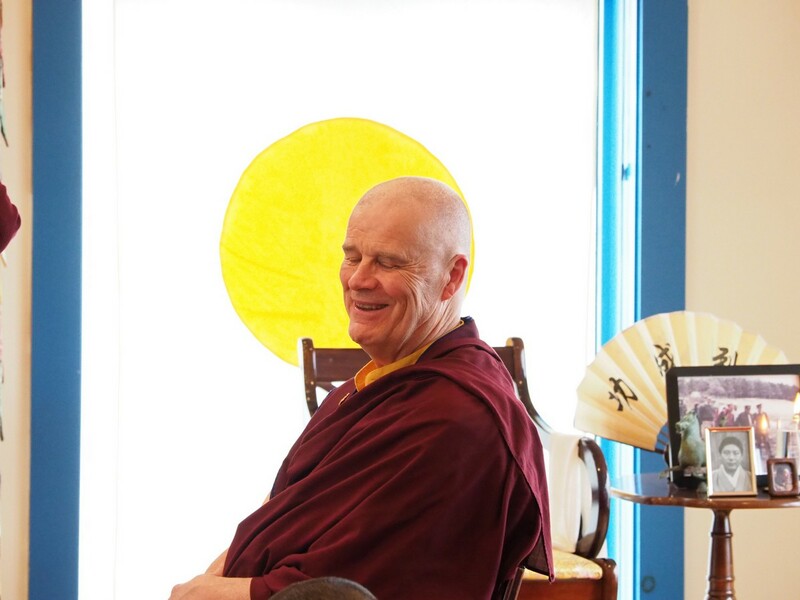 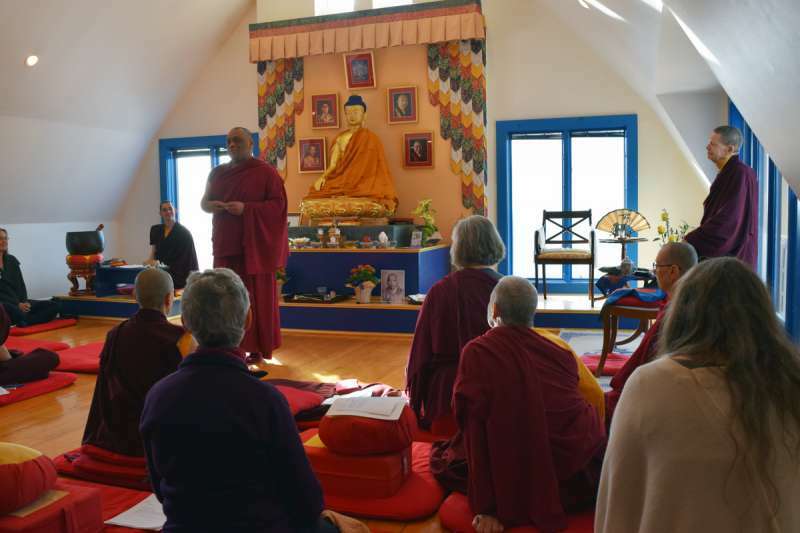 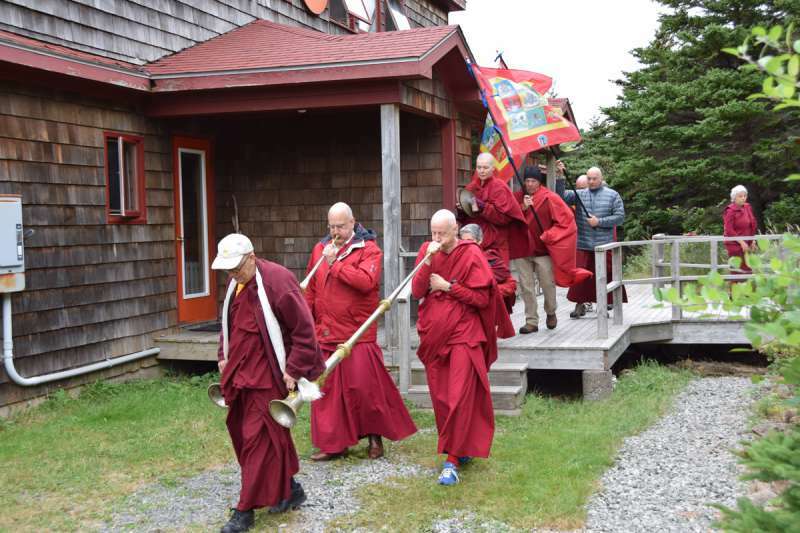 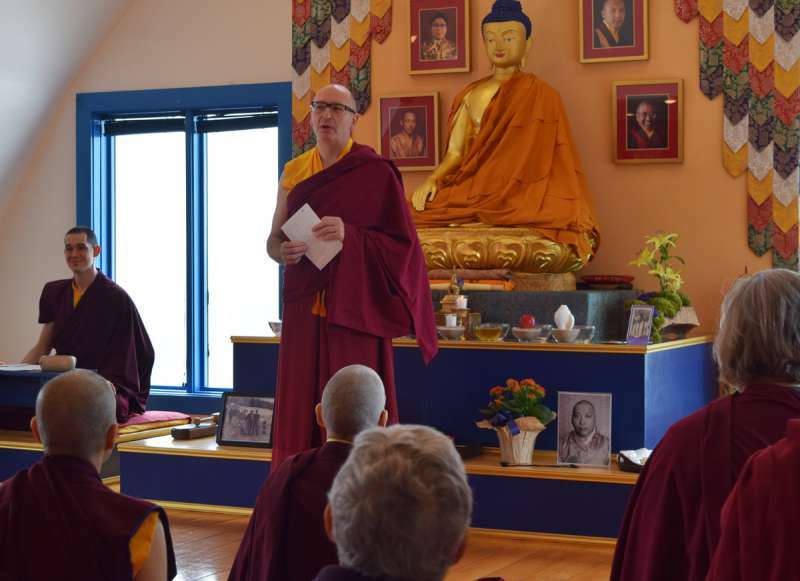 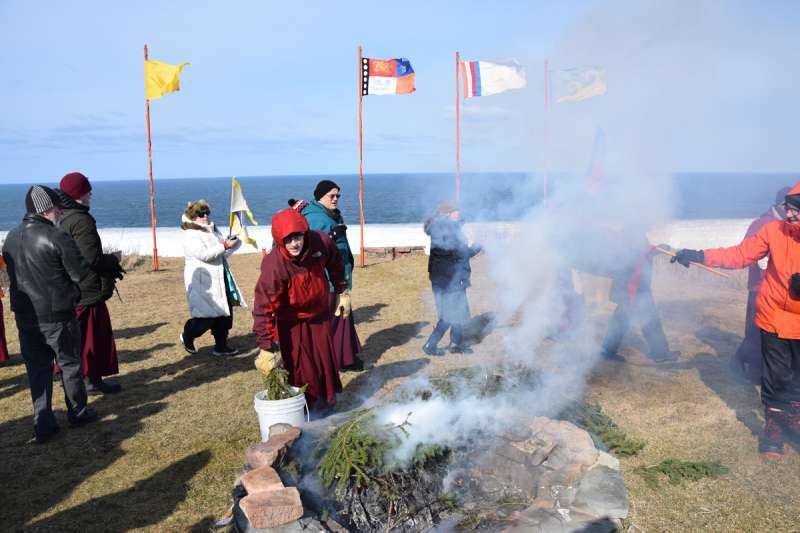 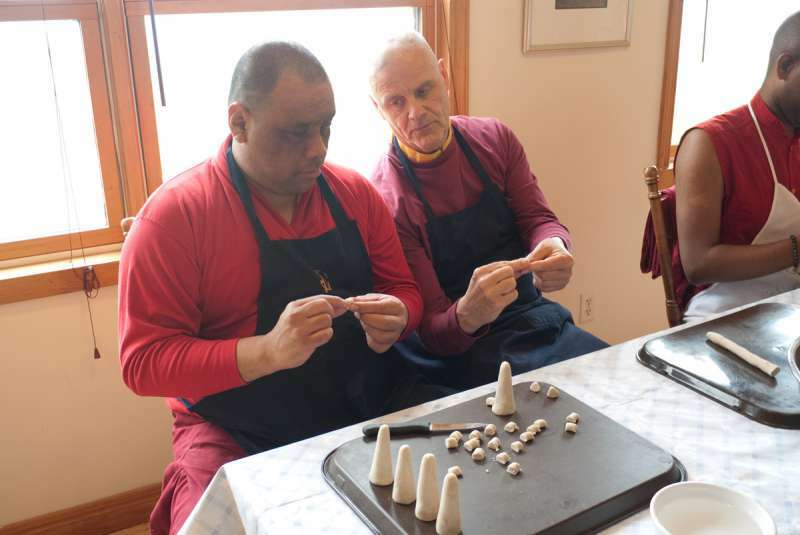 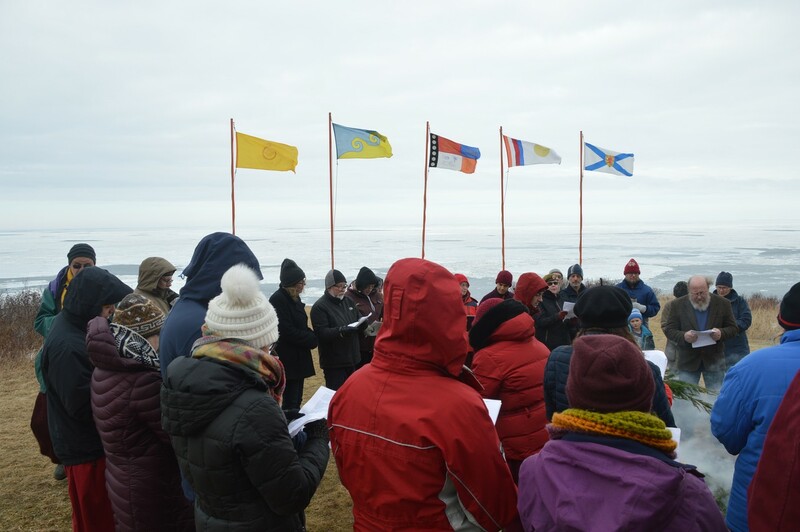 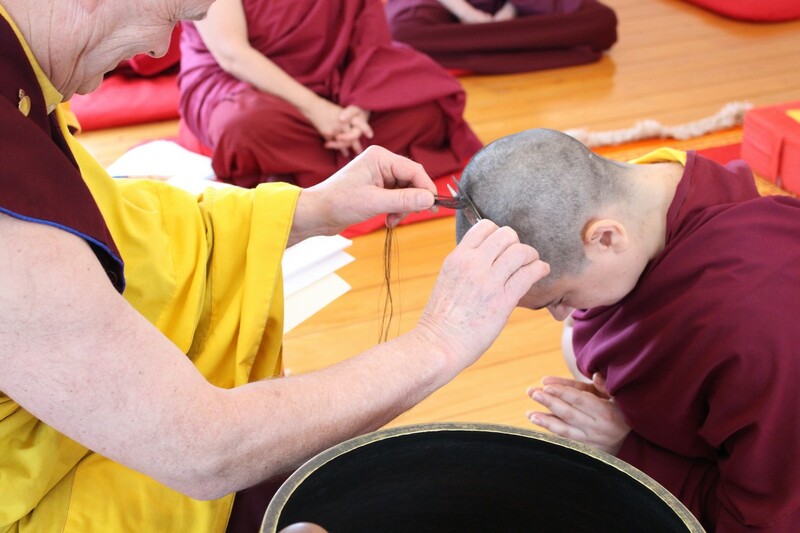 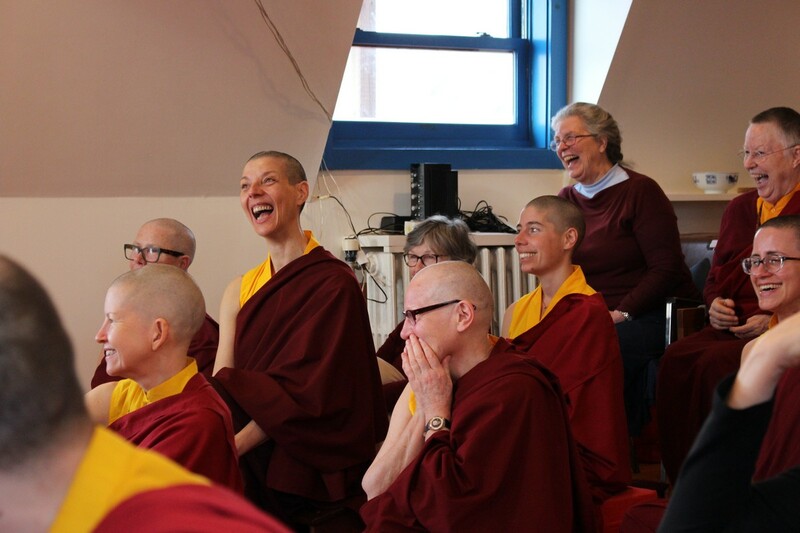 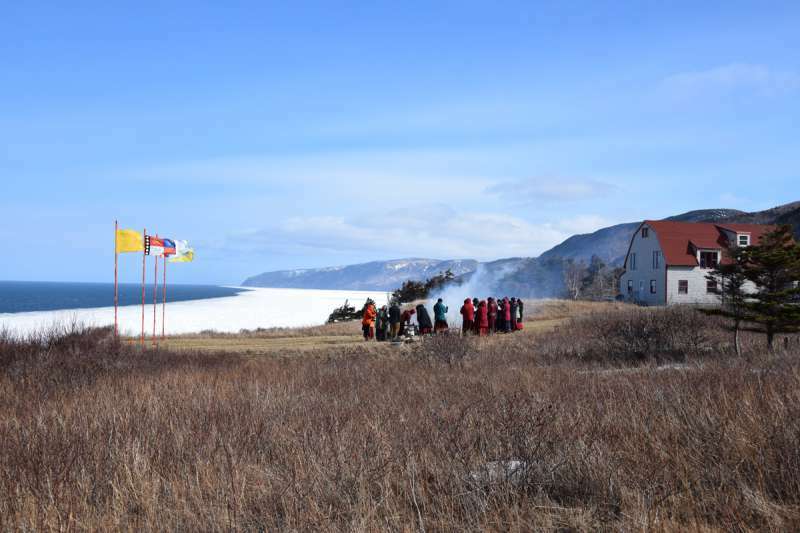 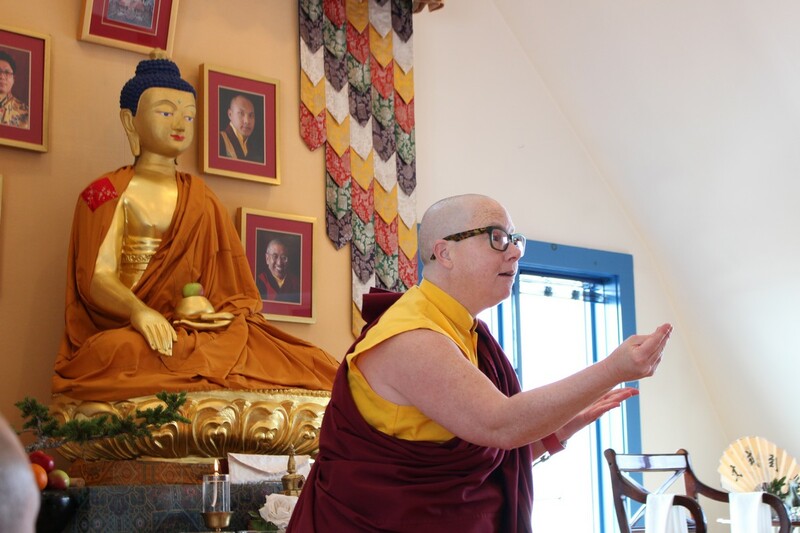 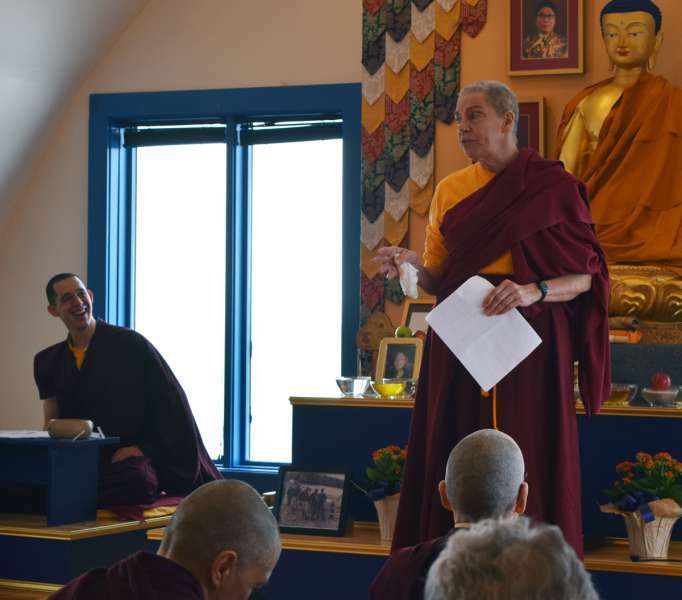 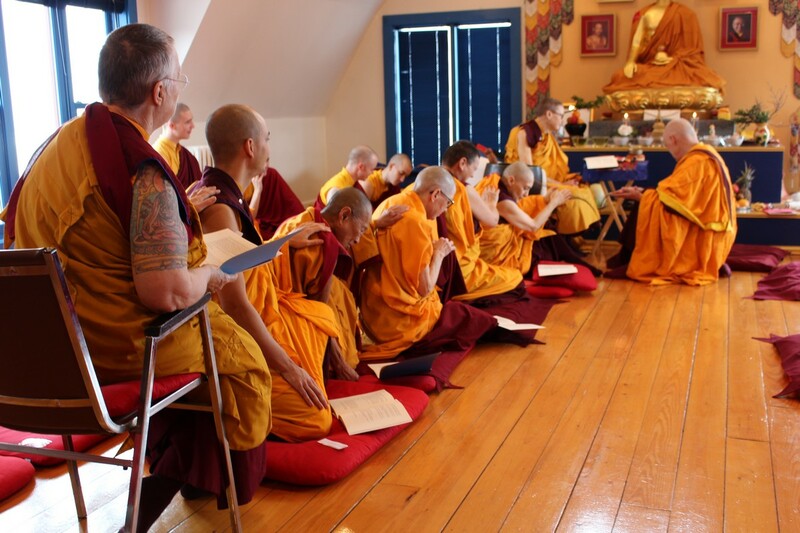 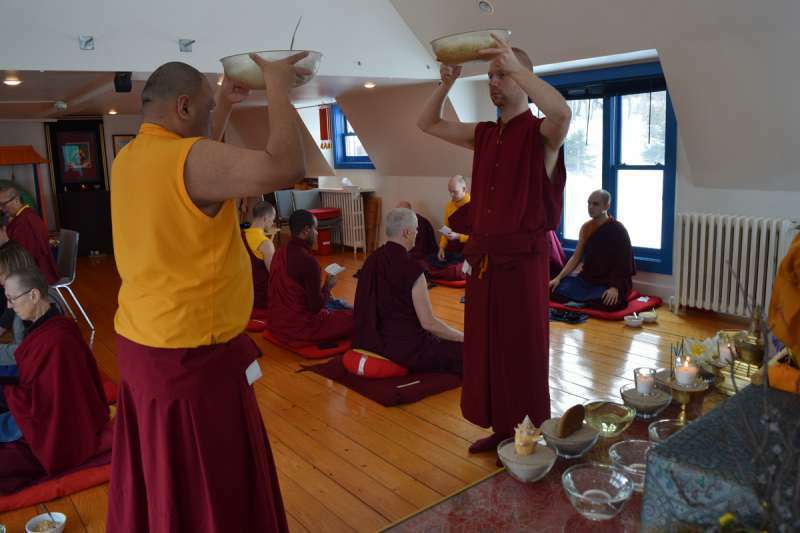 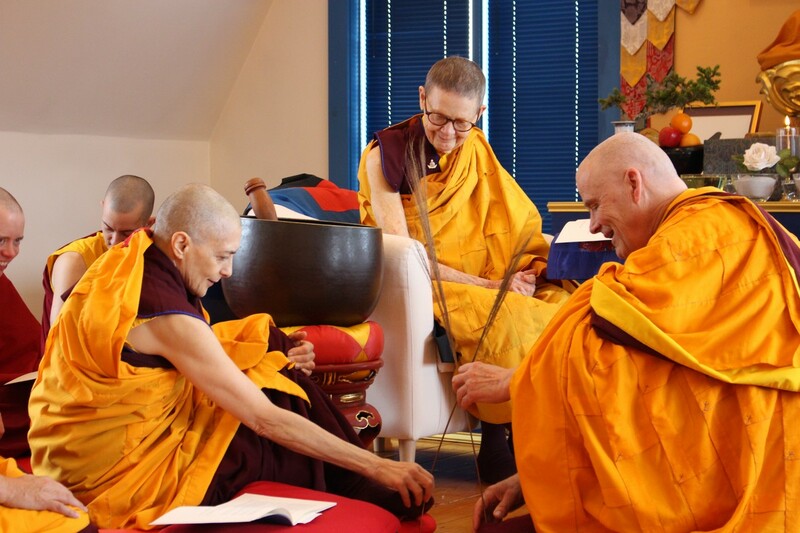 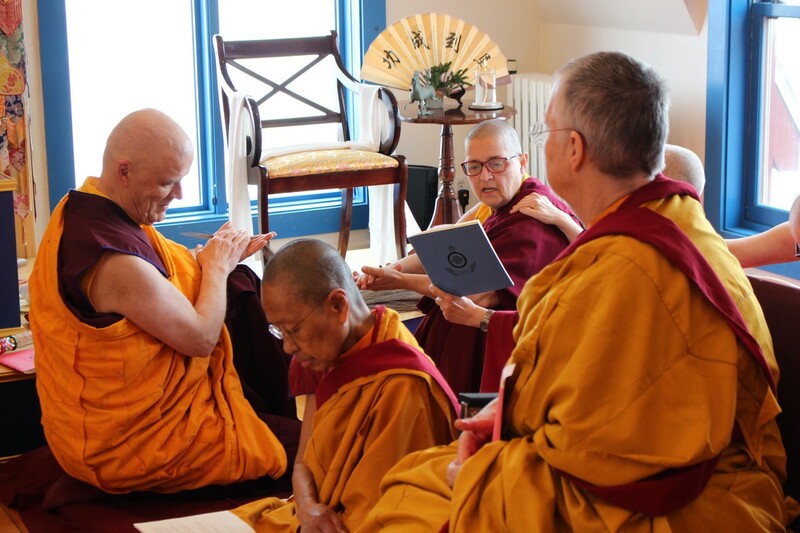 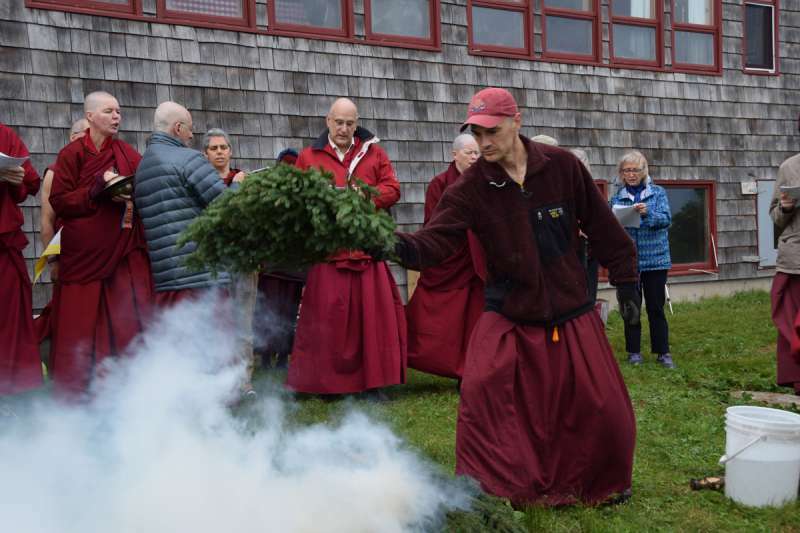 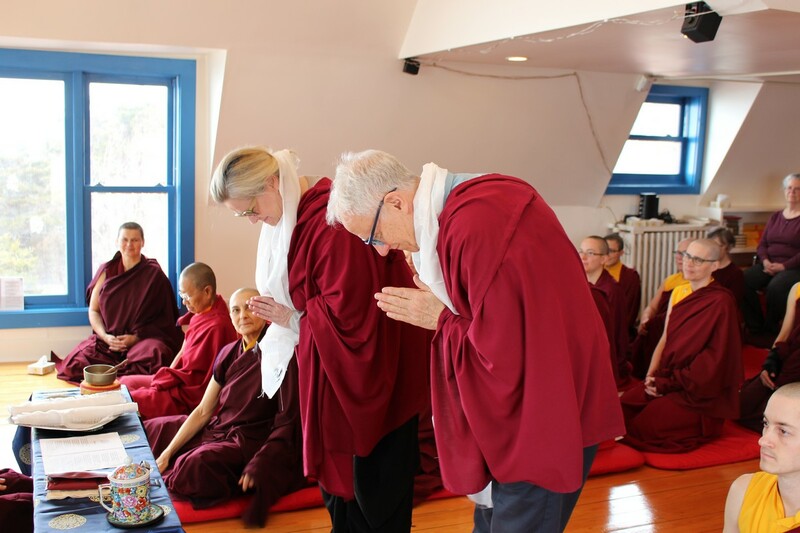 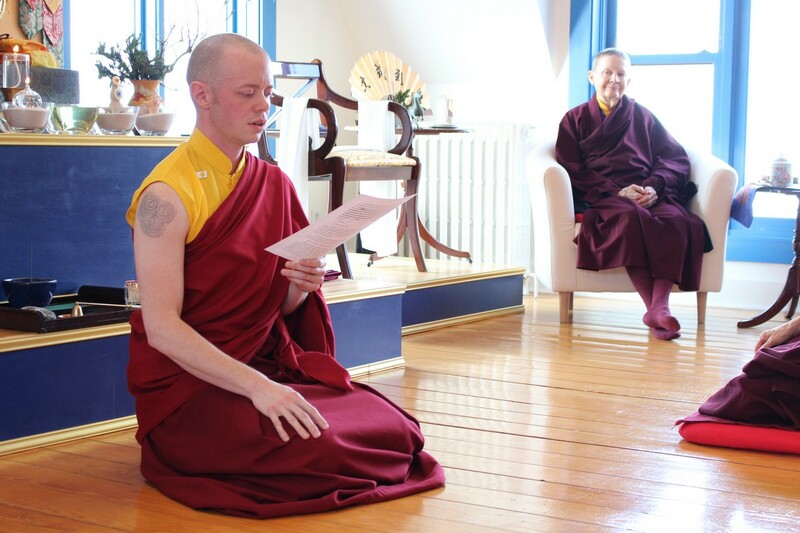 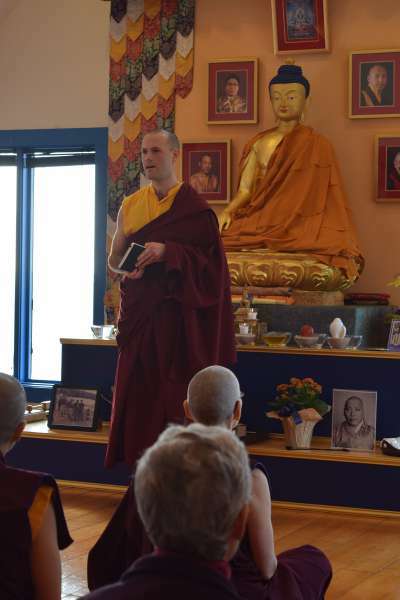 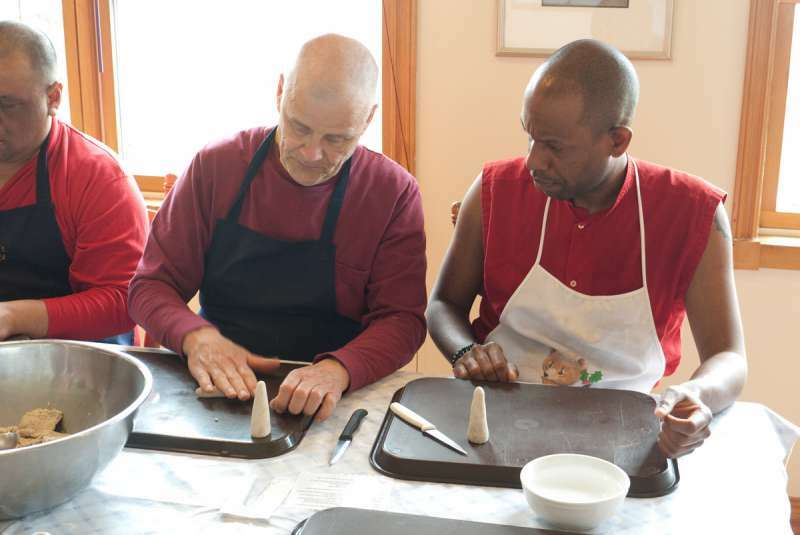 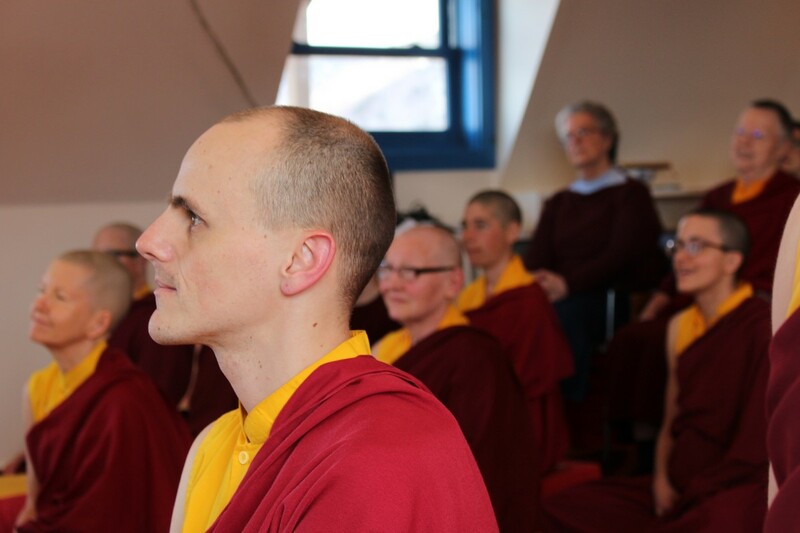 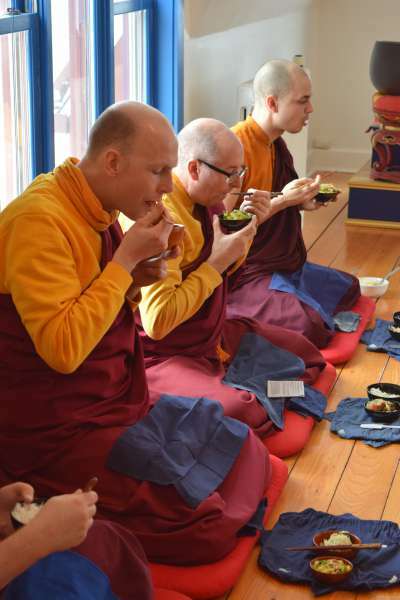 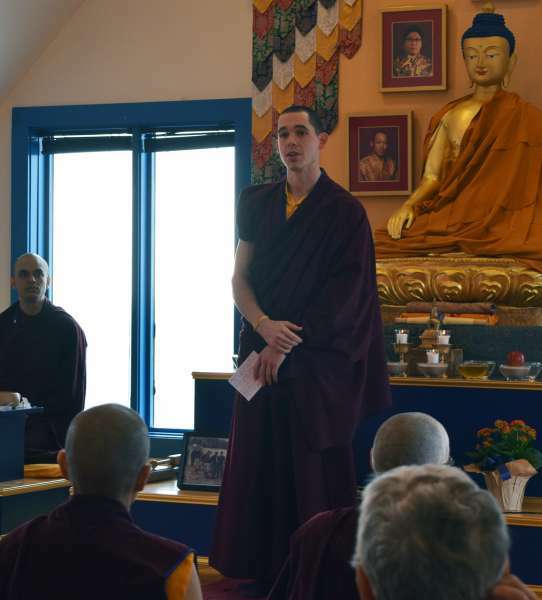 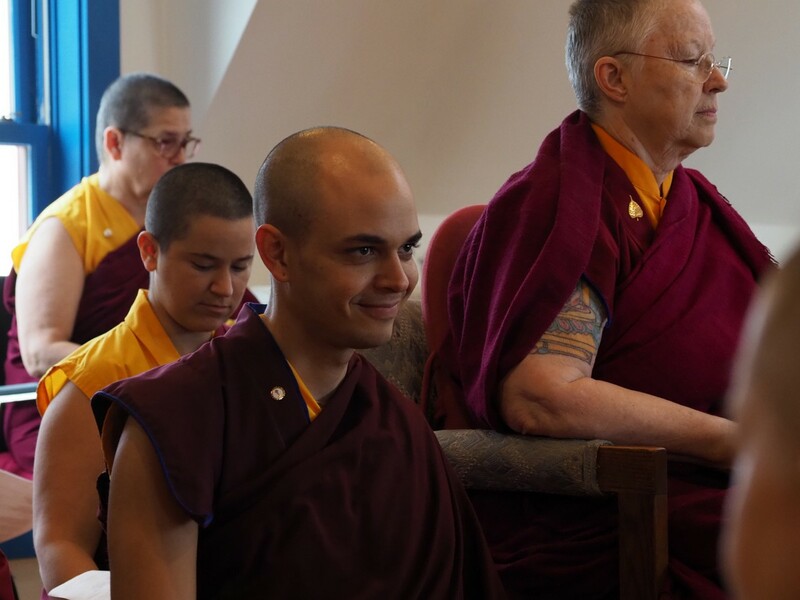 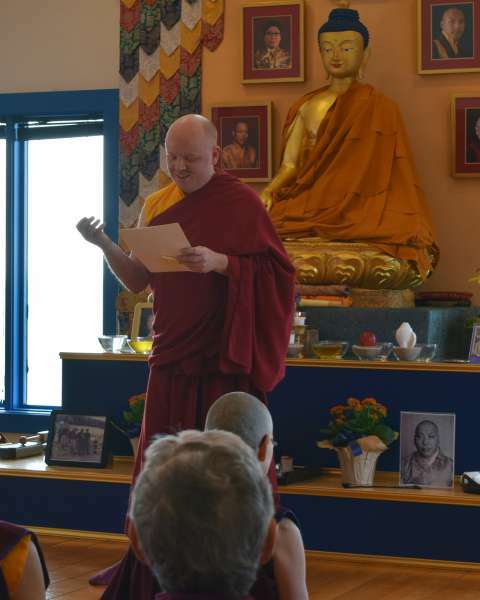 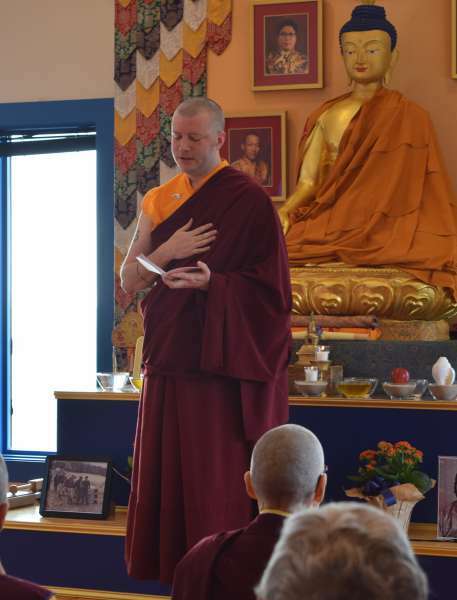 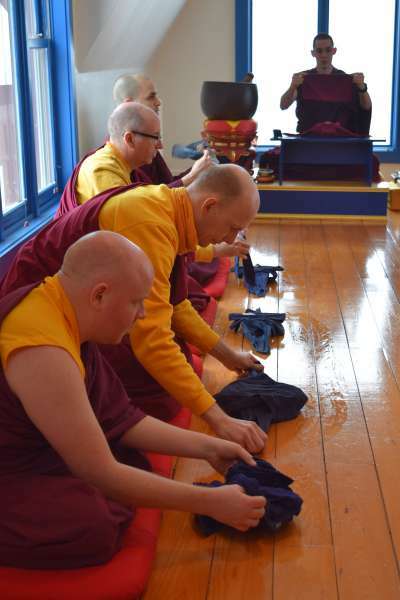 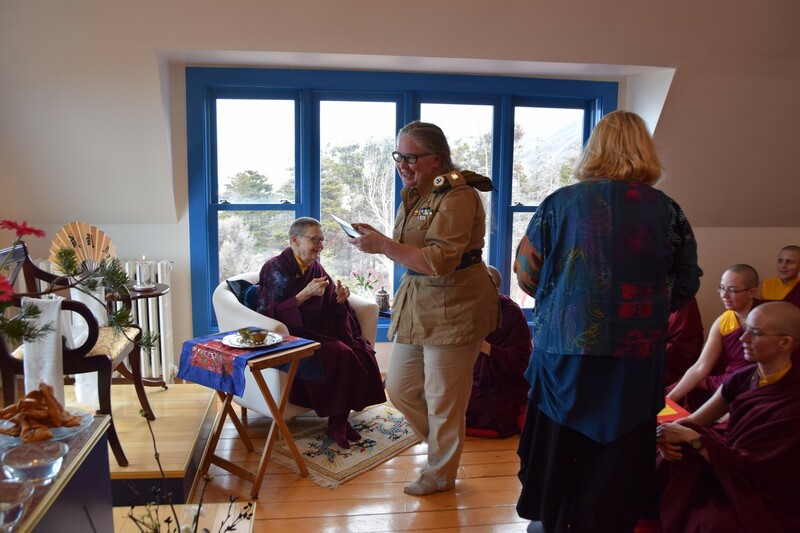 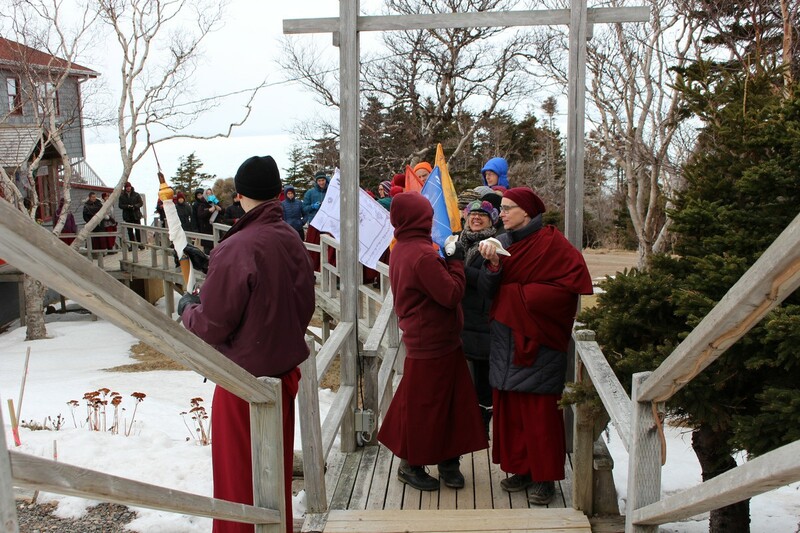 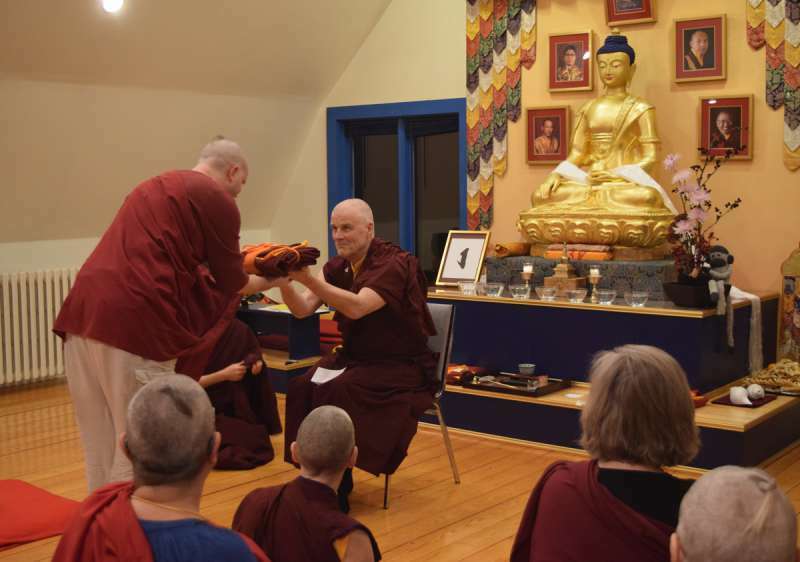 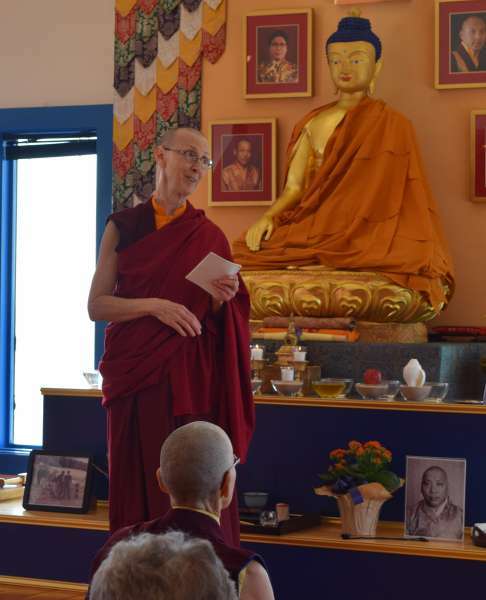 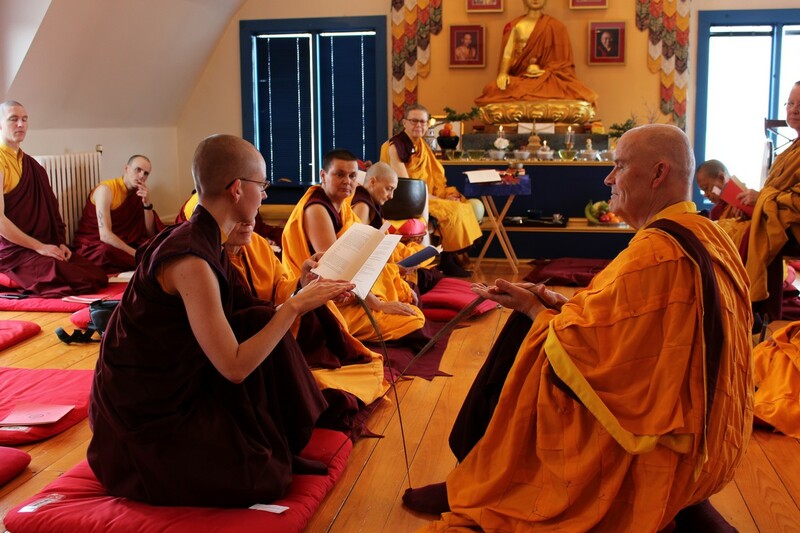 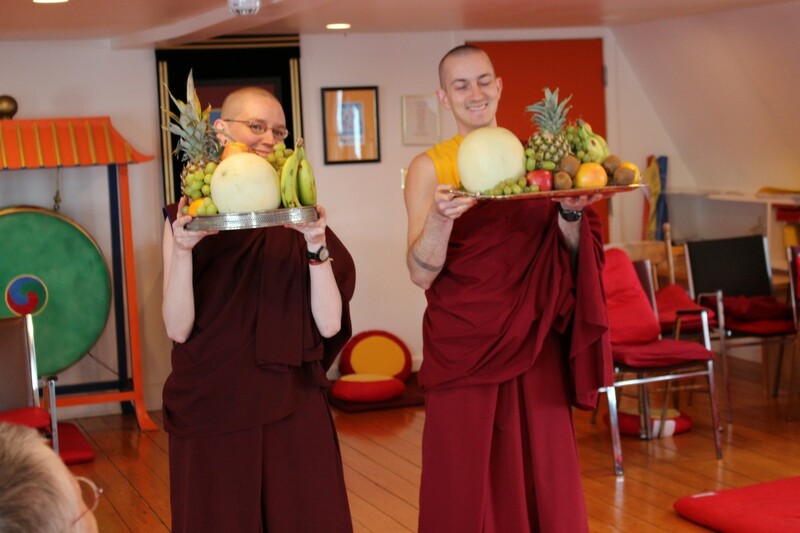 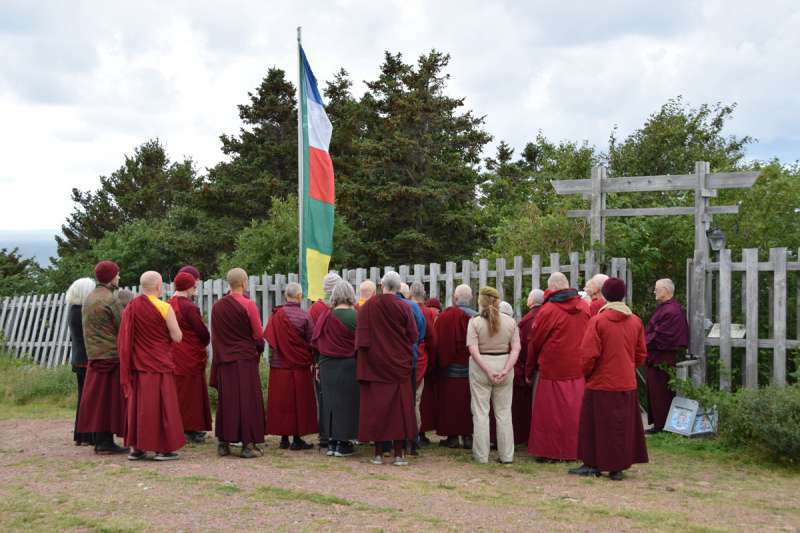 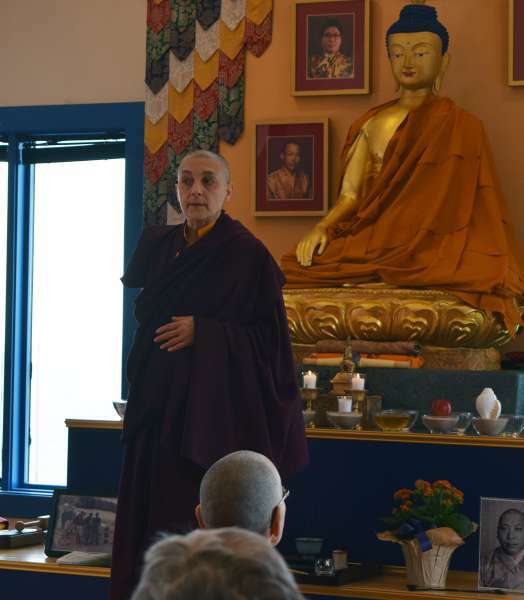 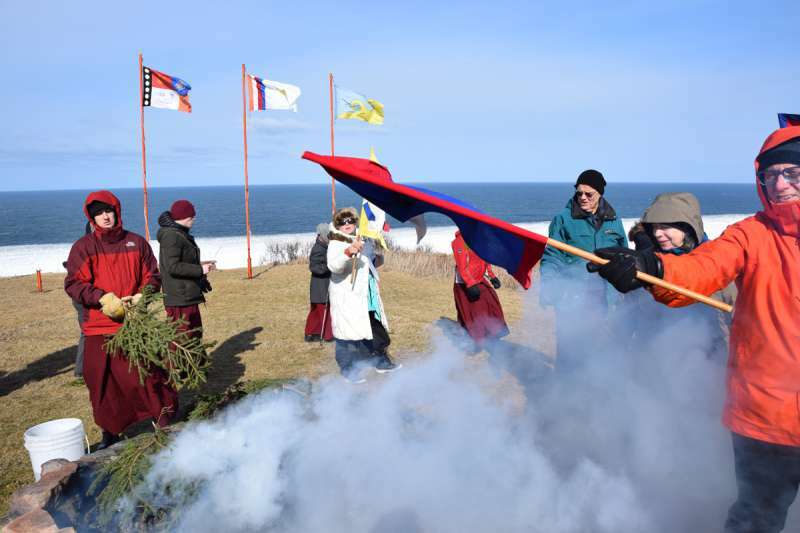 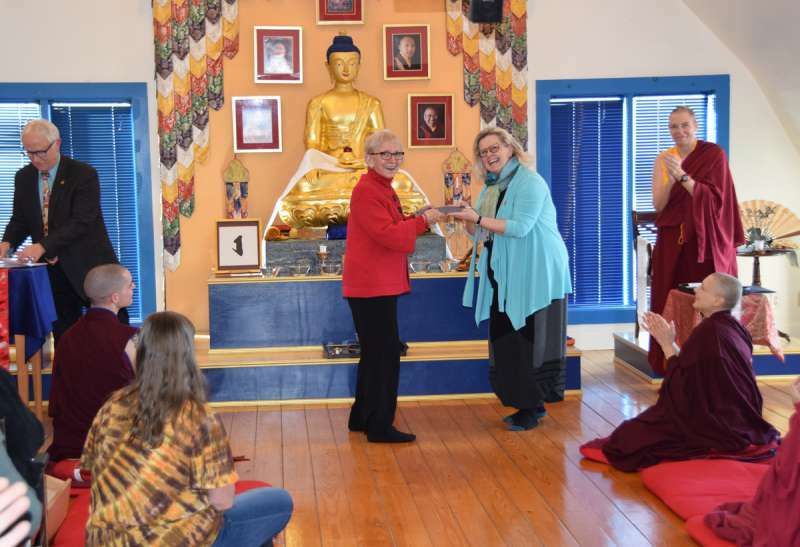 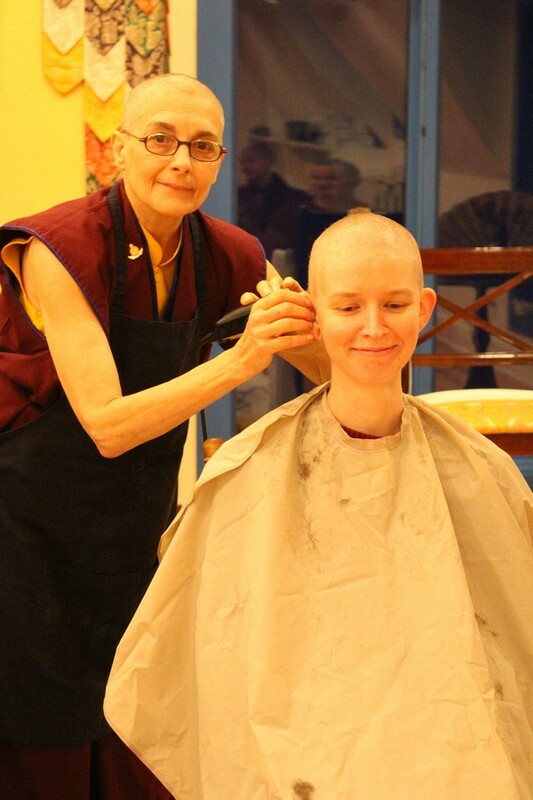 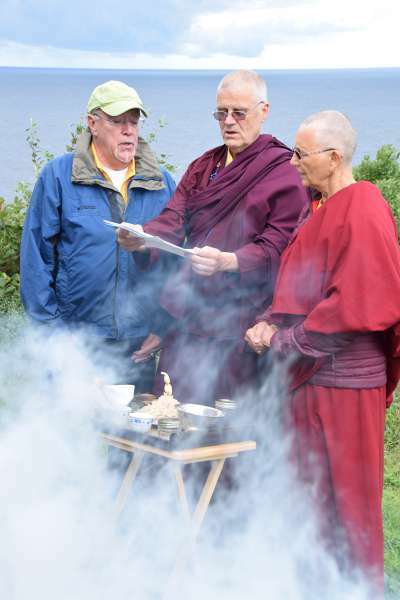 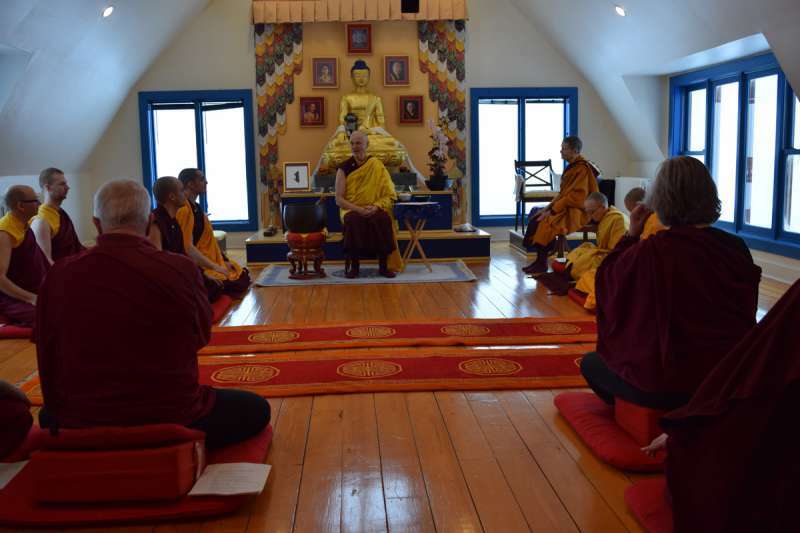 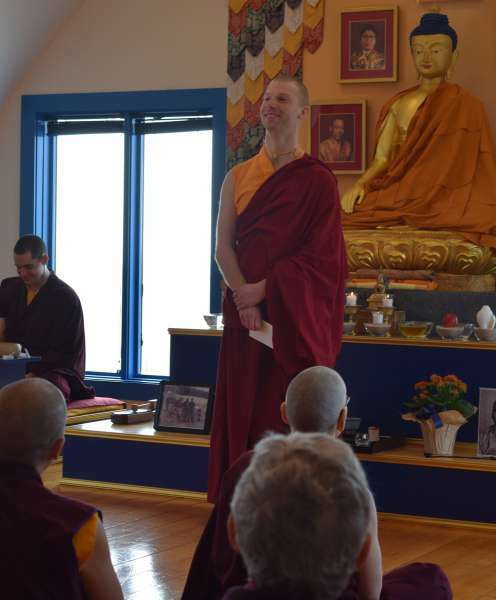 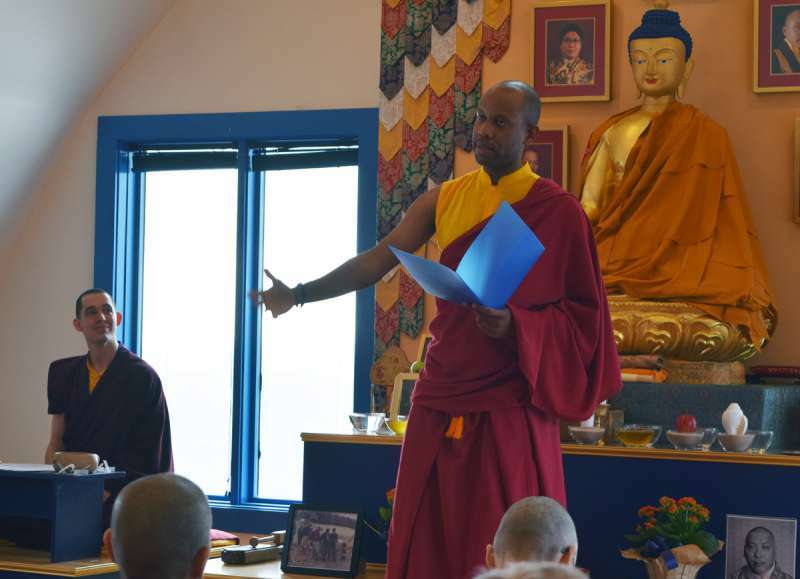 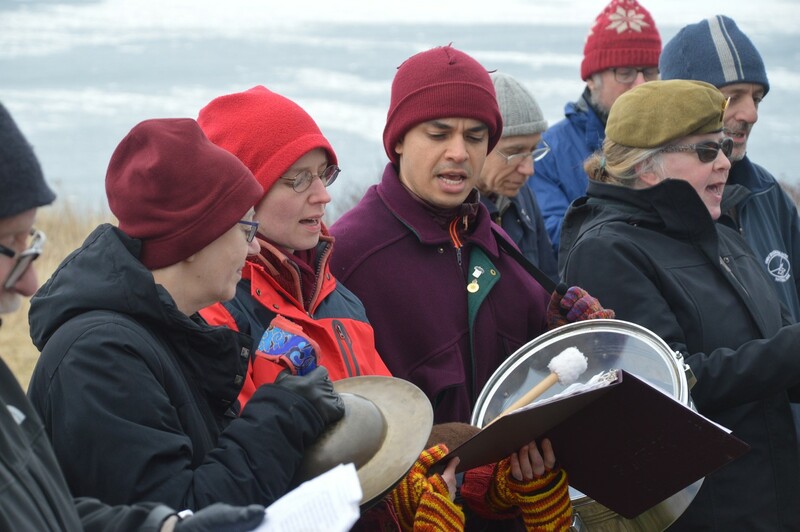 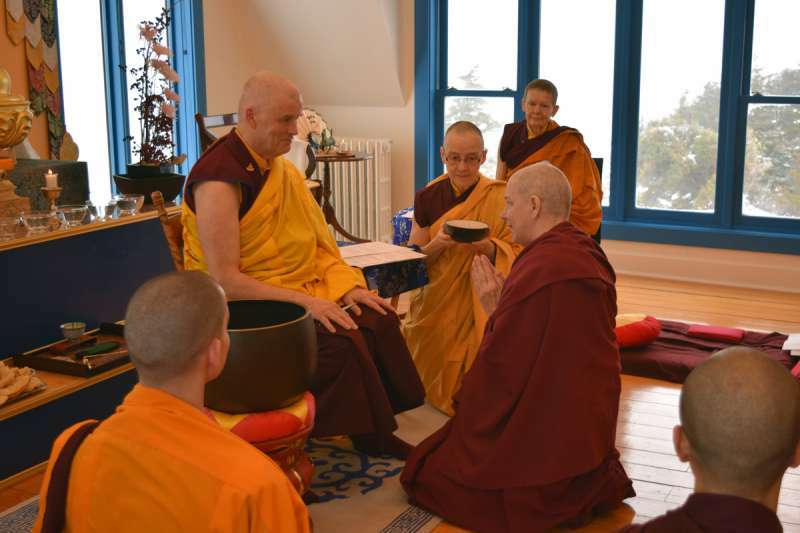 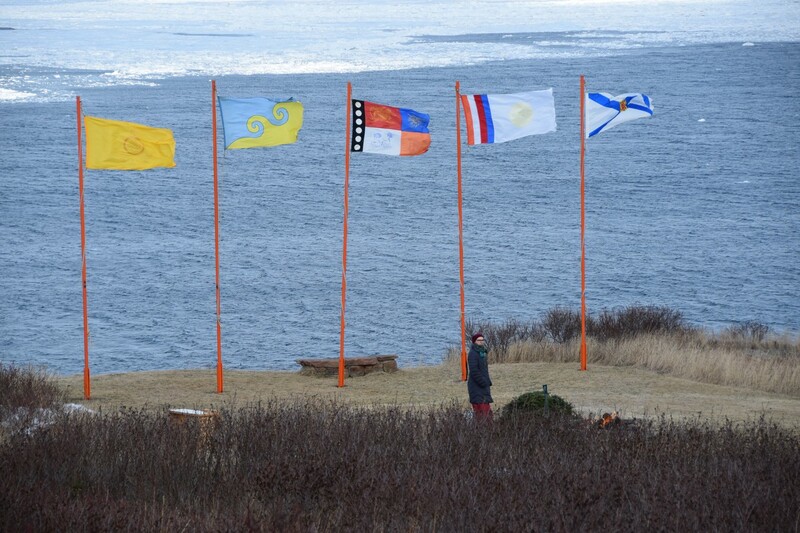 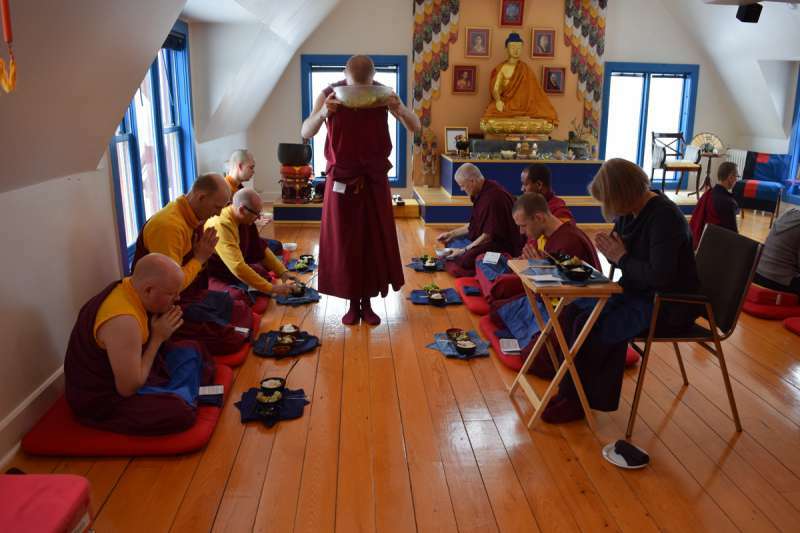 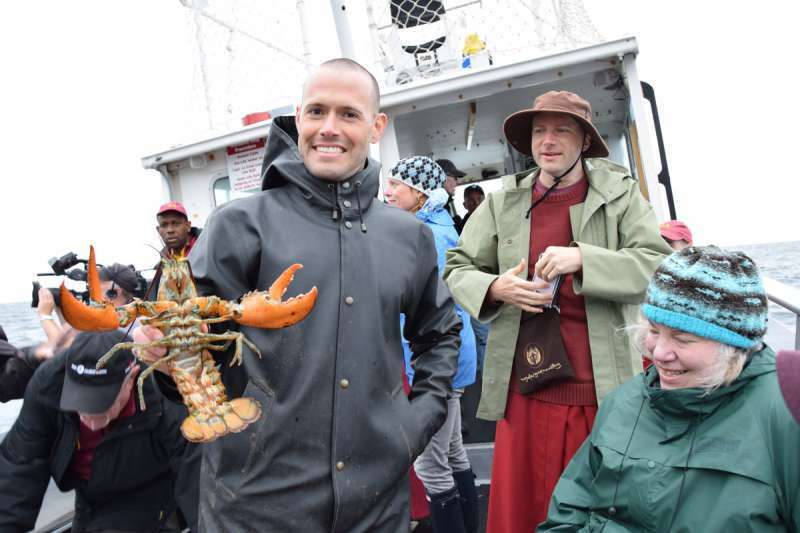 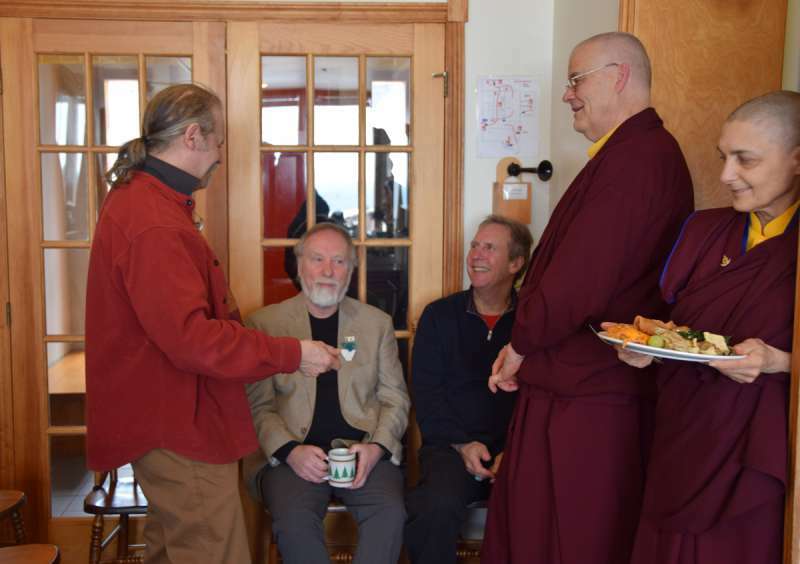 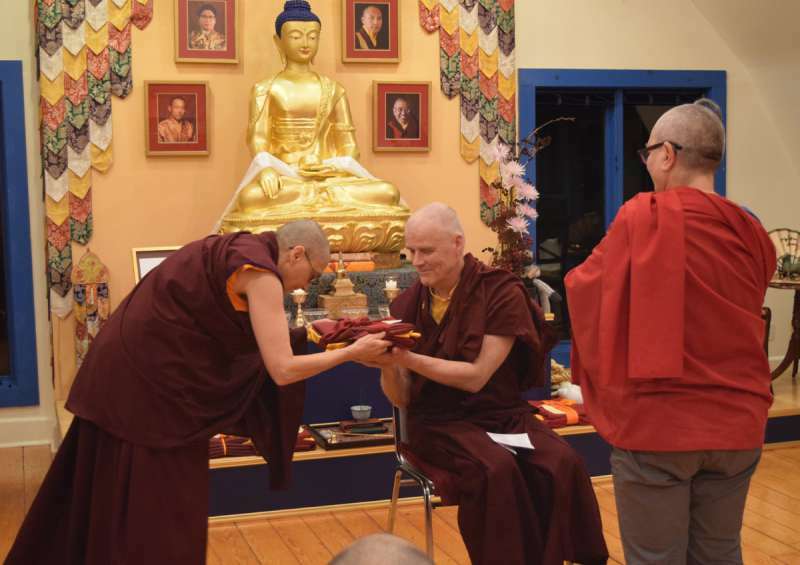 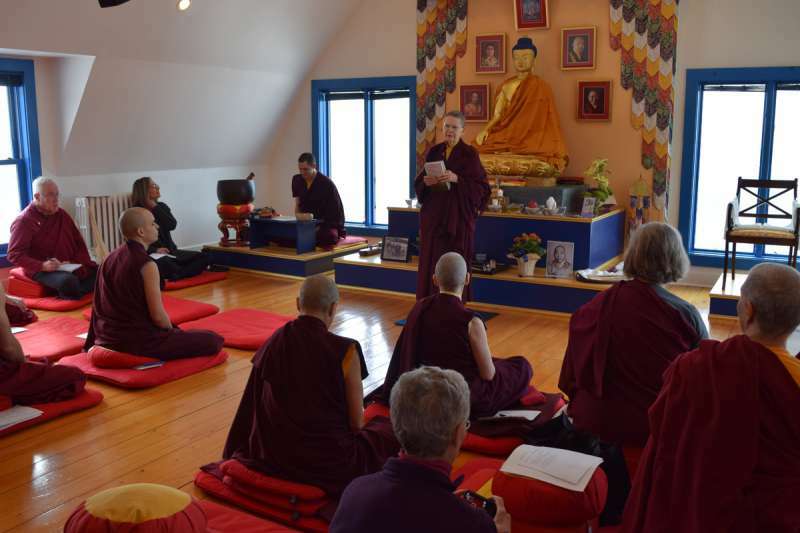 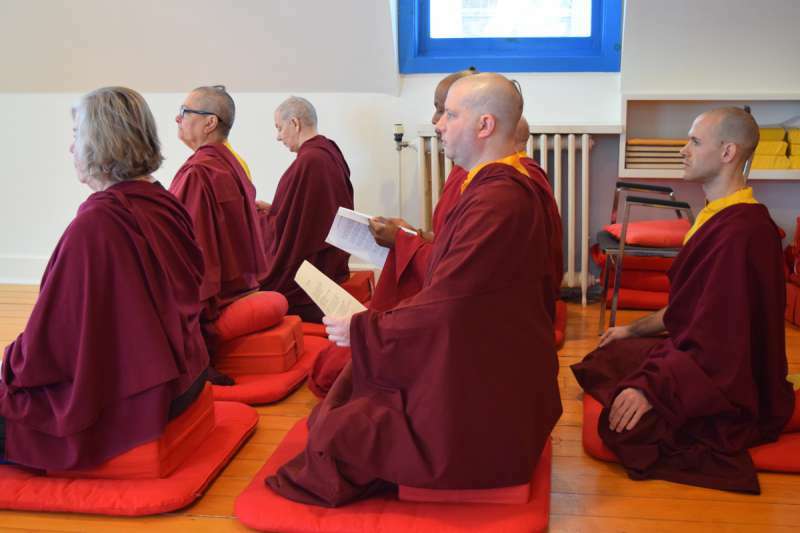 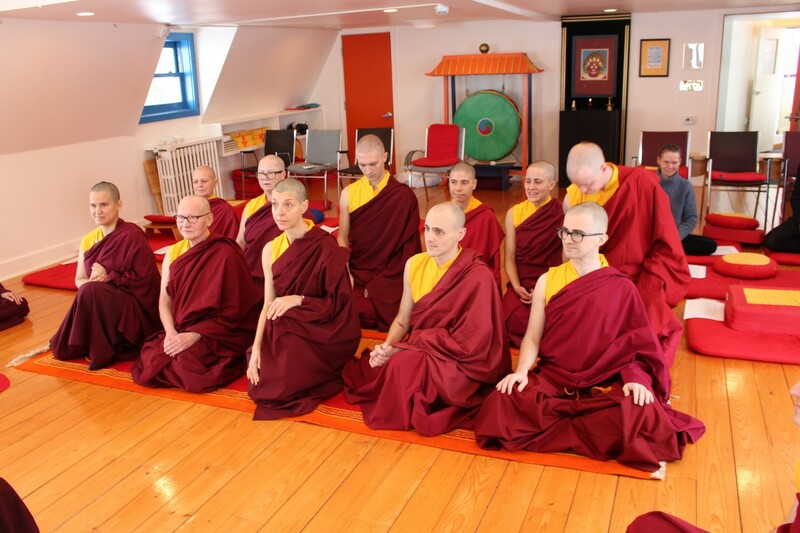 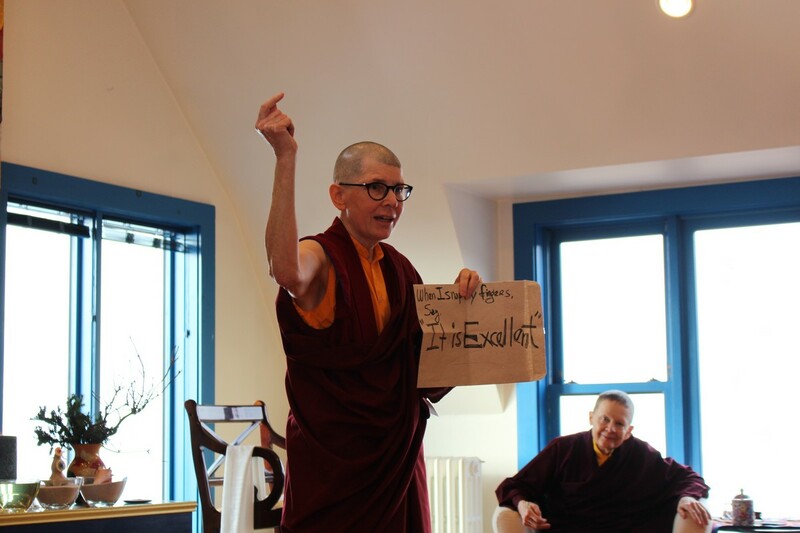 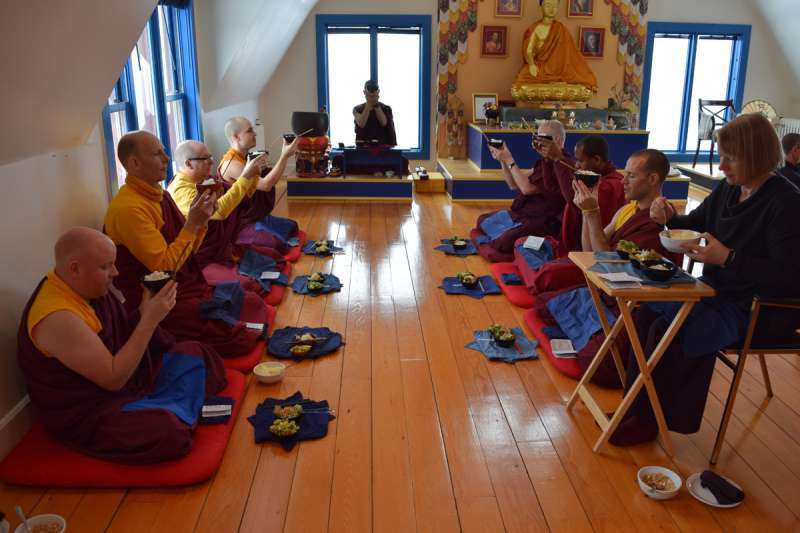 On February 16, Gampo Abbey welcomed sangha members from Cape Breton and beyond to celebrate Shambhala Day. 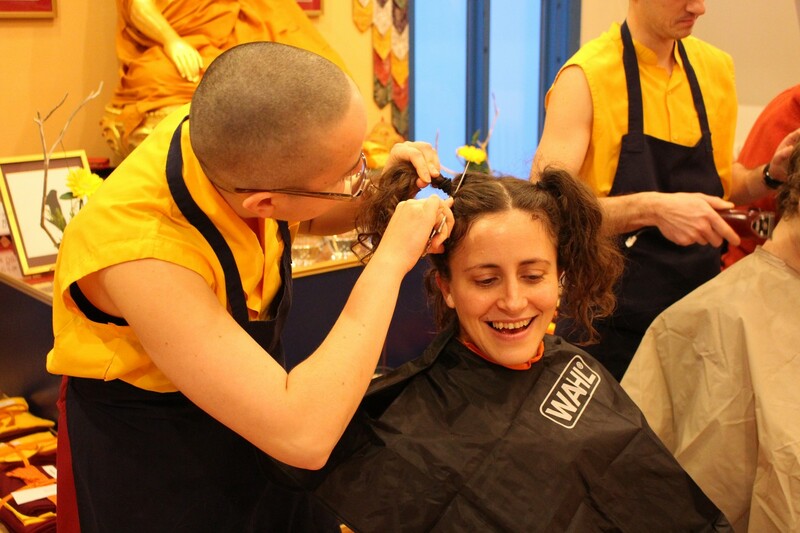 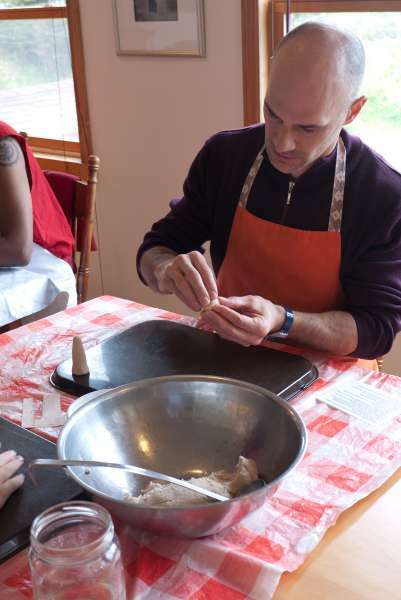 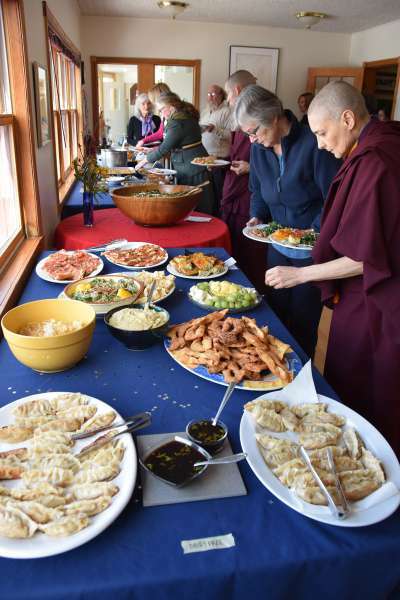 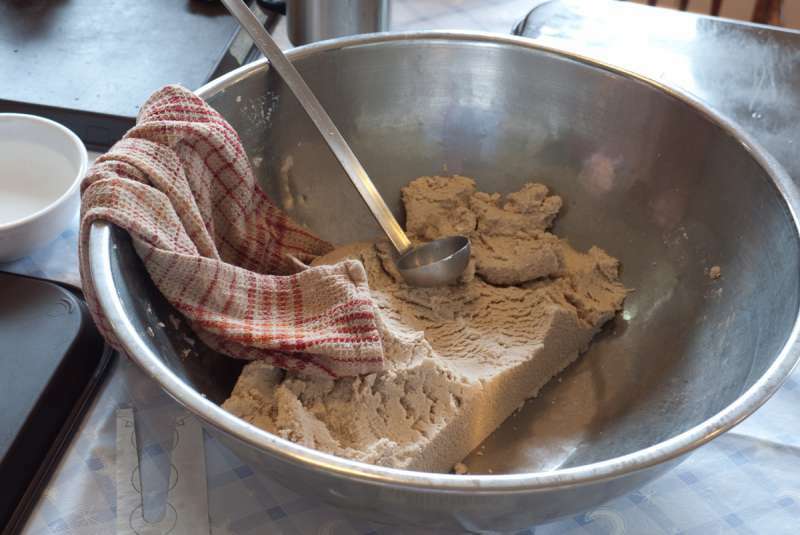 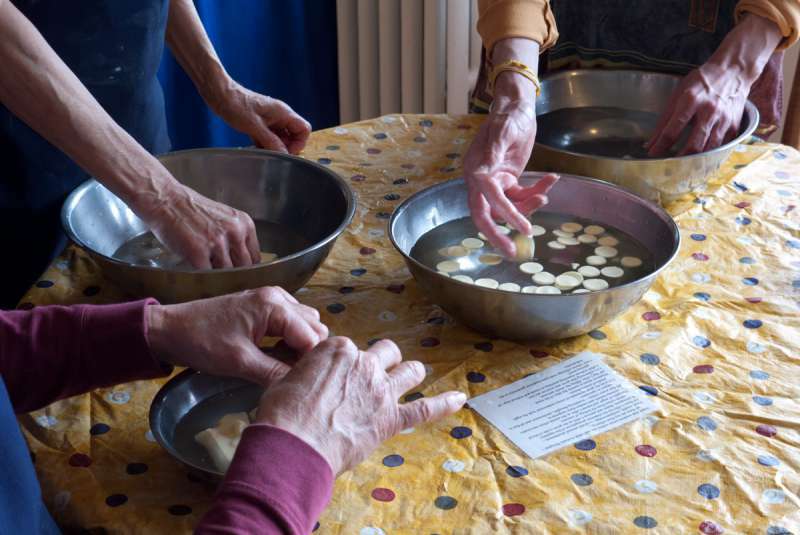 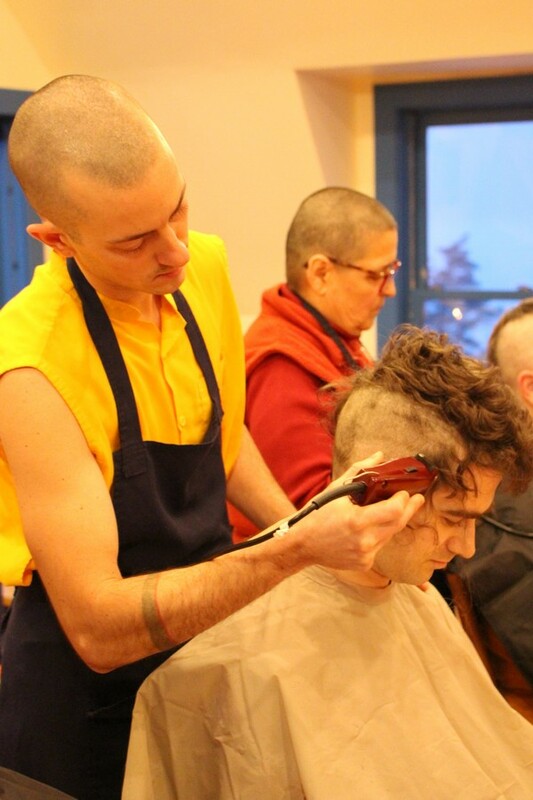 Guests performed the Shambhala Sadhana with the monastic community and took part in a lhasang and potluck brunch. 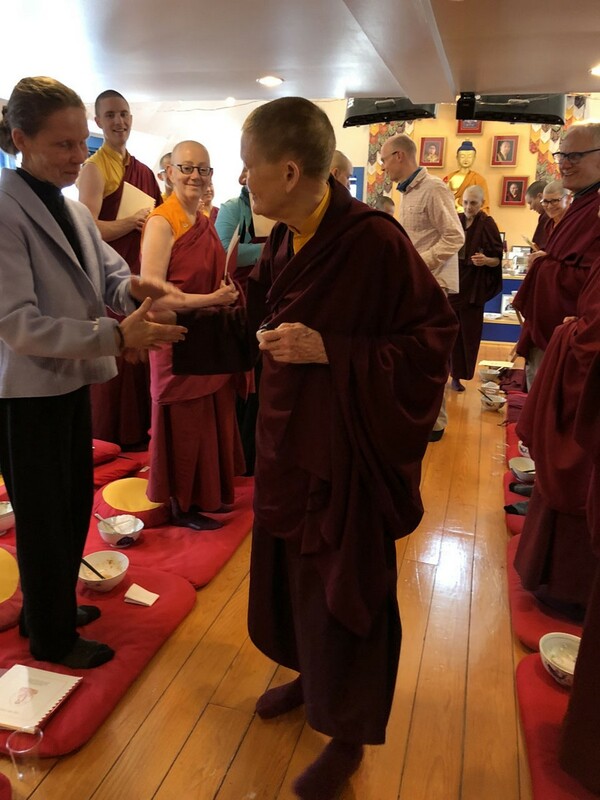 After the feast, Acharya Pema Chödrön greeted the assembly in the main shrine room and distributed 2018 practice calendars. 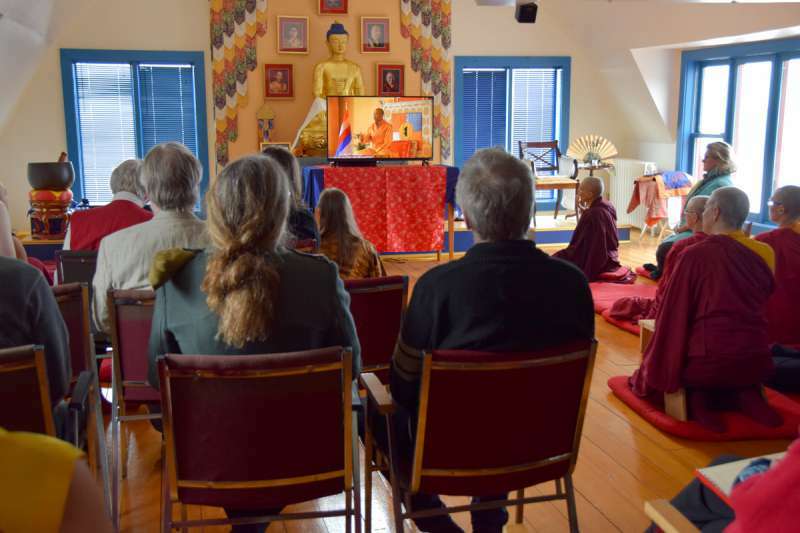 The day concluded with a live broadcast of Sakyong Mipham Rinpoche’s Shambhala Day Address. 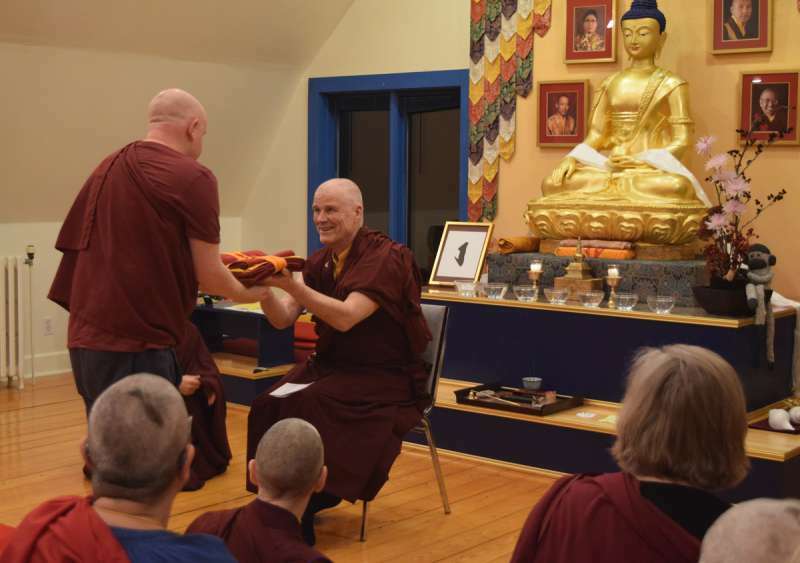 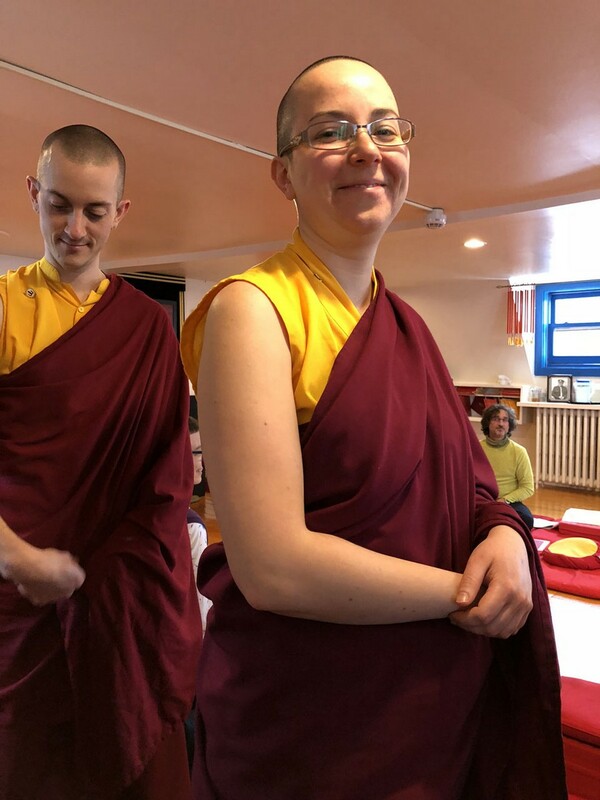 On February 1, 11 new residents took temporary ordination in the Shambhala Monastic Order from preceptor and life monastic Karma Kalsang. 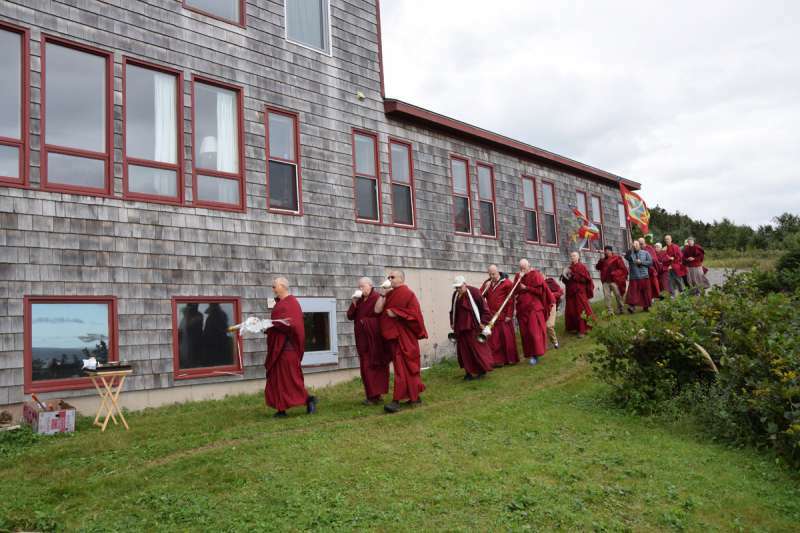 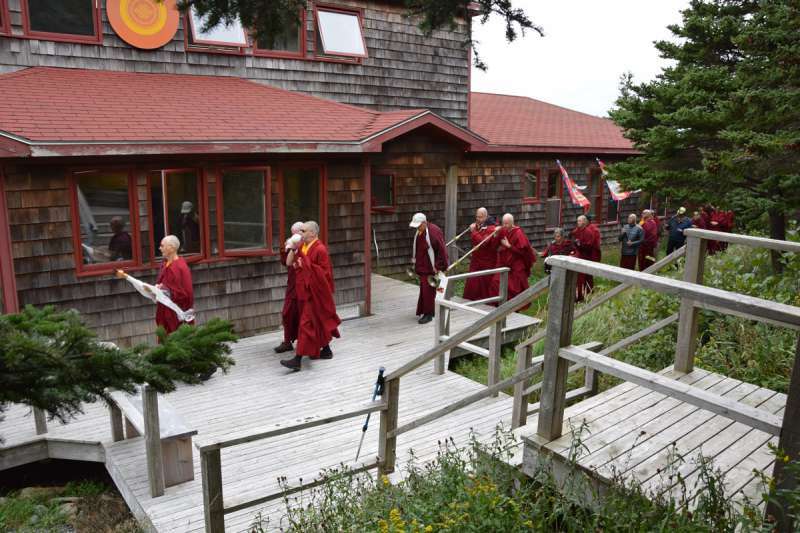 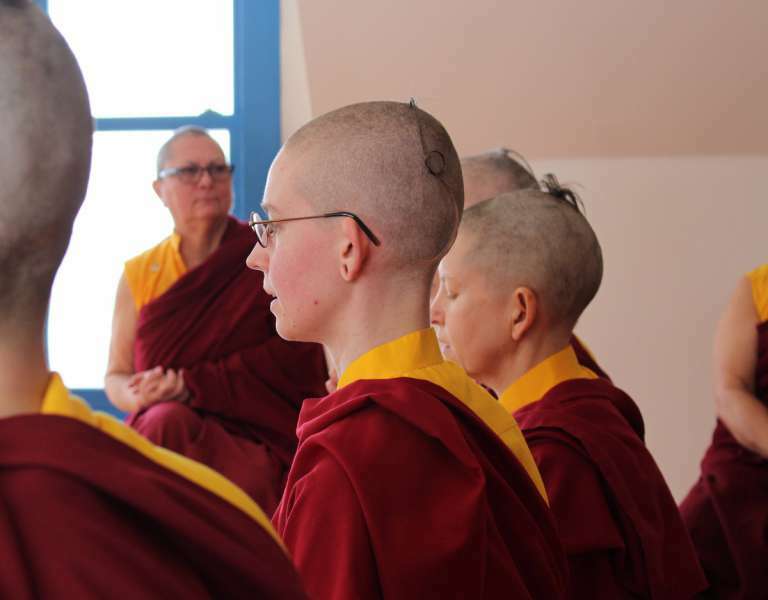 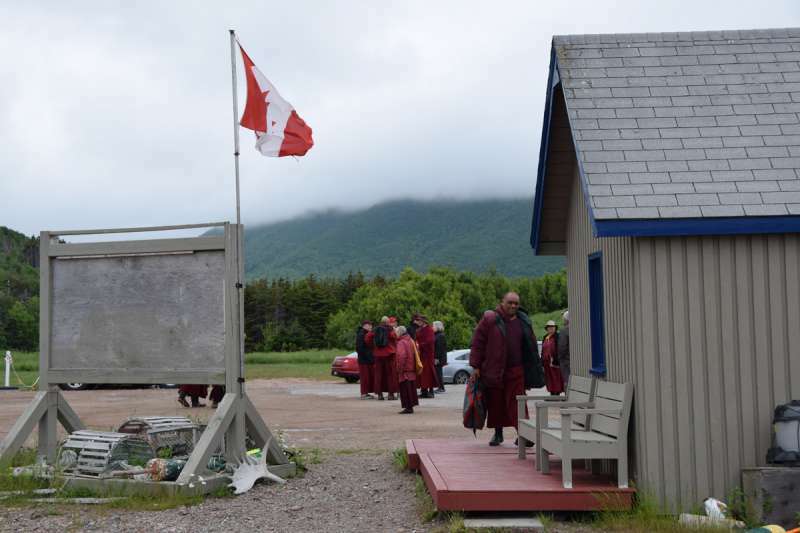 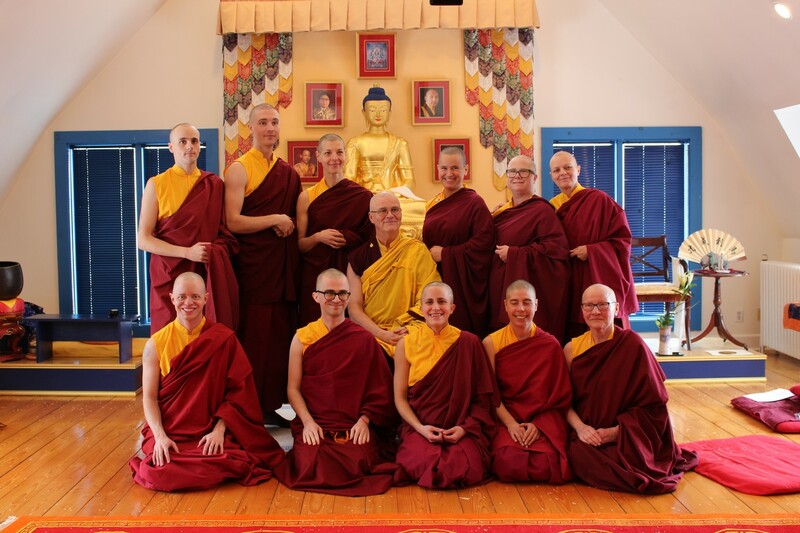 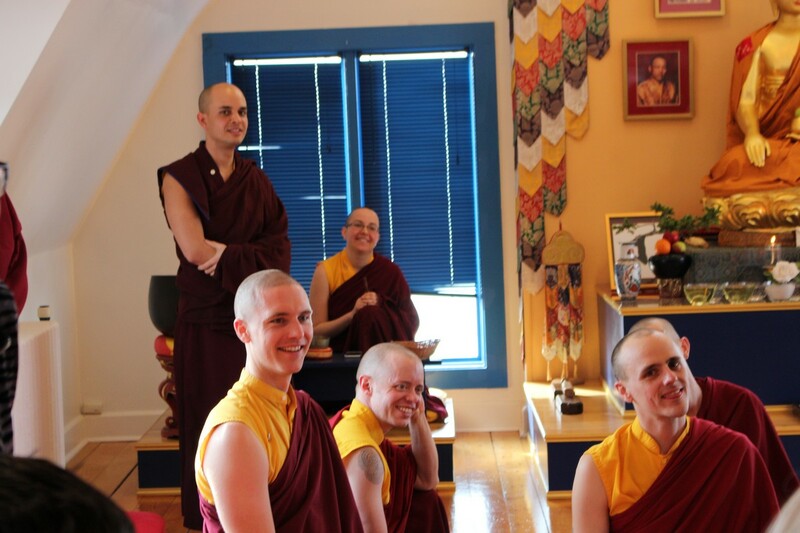 These four monks and seven nuns will live, practice, and study at Gampo Abbey until July 8. 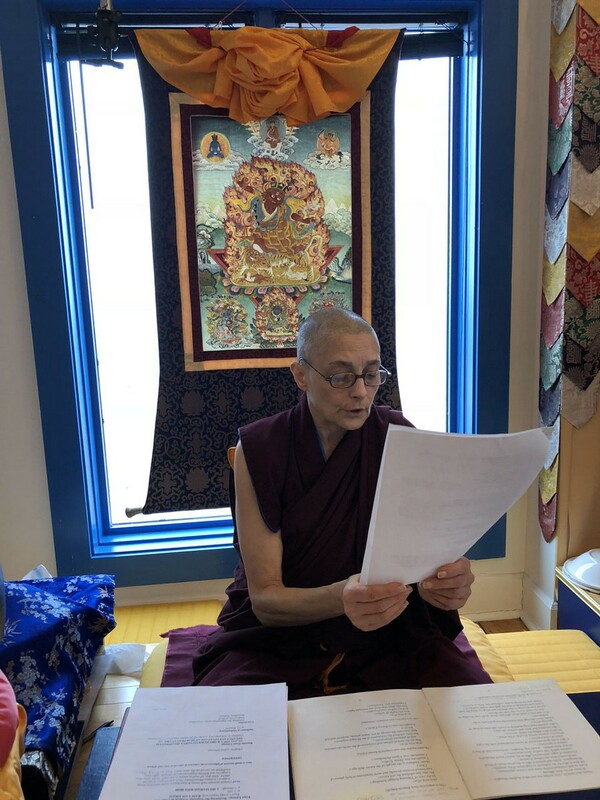 Teachings over the course of the residency will focus on the Shambhala dignity of Dragon, which is connected to wisdom and inscrutability. 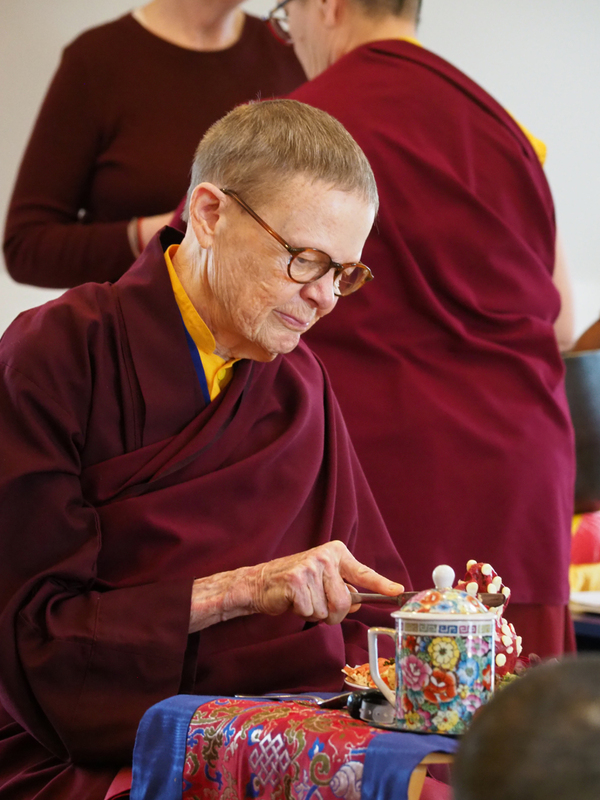 All of the monastics will participate in the Yarne winter retreat taught by Gampo Acharya Pema Chödrön, who will explore the Tibetan Buddhist teachings on bardo, the transitional period between death and rebirth. 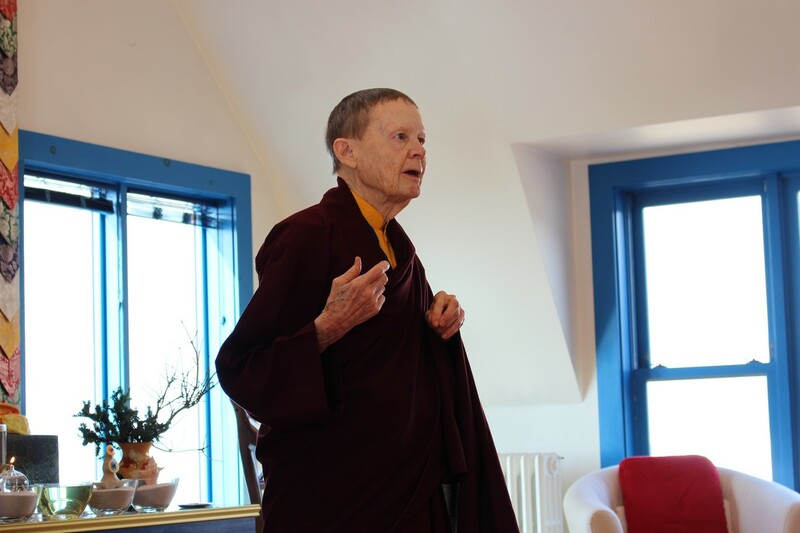 Gampo Acharya Pema Chödrön was in a year long retreat in 2017, as a result she was not available to teach during the 2017 Yarne. 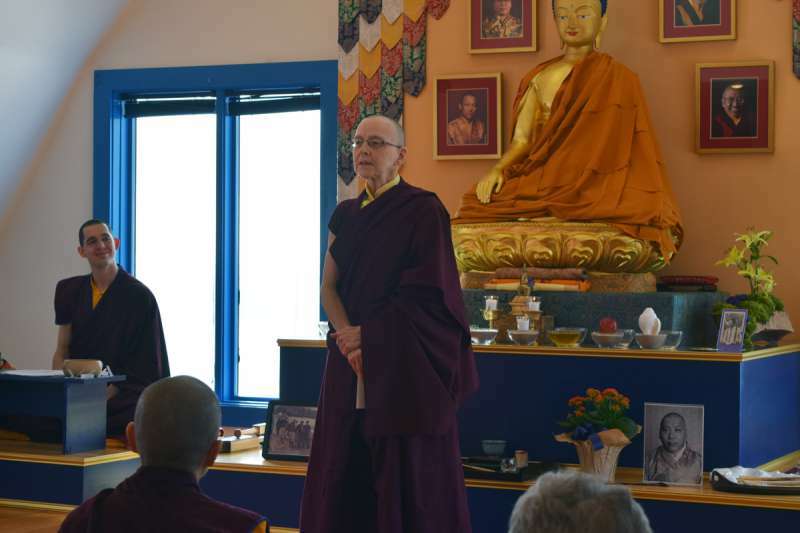 Sakyong Mipham Rinpoche, invited Khenpo Gawang Rinpoche to come and teach at Gampo Abbey during the 2017 Yarne. 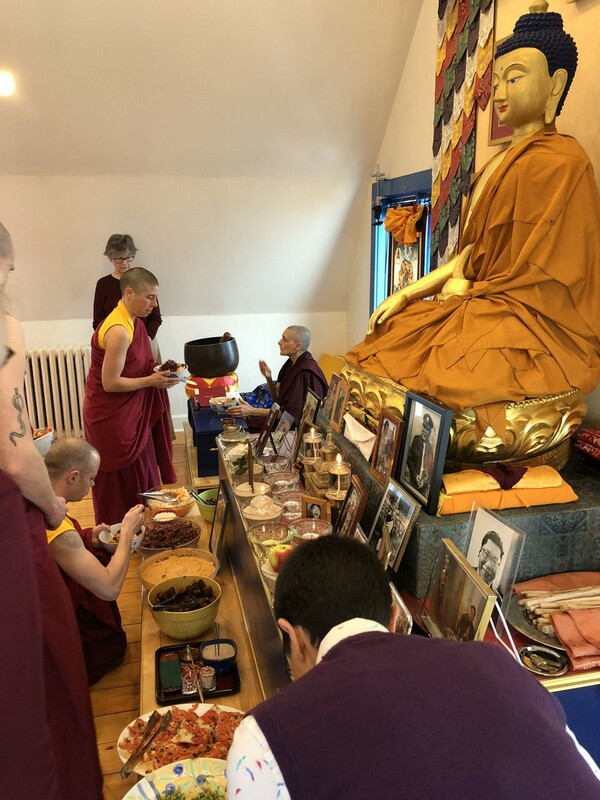 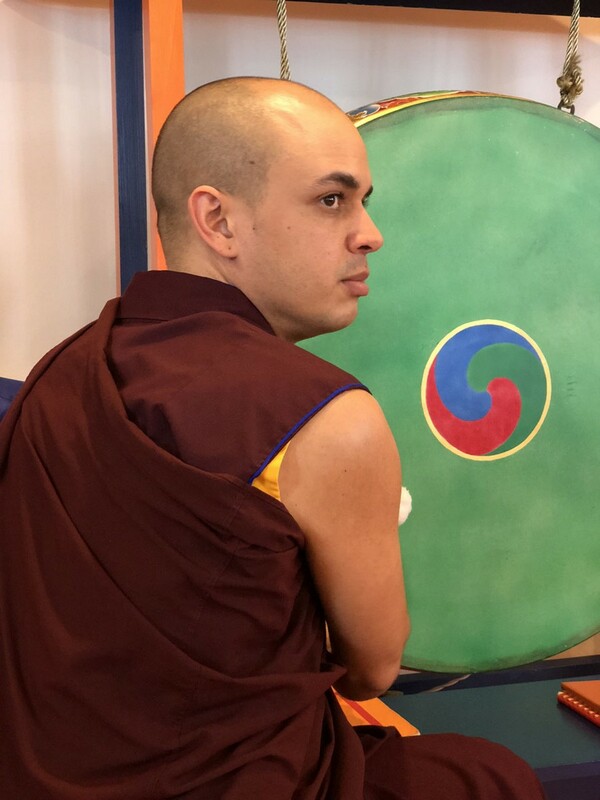 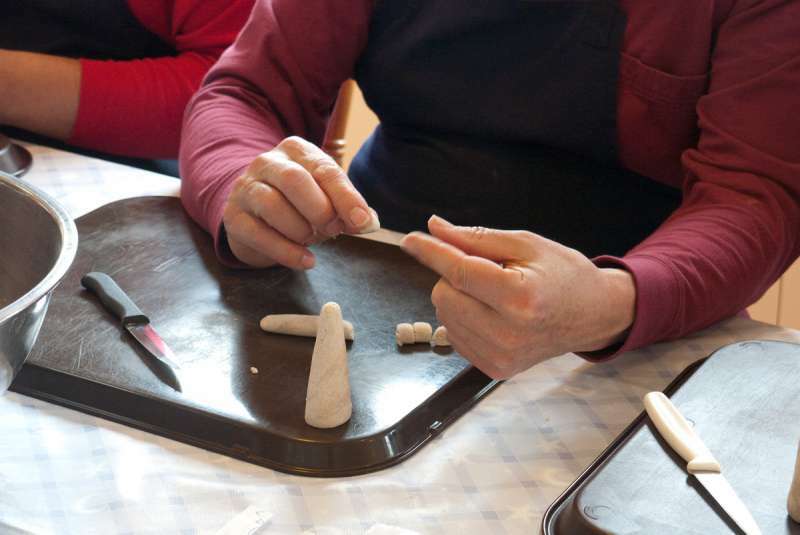 Khenpo Gawang came to the Abbey in early March for 3 weeks and taught extensively on the mahayana teachings known as the Four Seals – Impermanence, Multiplicity, Suffering and Emptiness. 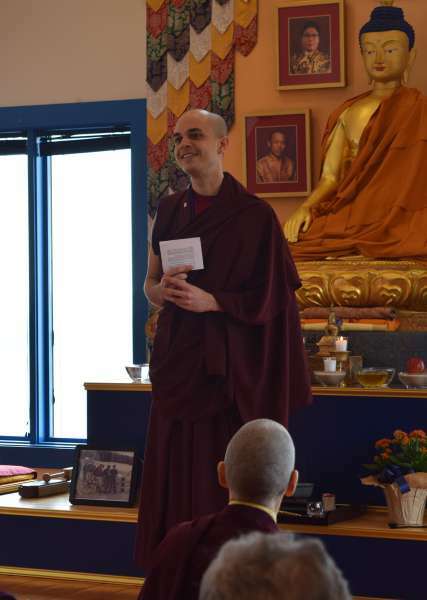 He drew from his recently published book Your Mind is Your Teacher – Self-Awakening through Contemplative Meditation. 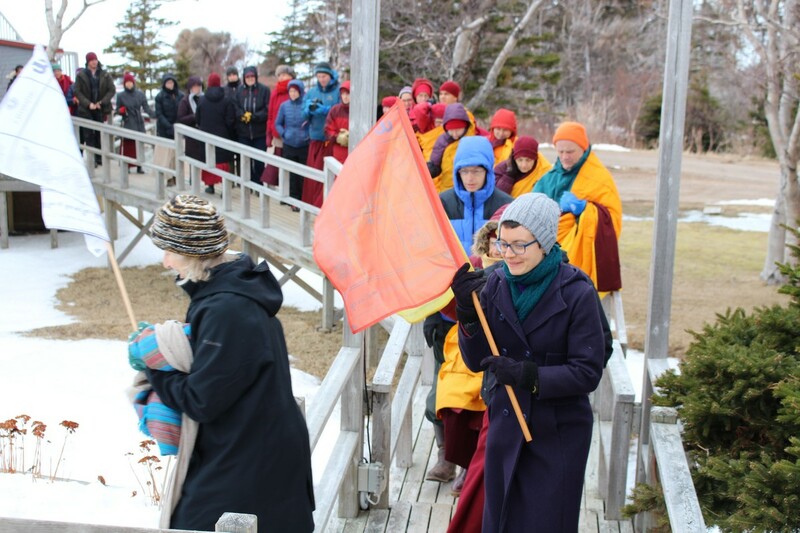 The Gampo Abbey monastic community and members of the Cape Breton sangha celebrated the beginning of the Year of the Fire Bird on Shambhala Day February 27, 2017. 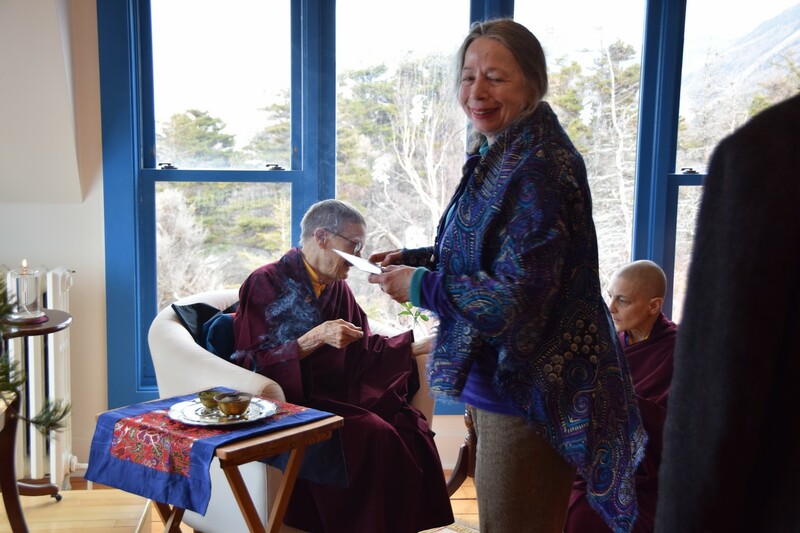 The day began with a lhasang to bring down the positive energy for the year, followed by a celebratory pot luck feast with good conversation between friends and watching of the annual Shambhala Day address by Sakyong Mipham Rinpoche from Boulder Colorado. 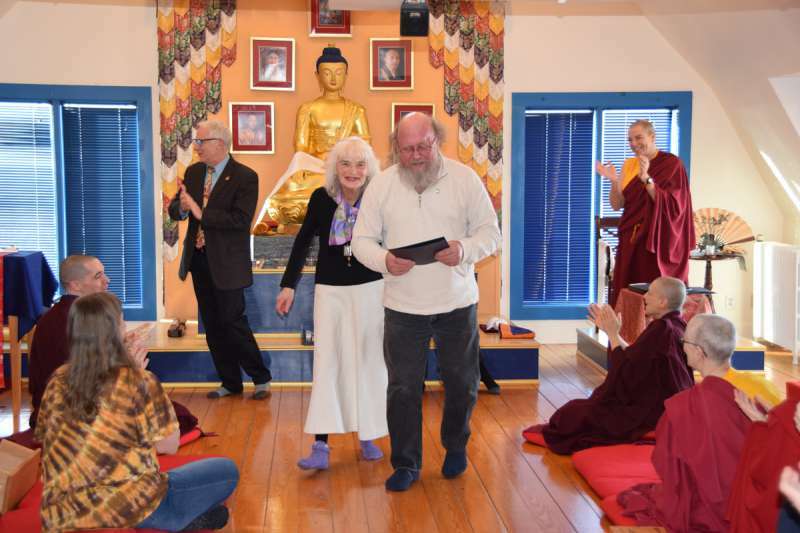 Shambhala Day closed with presentations of community service pins to local sangha members by Co-Directors Janet Whelan and Ron Renz. 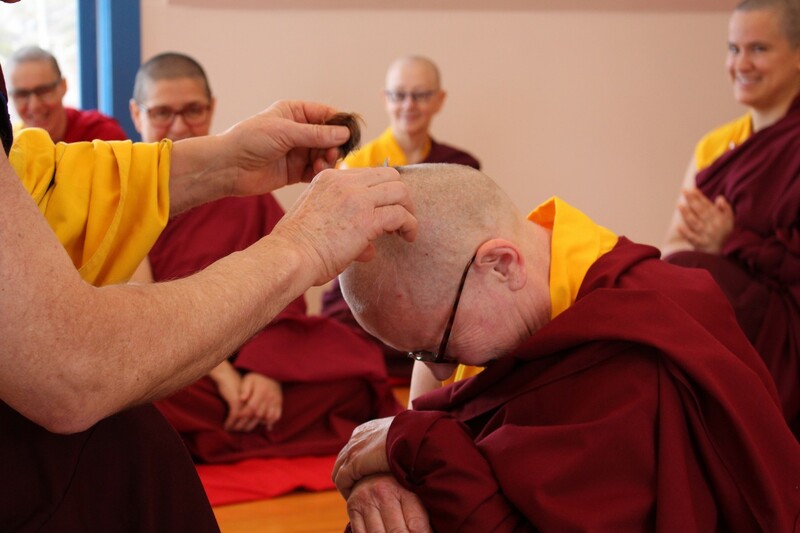 At the request of Chögyam Trungpa Rinpoche, Venerable Thrangu Rinpoche introduced temporary ordination (Tsanchö Genyen/Upasaka Brahmacharya ordination) to give Dharma practitioners an opportunity to experience monasticism without making a lifetime commitment. 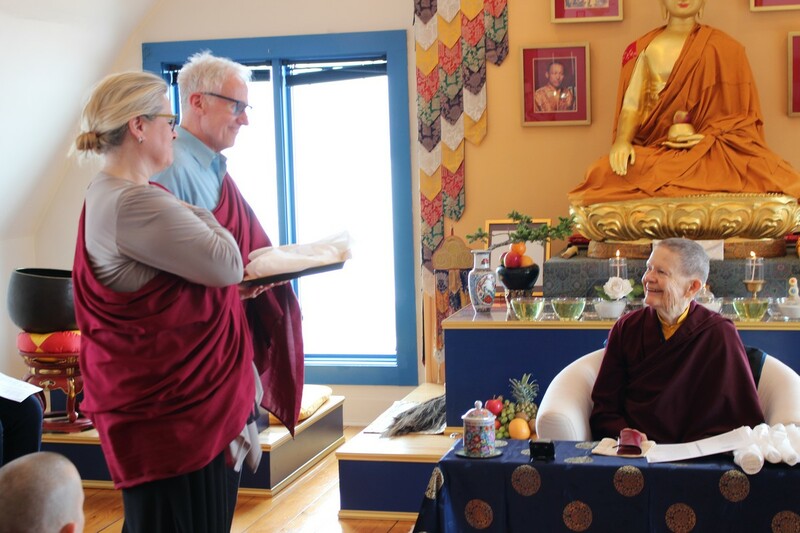 The prerequisite is the Refuge Vow. 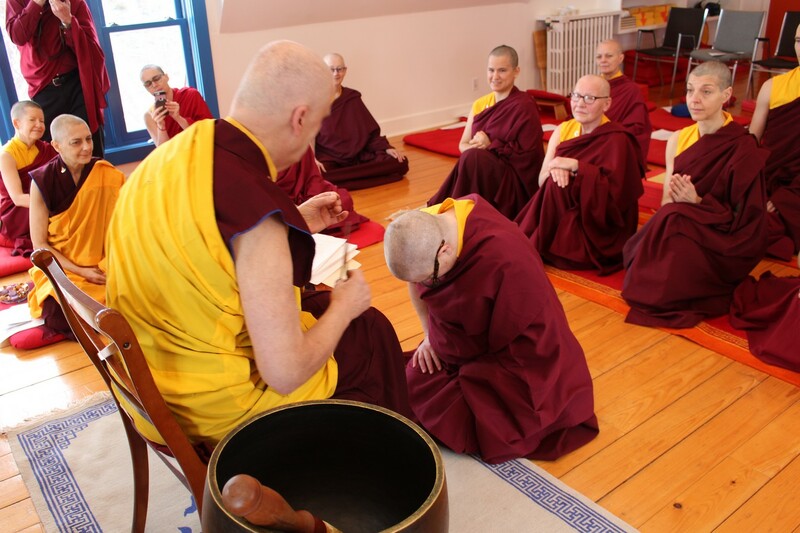 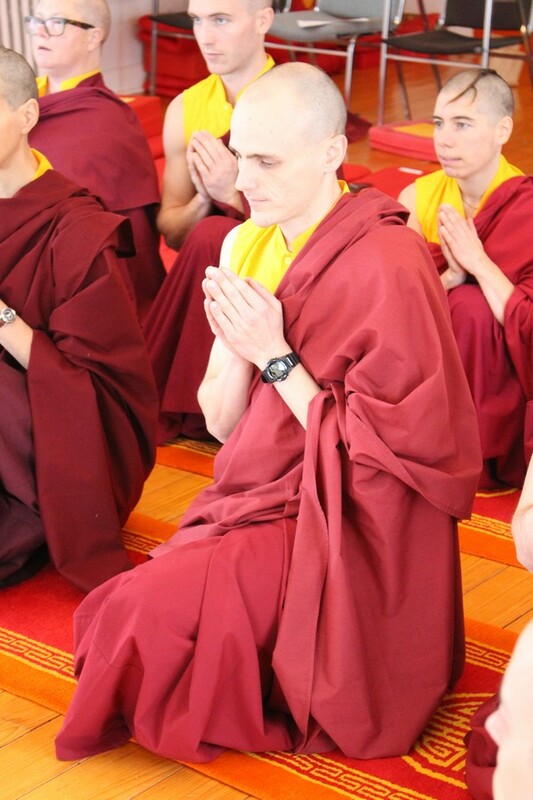 Temporary ordination is offered within the context of our monastic residencies from the Shambhala Monastic Order. 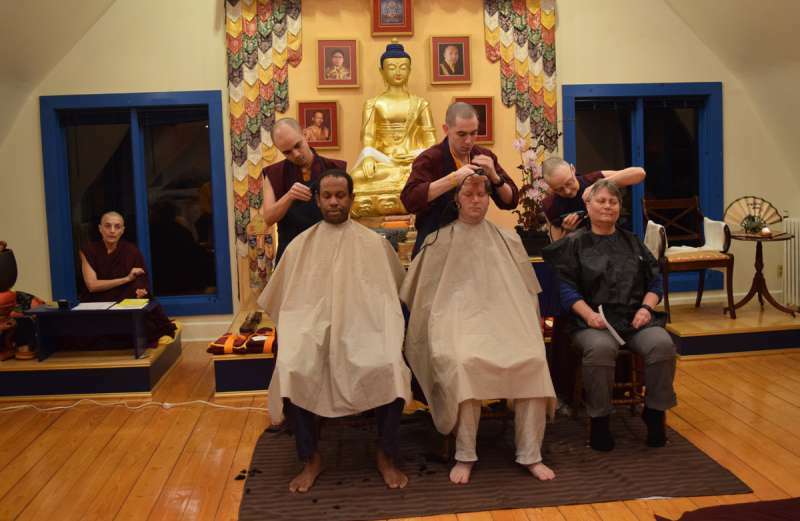 The evening before the temporary ordination, all program participants join in the hair cutting ceremony. 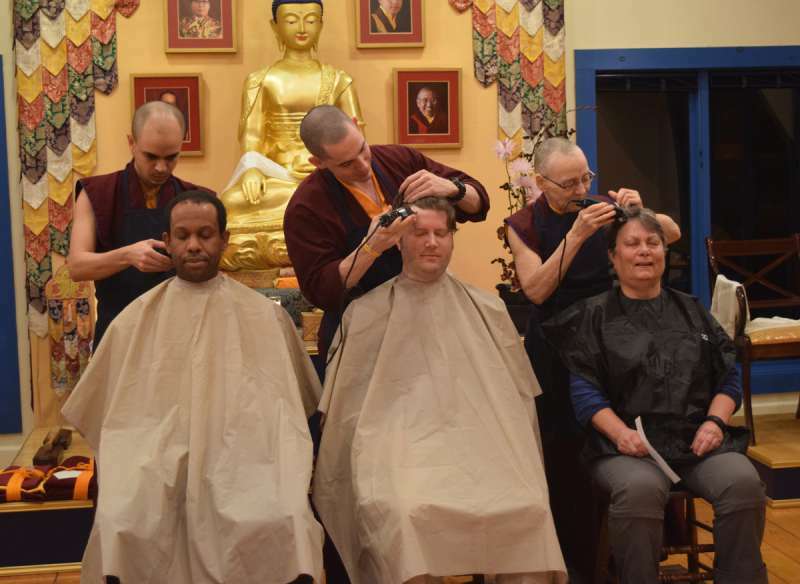 This year’s hair cutting ceremony on February 14, 2017 had the added challenge of occurring during a storm and power outage. 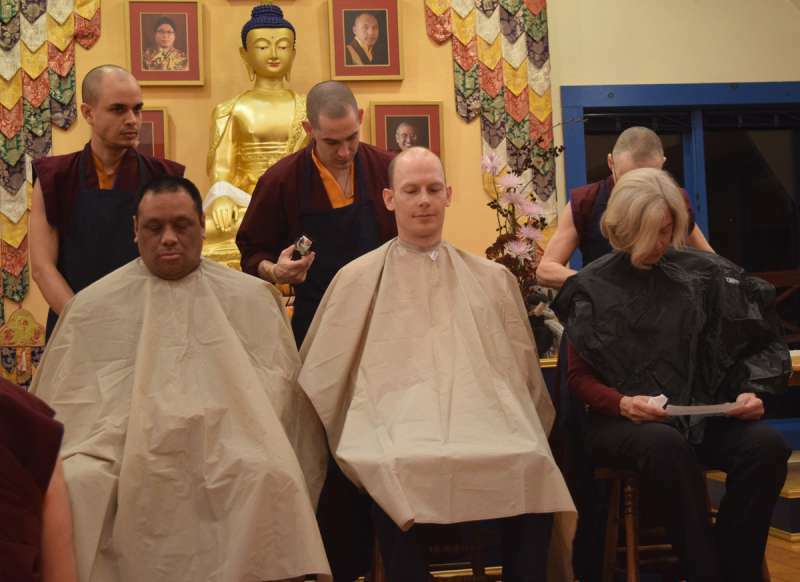 Not to be deterred by such obstacles a generator was set up to provide electricity to run the electric hair clippers used during the hair cutting ceremony. 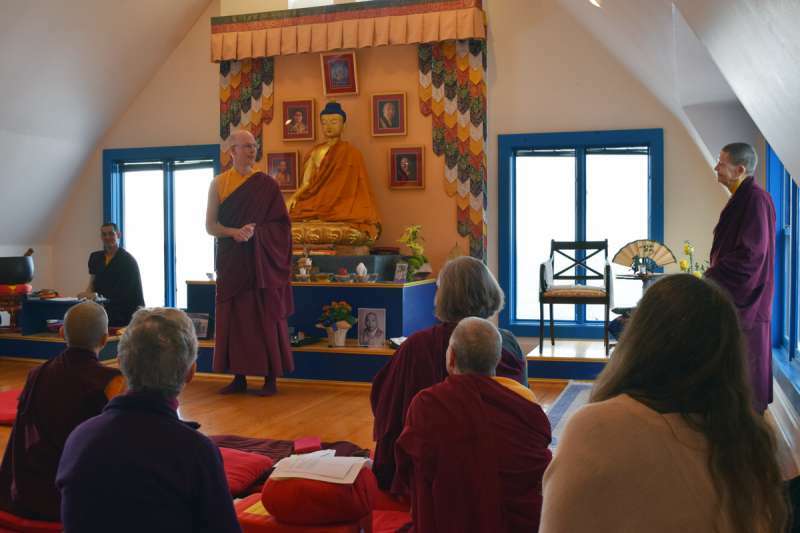 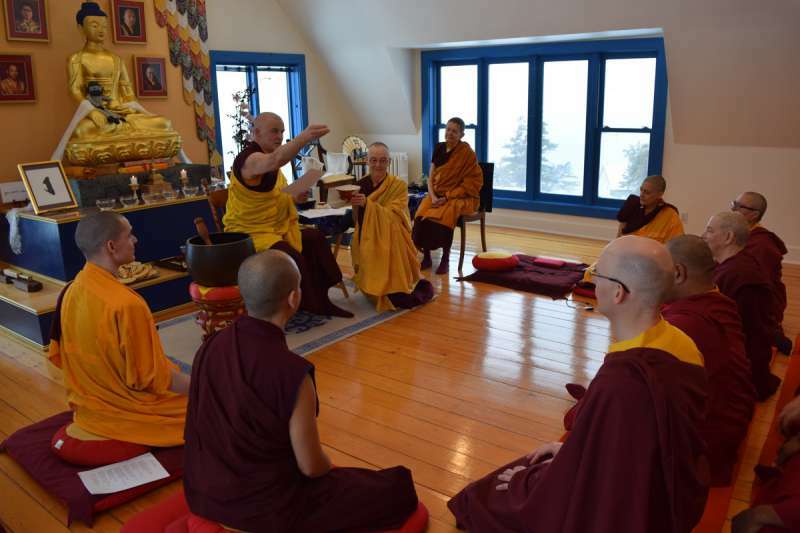 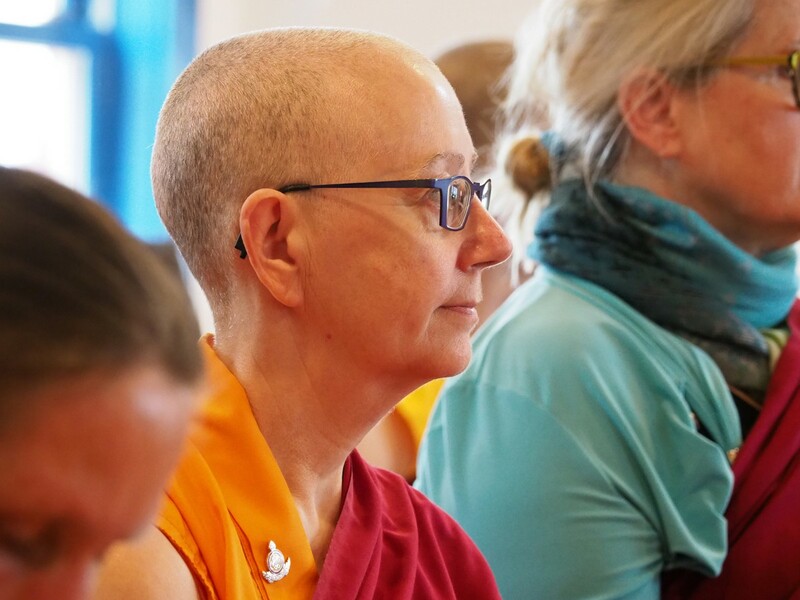 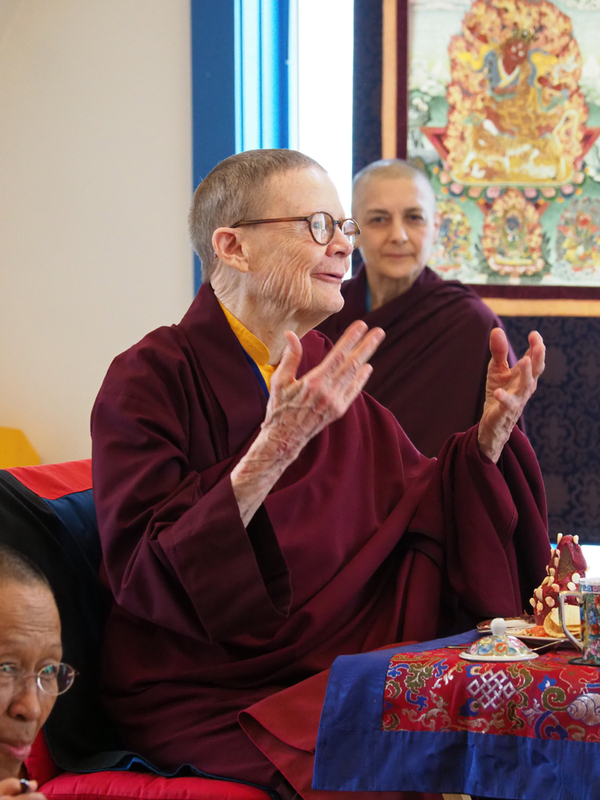 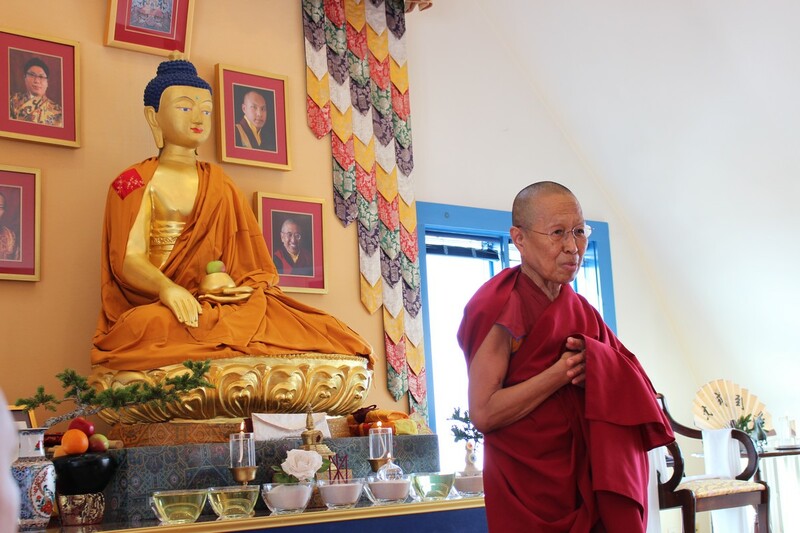 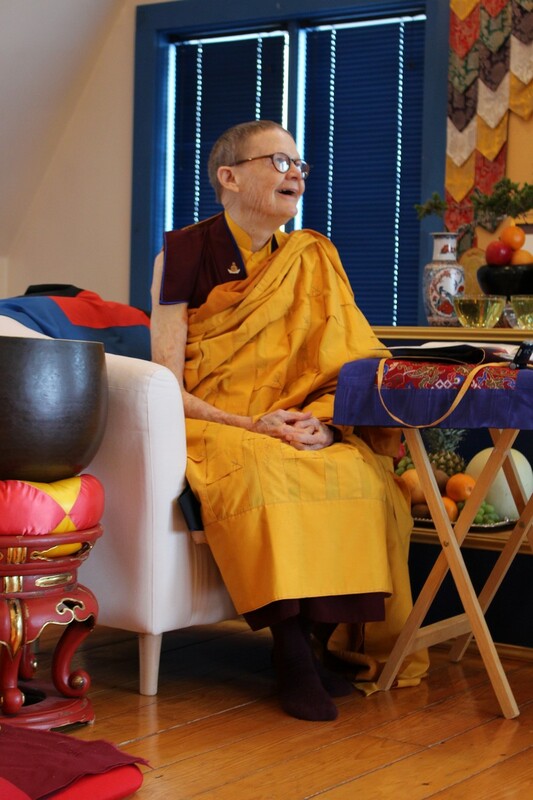 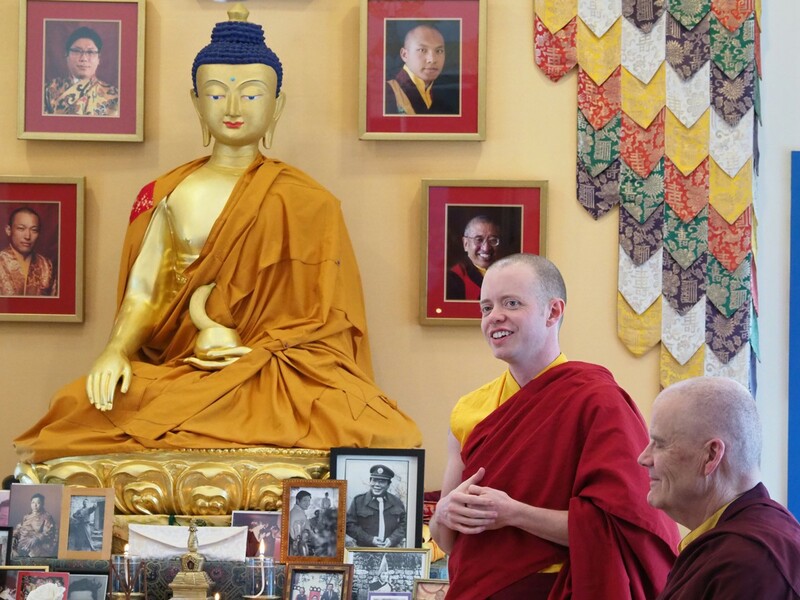 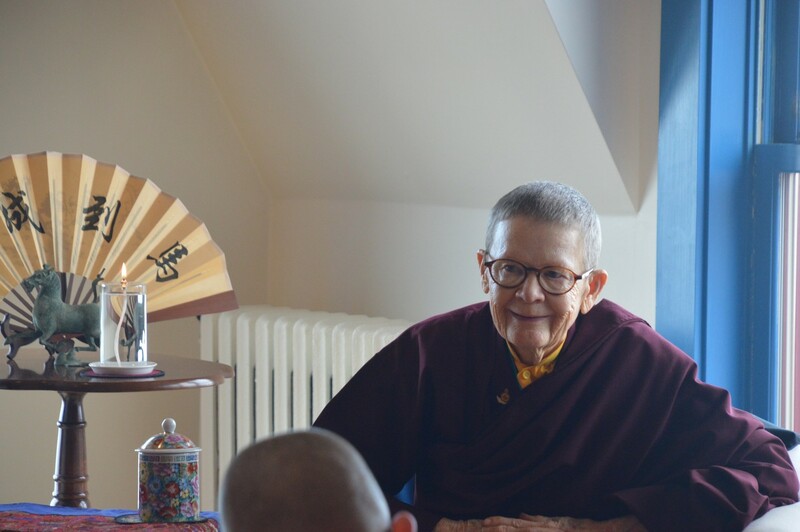 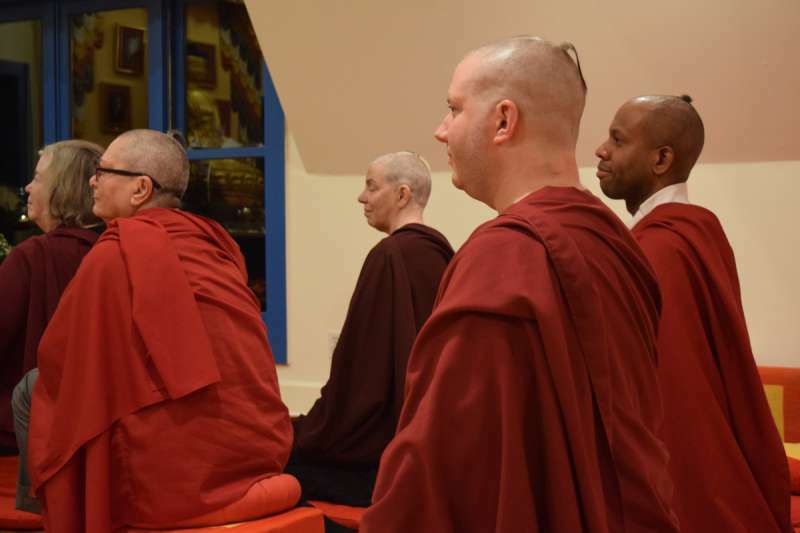 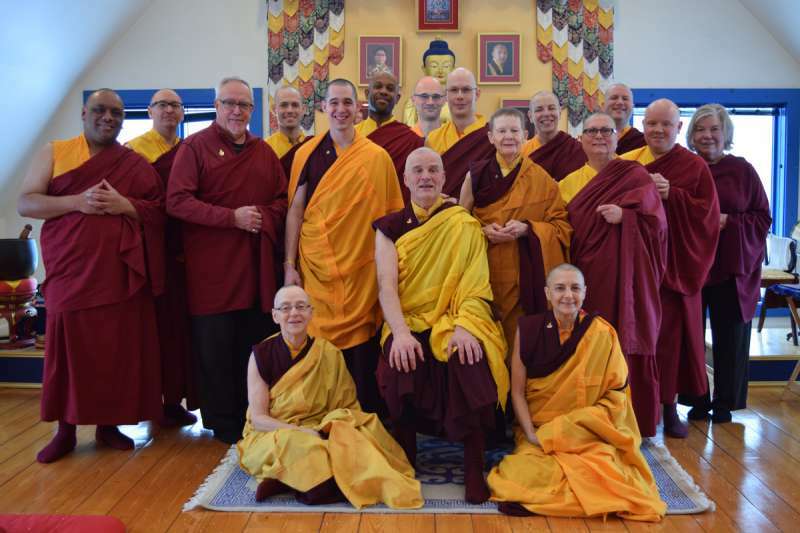 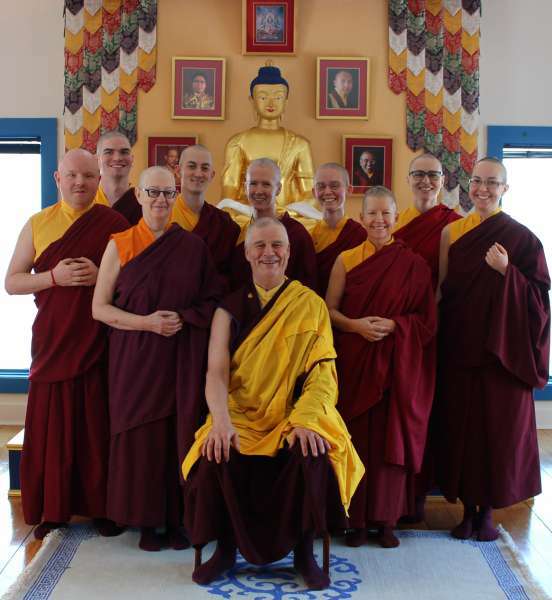 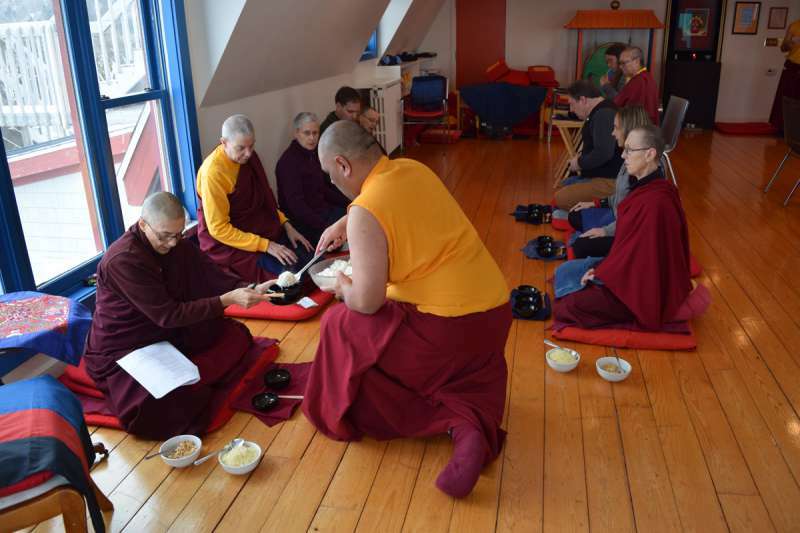 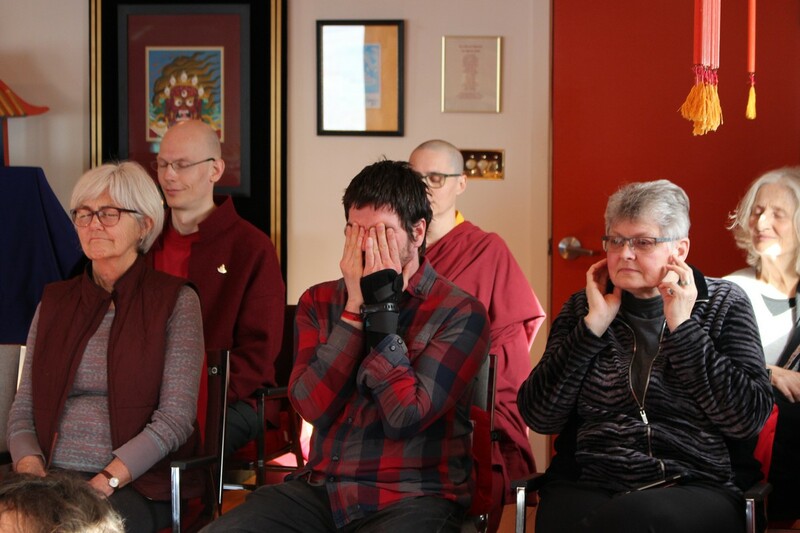 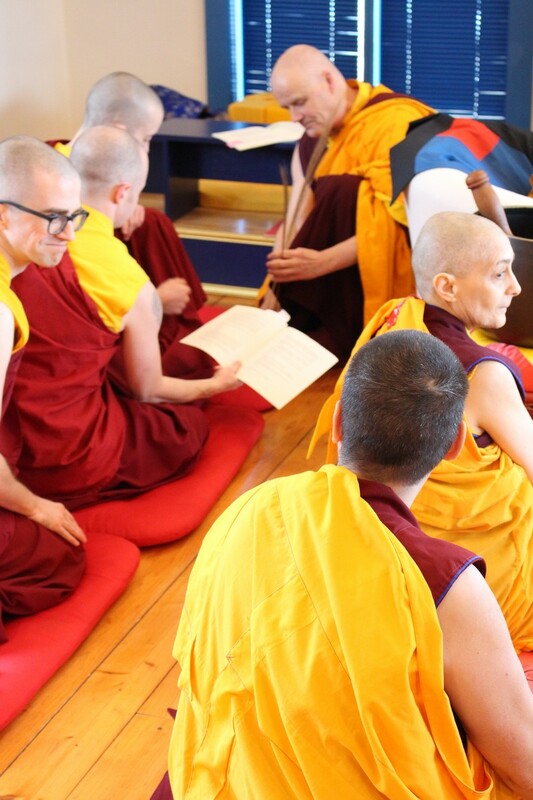 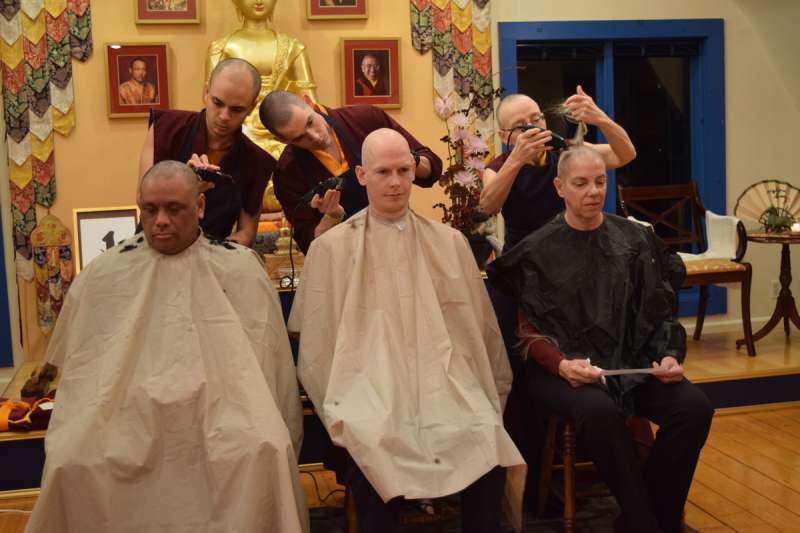 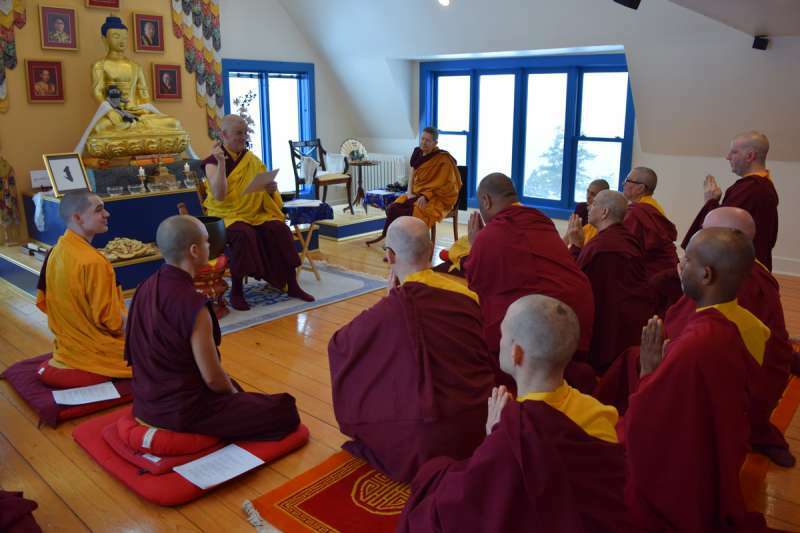 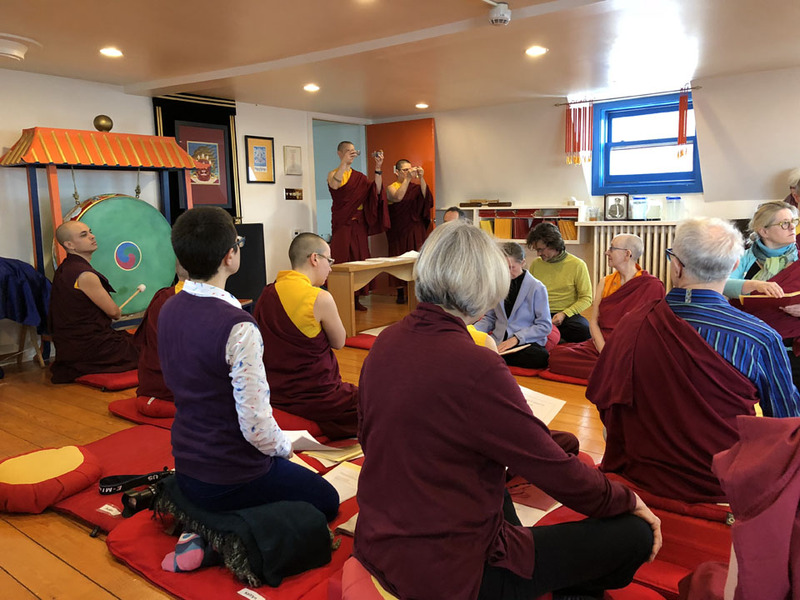 February 2 – 5 residents at Gampo Abbey traveled to Halifax joining the wider community at the Halifax Shambhala Center to receive teachings from Sakyong Mipham Rinpoche. 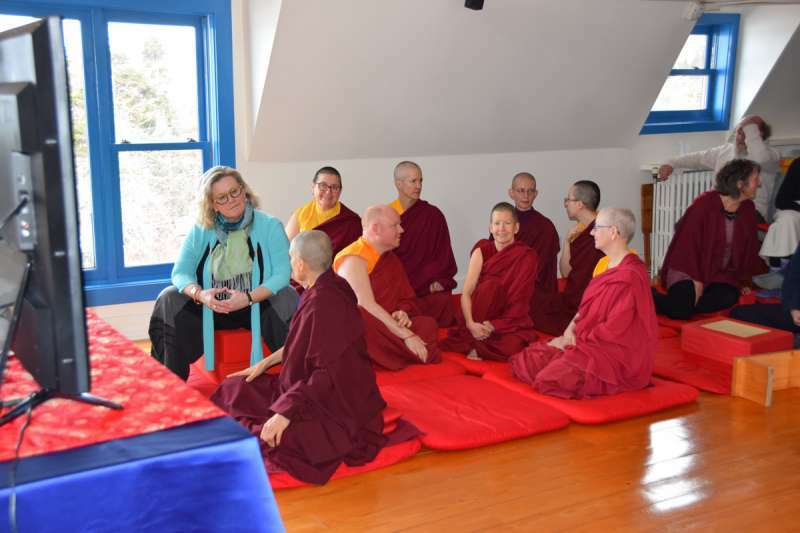 After the teachings the participants in the monastic residency, Warriors Who Are Fearless had the opportunity to receive an audience with the Sakyong. 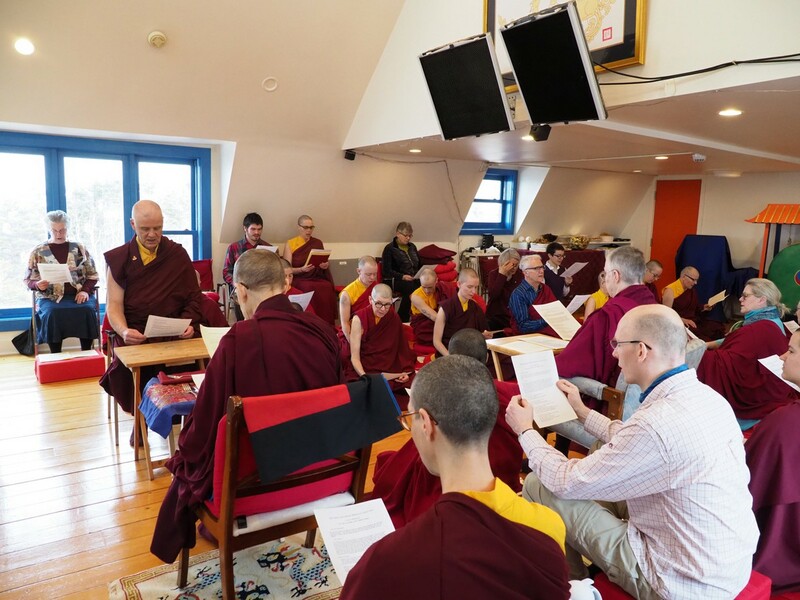 During the audience the Sakyong spoke about the important role that the monastic sangha has within the Shambhala community to provide a location where a deep understanding of the Shambhala terma teachings can be developed and nurtured. 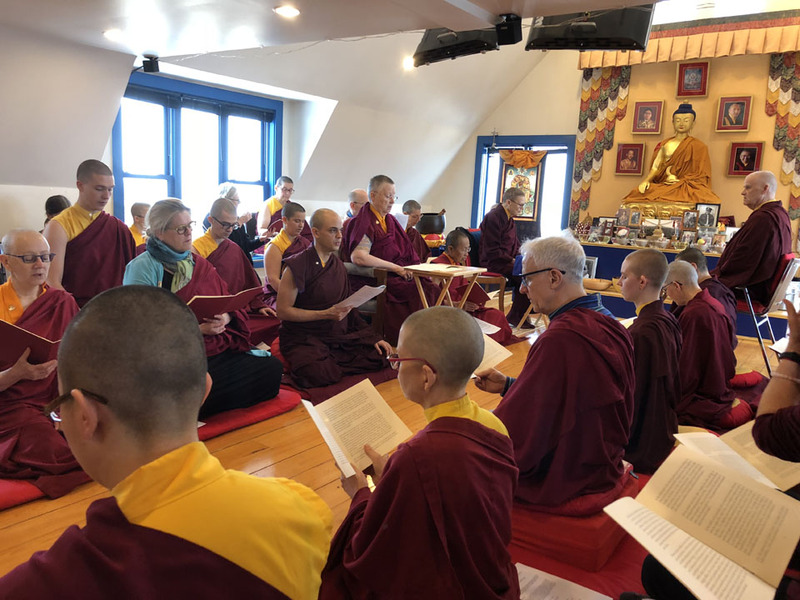 At the request of Chögyam Trungpa Rinpoche, Venerable Thrangu Rinpoche introduced temporary ordination (Tsanchö Genyen/Upasaka Brahmacharya ordination) to give Dharma practitioners an opportunity to experience monasticism without making a lifetime commitment. 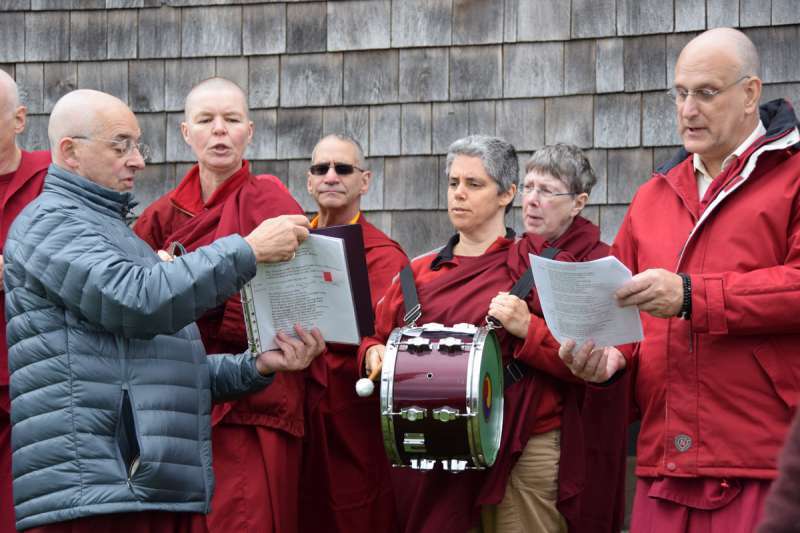 The prerequisite is the Refuge Vow. 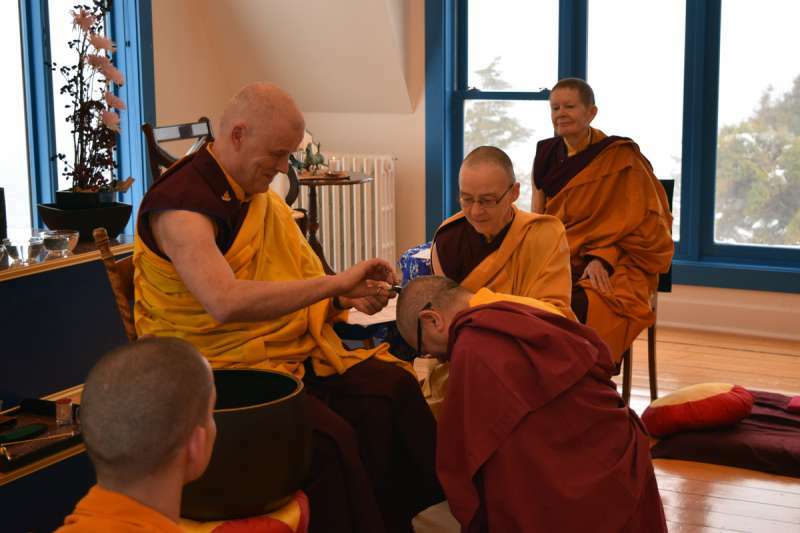 Temporary ordination is offered within the context of our monastic residencies from the Shambhala Monastic Order. 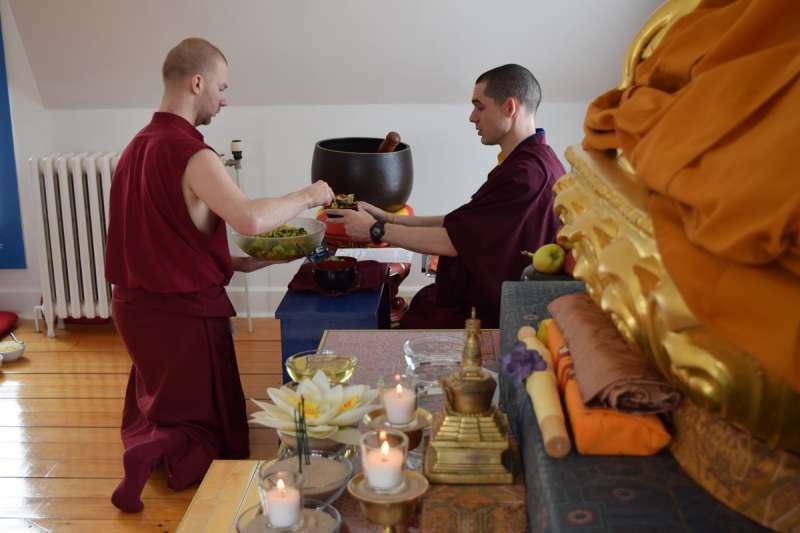 Taking temporary ordination involves two ceremonies. 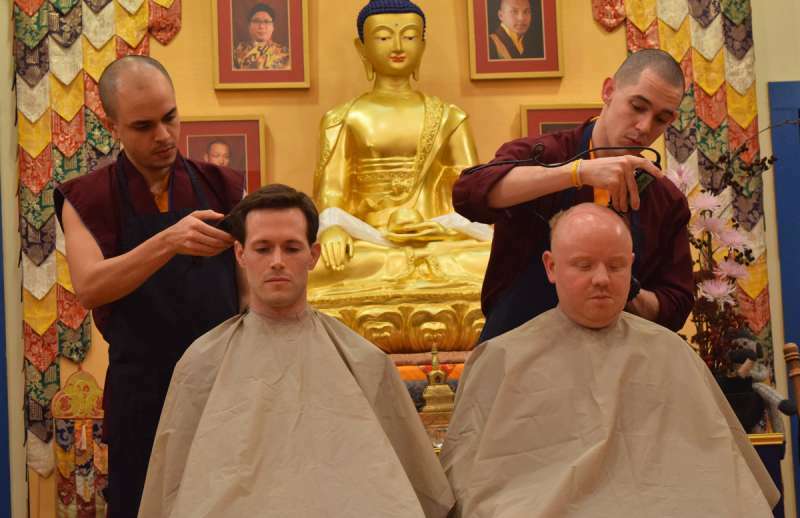 The first is a public hair cutting where the residents heads are shaved leaving a small top knot of hair. 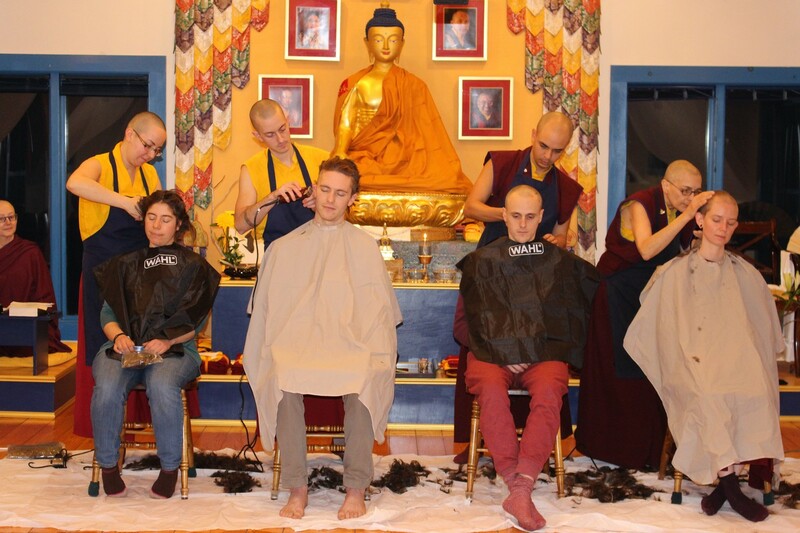 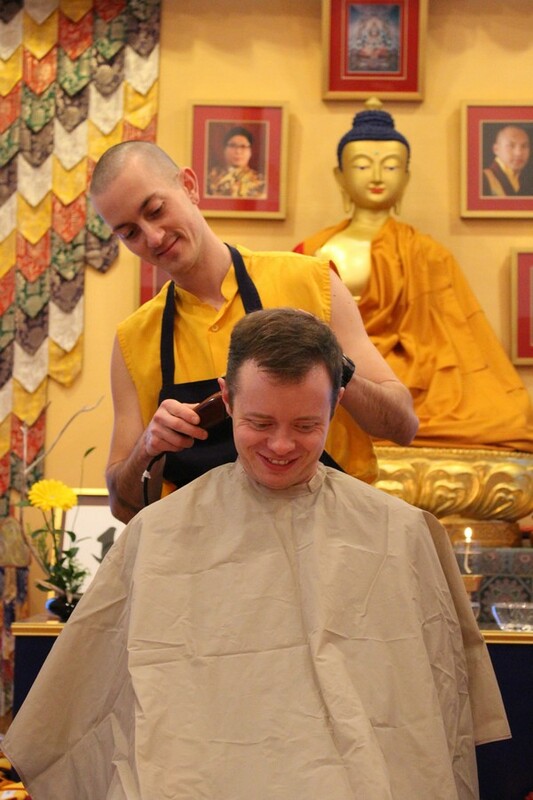 At the end of the hair cutting ceremony residents are given their temporary monastic robes. 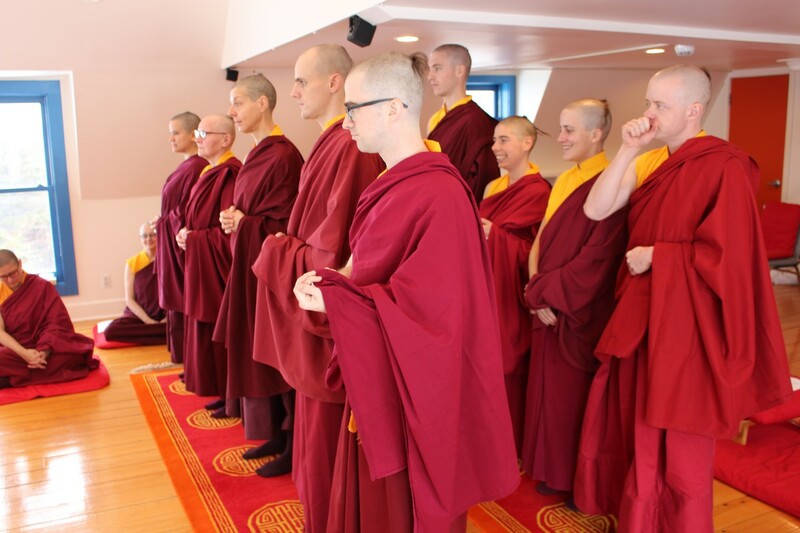 This is followed the next day by the actual ordination ceremony which is lead by the monastic preceptor. 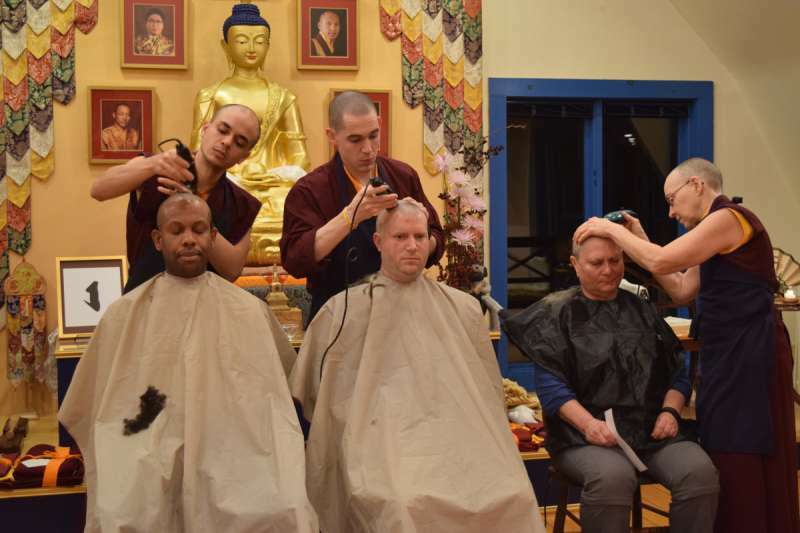 The preceptor introduces the five precepts, cuts the last remaining hair of each participant and then offers the vow. 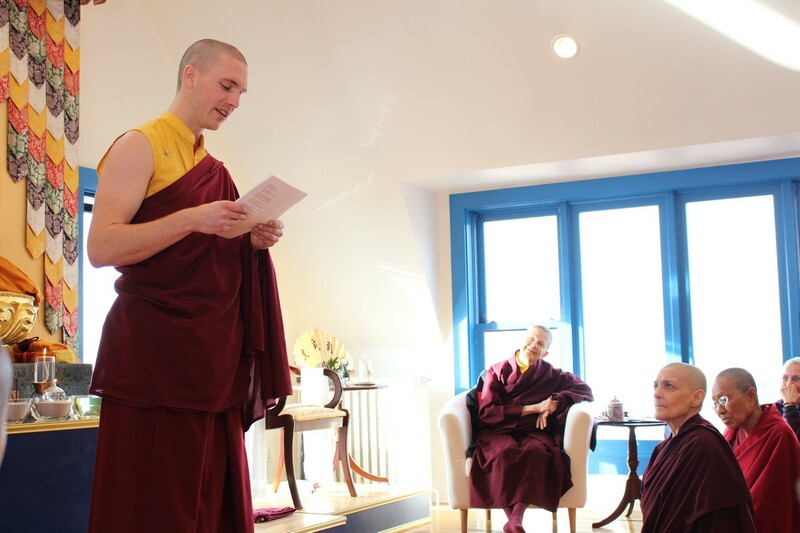 The vows are transmitted at the point in the ceremony where the preceptor snaps their fingers. 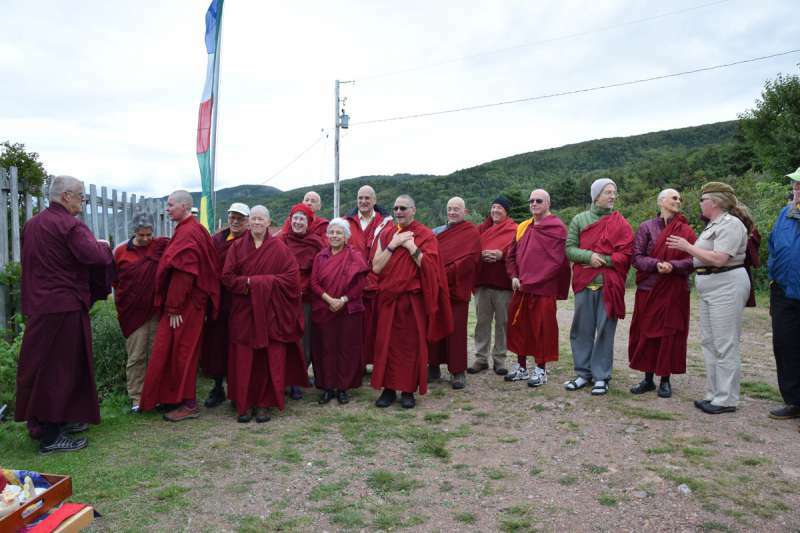 A gate closing ceremony was held on September 2016 to begin the 3rd cycle of the Group G, 3 year retreat at Sopa Choling. 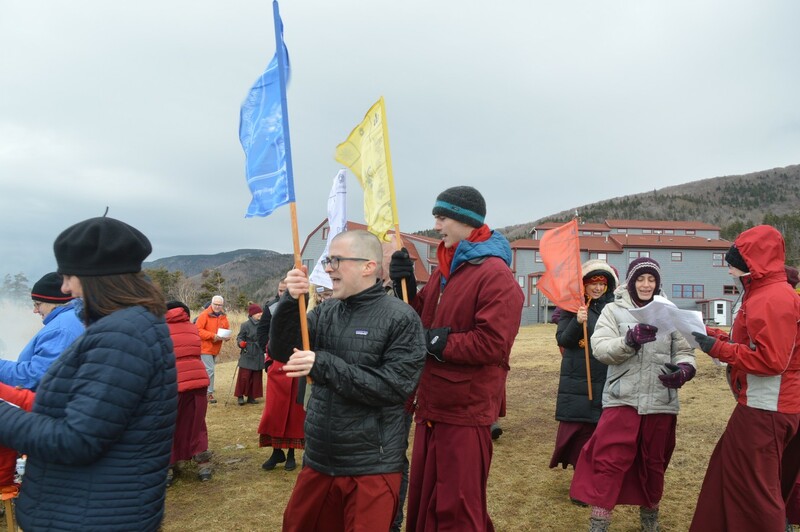 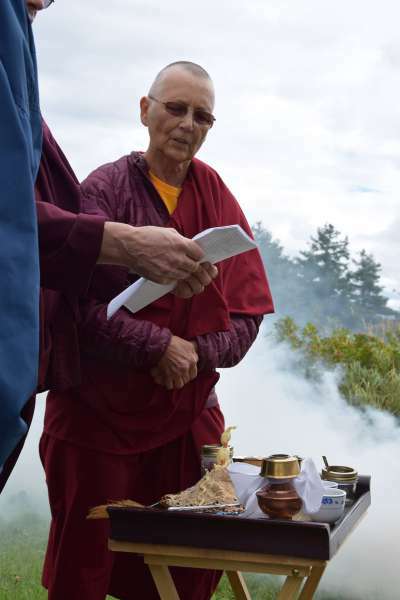 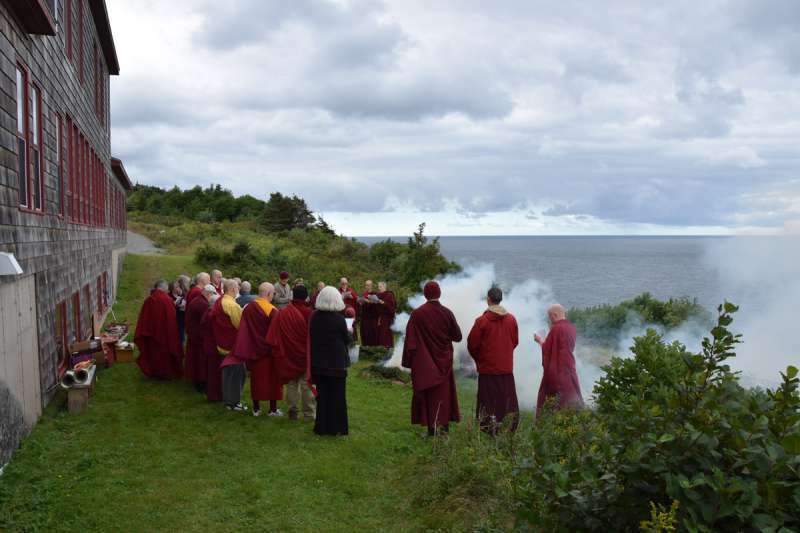 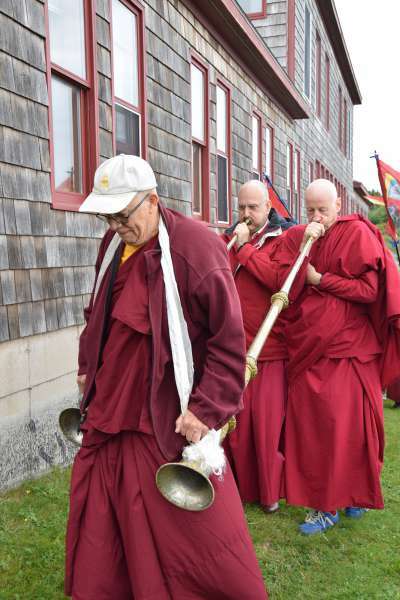 The ceremony began with a lhasang held below the retreat center attended by the retreatants, Gampo Abbey monastics and some members of the local sangha. 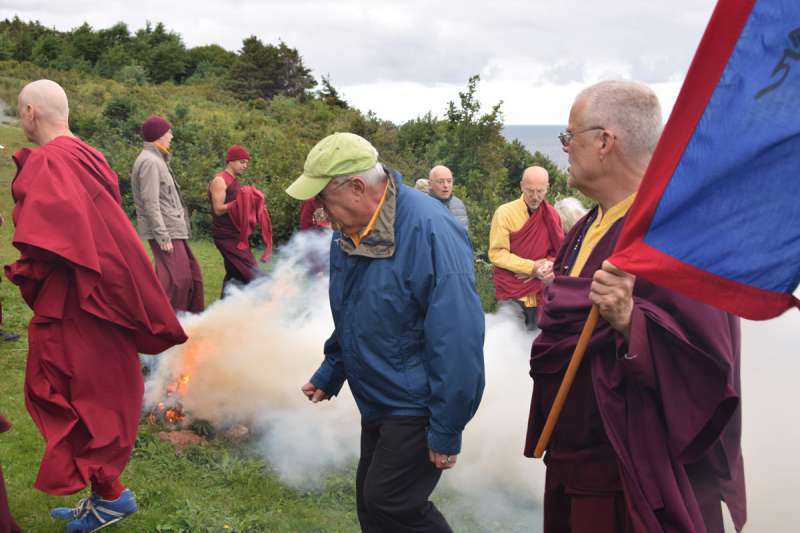 The lhasang is performed to purify the environment and bring down the energies in the environment to support the retreat. 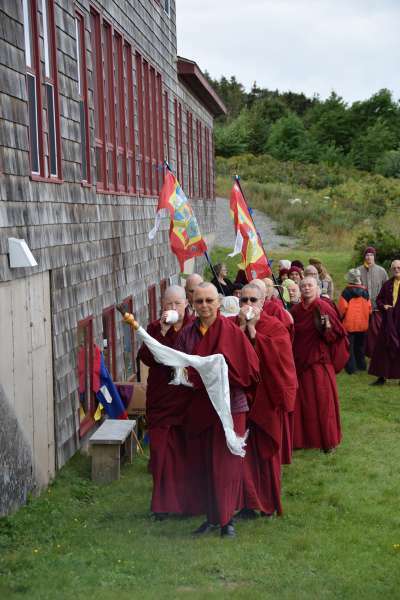 Following the lhasang, a procession lead by the retreatants circumambulated the retreat center 3 times. 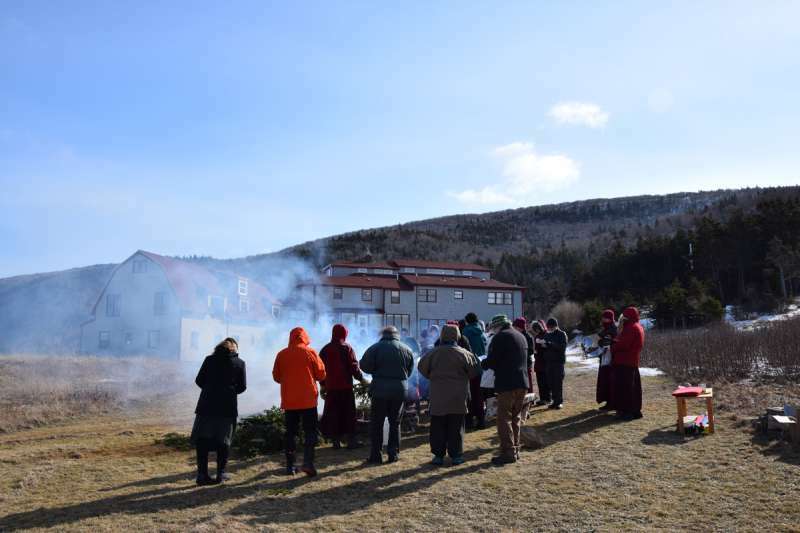 After the final circumambulation the retreatants joined the community outside the gate for one last good-bye before they returned to the retreat center. 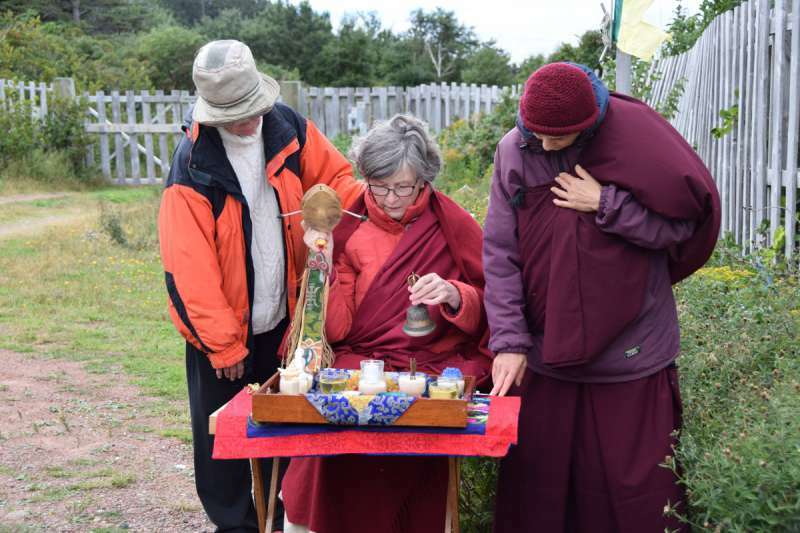 A ceremonial offering was made to the local energies after the gate was closed to help create a supportive environment for the retreat. 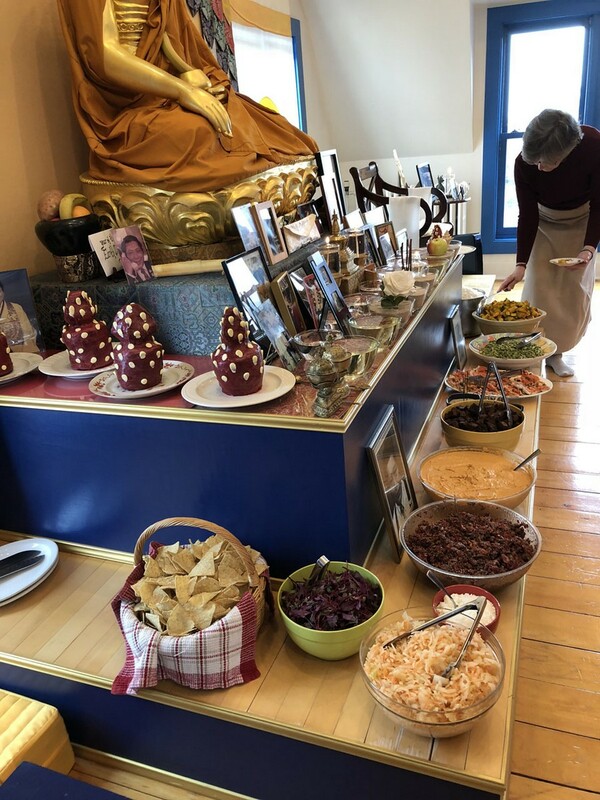 The preparation and offering of Tormas, ritual offerings made of barley dough, is a traditional practice of Buddhist monasteries in Tibet. 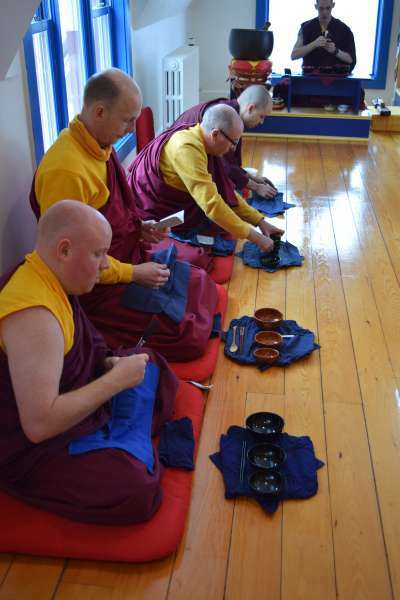 This practice was brought from Tibet and included in the daily practice schedule at Gampo Abbey. 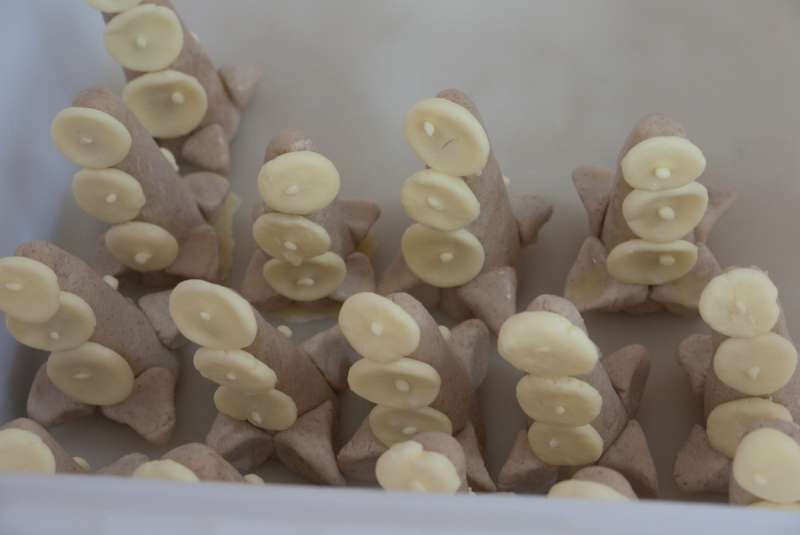 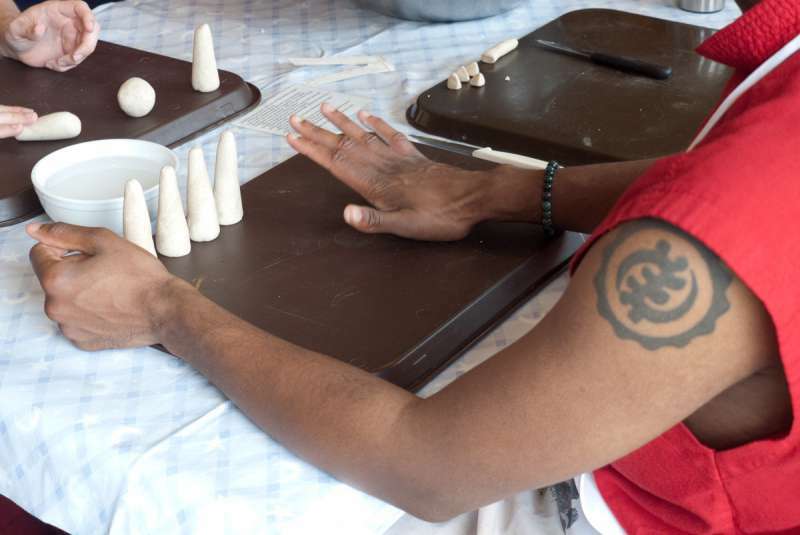 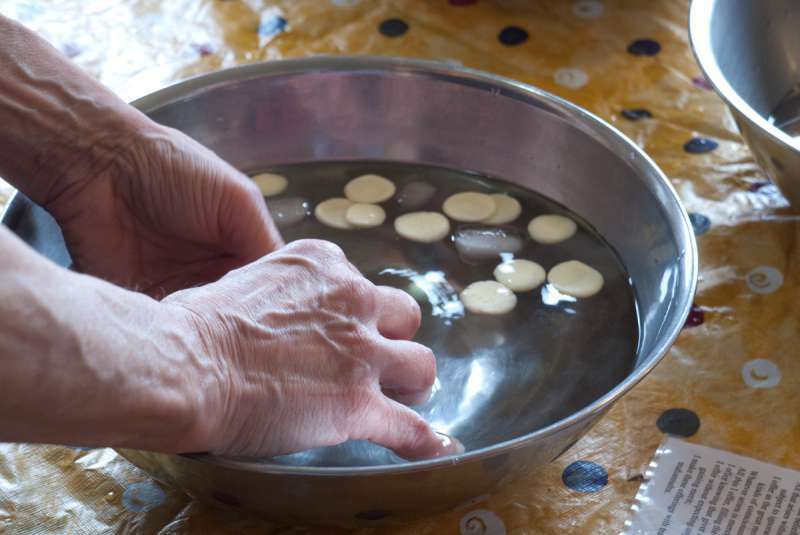 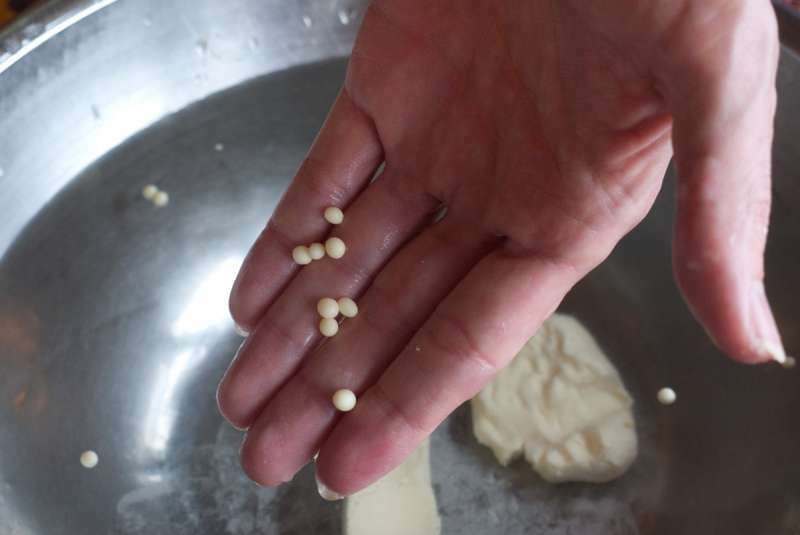 This slide show documents the process of how torma are made. 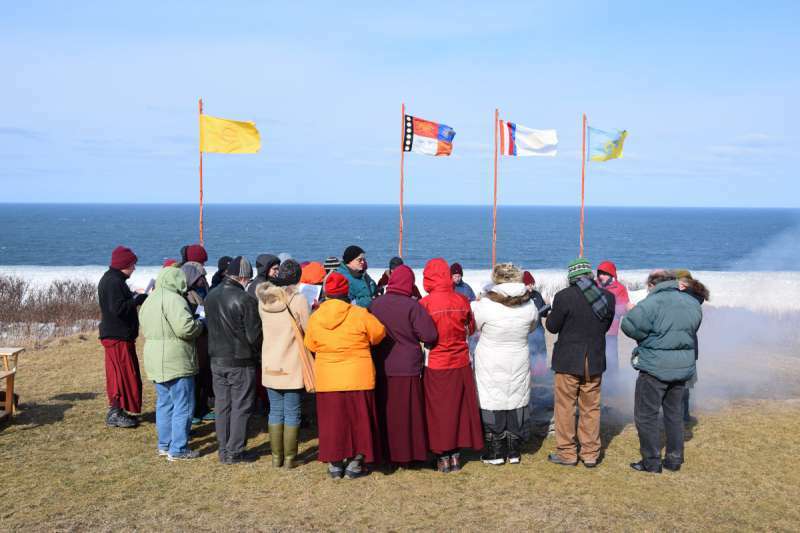 While torma are offered each day as part of the evening chants, preparing of torma by the community is scheduled as required. 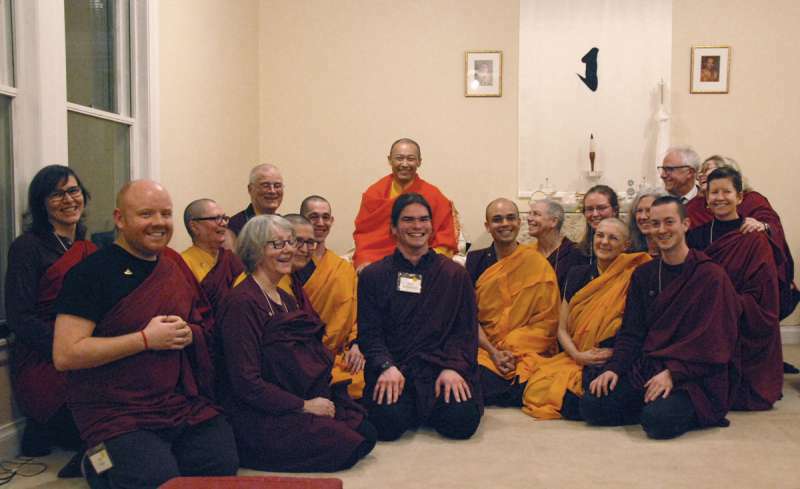 On the evening of the day before the end of the Yarne retreat all of the monastics at the Abbey must give a short talk based upon the theme of the Yarne retreat. 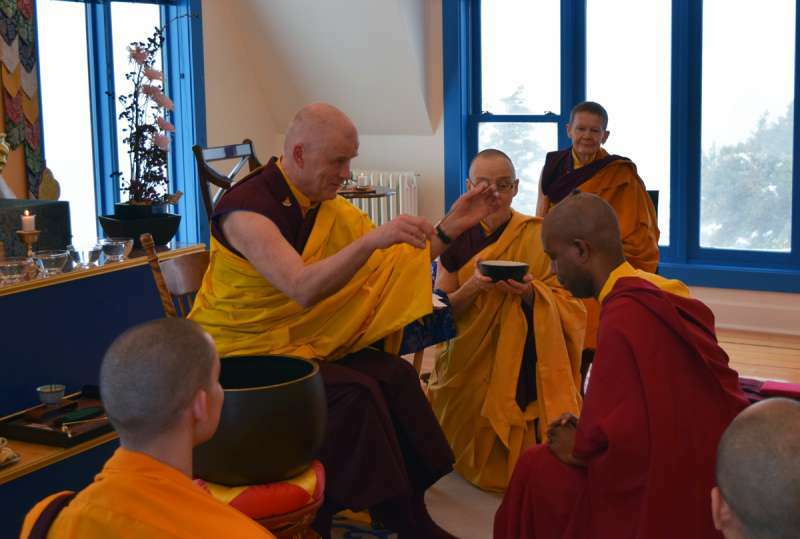 These talks are referred to as Gagye Eve talks. 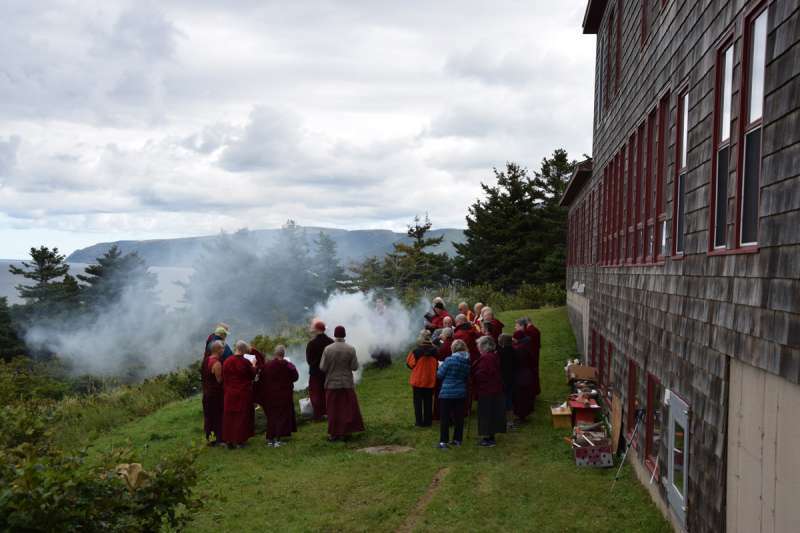 Along with holding the annual Yarne retreat, giving the Gagye Eve talks are one of the requirements for all Buddhist monastic communities. 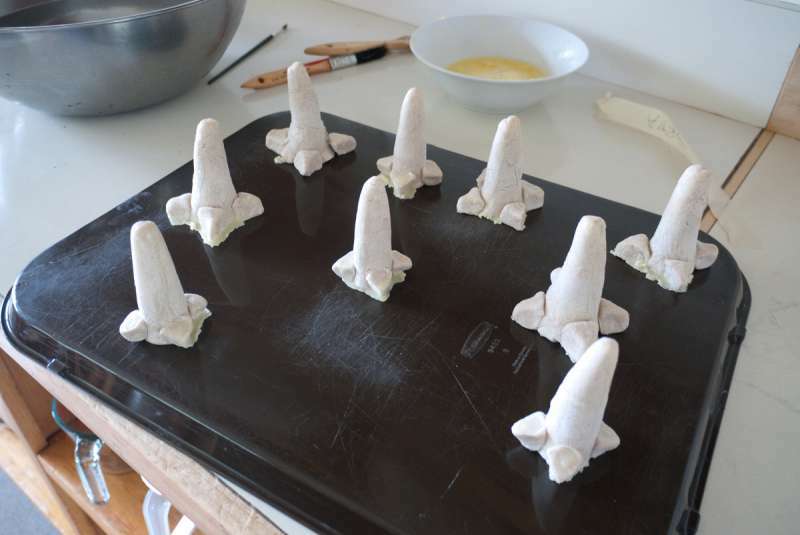 The other condition is to hold the bi-monthly sojong confession ceremony. 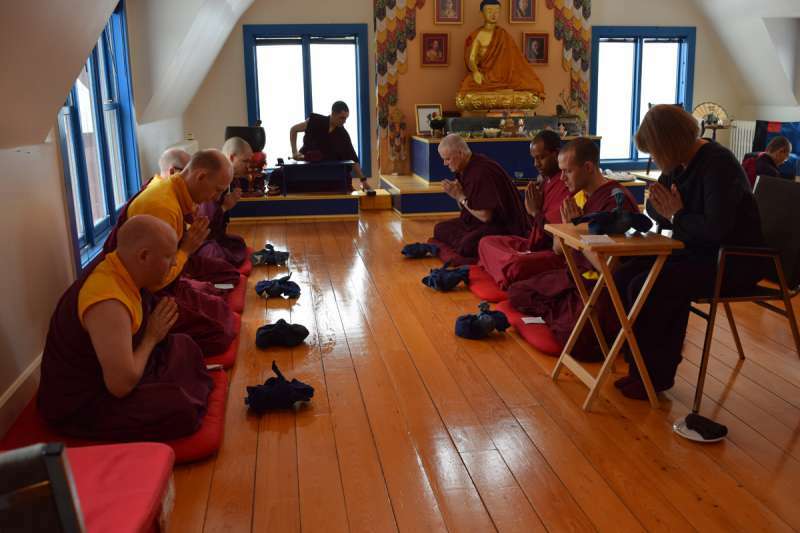 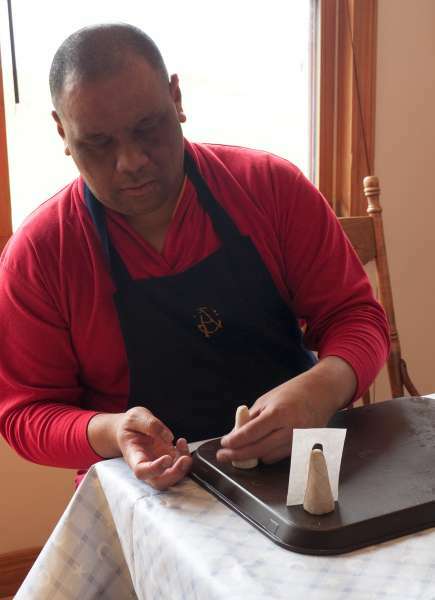 All these of these practices are held at Gampo Abbey. 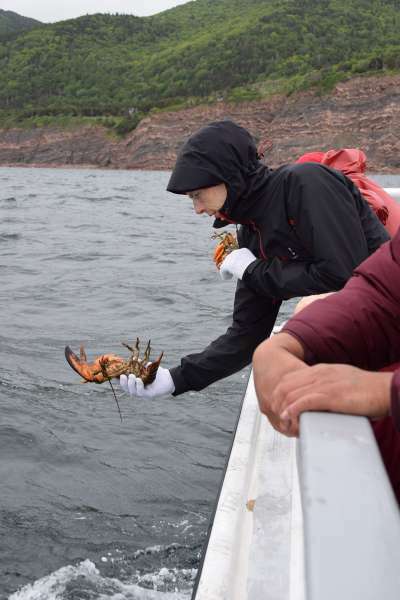 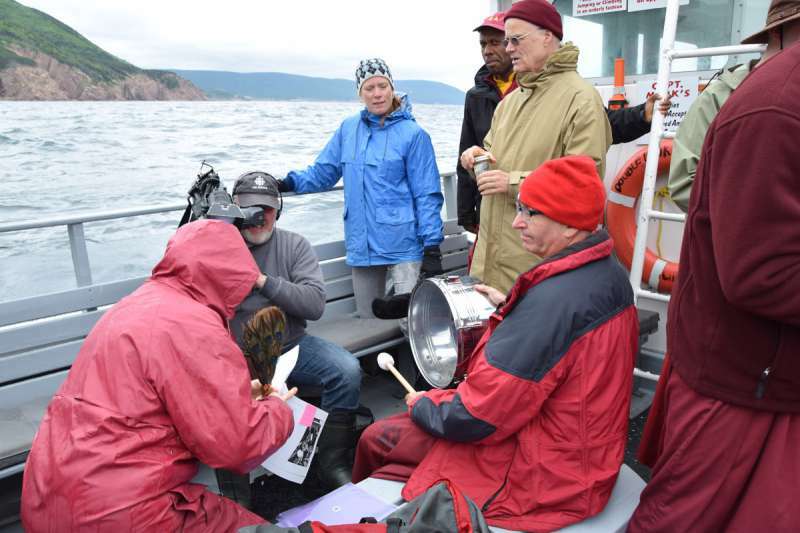 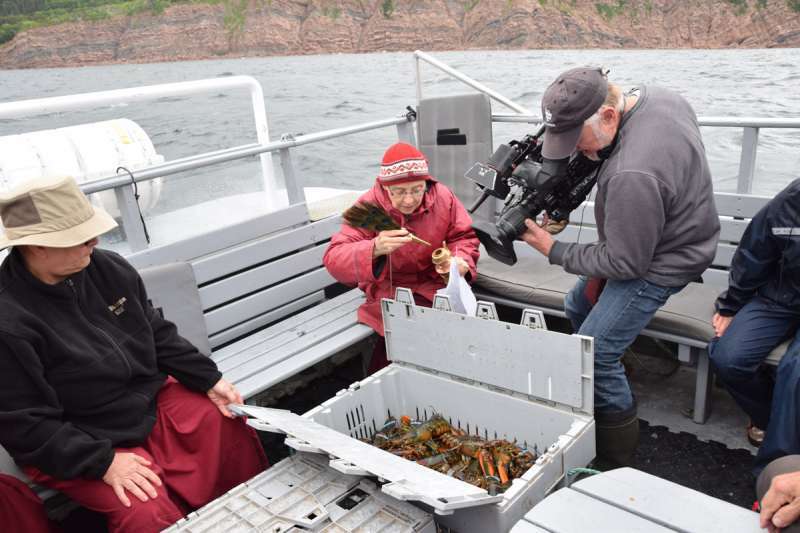 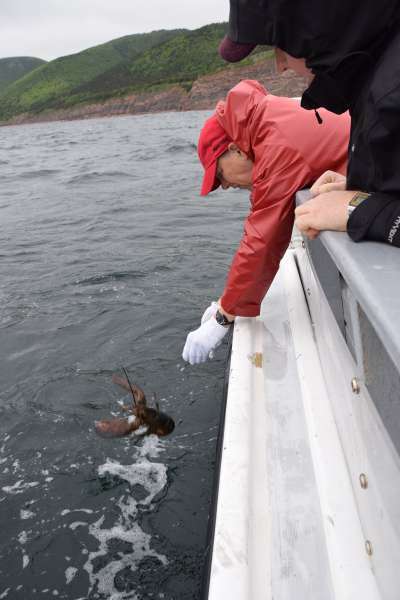 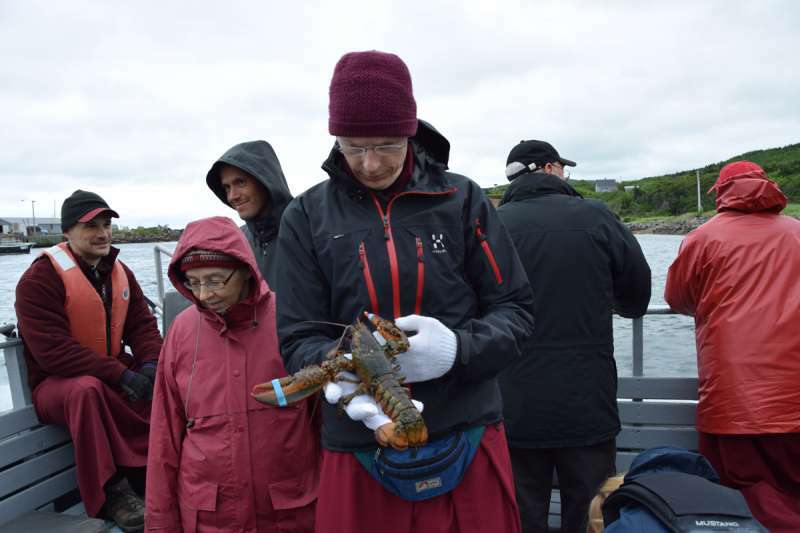 Our 2016 lobster release was highlighted by visitors from Canada’s national broadcaster the CBC’s regional maritime program Land and Sea. 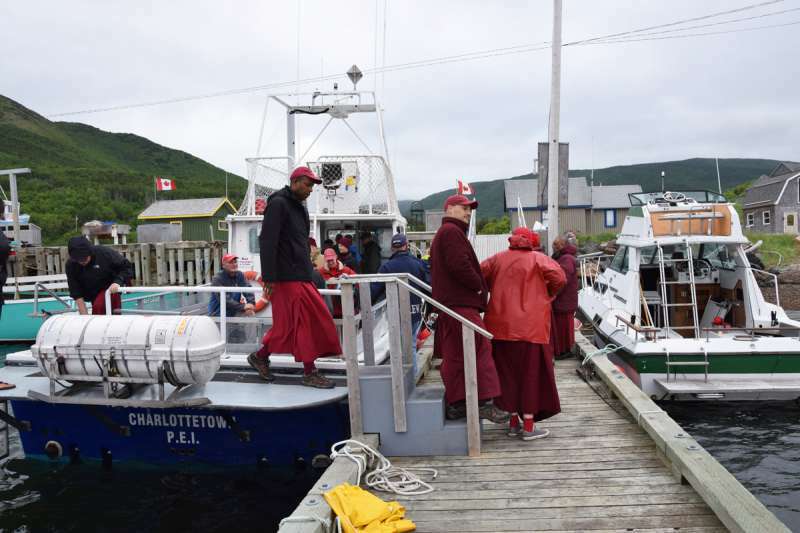 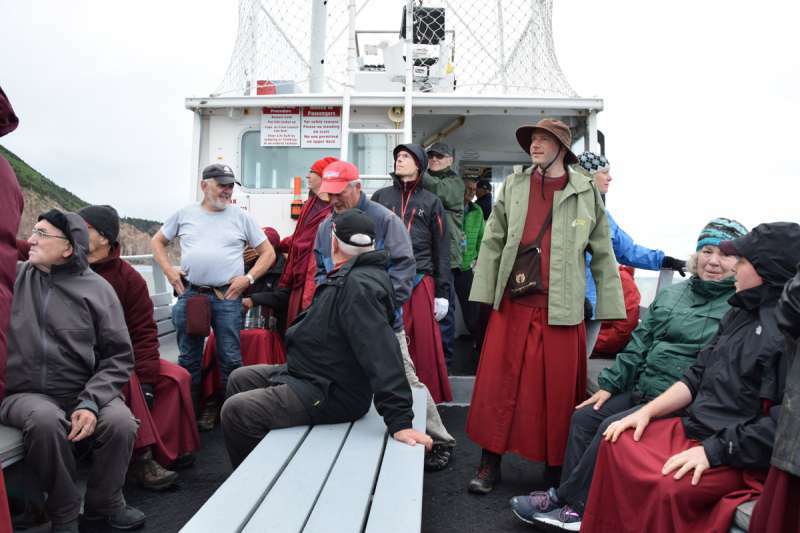 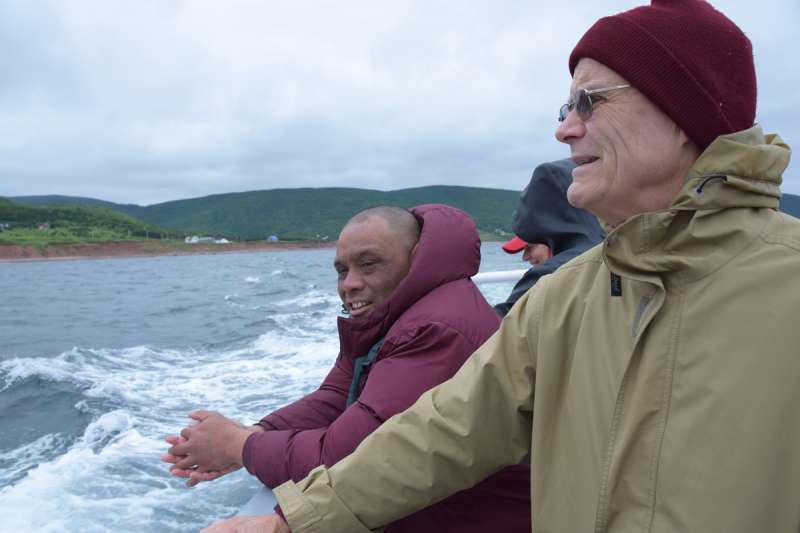 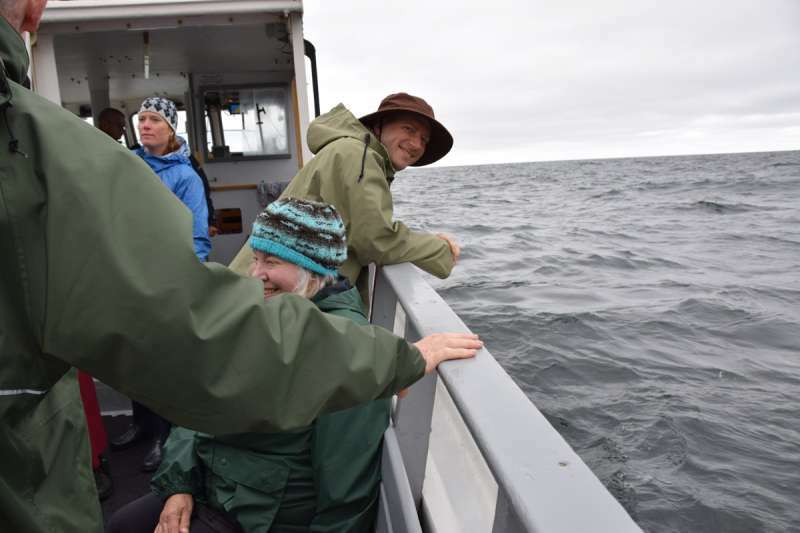 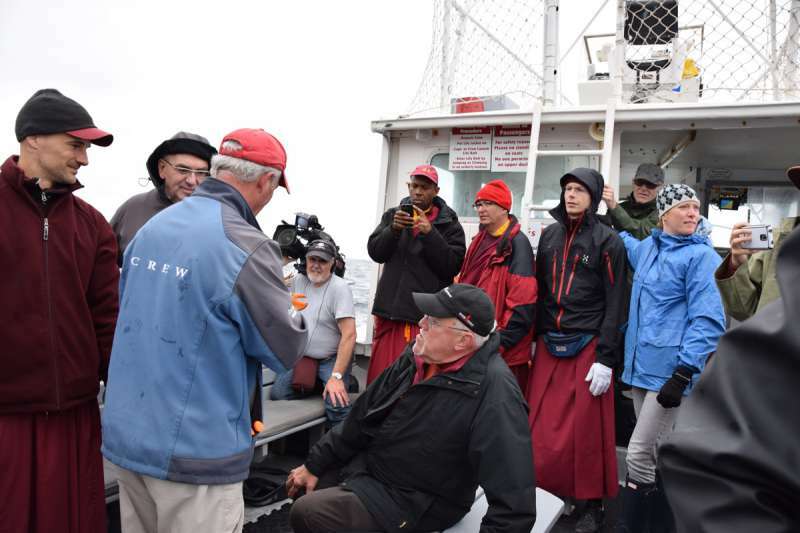 They joined us for the day as we sailed with Captain Mark Timmons from Pleasant Bay harbour to the waters just off the shore from Gampo Abbey. 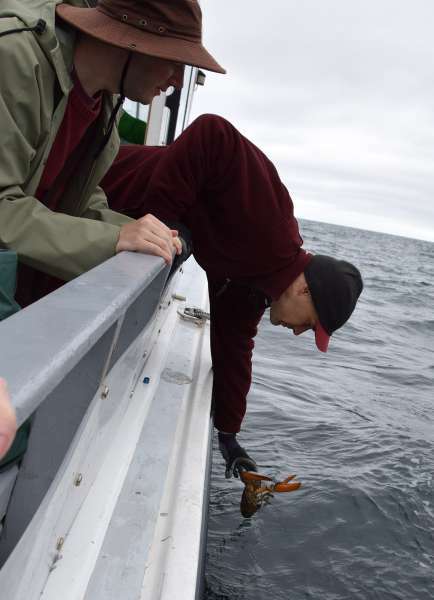 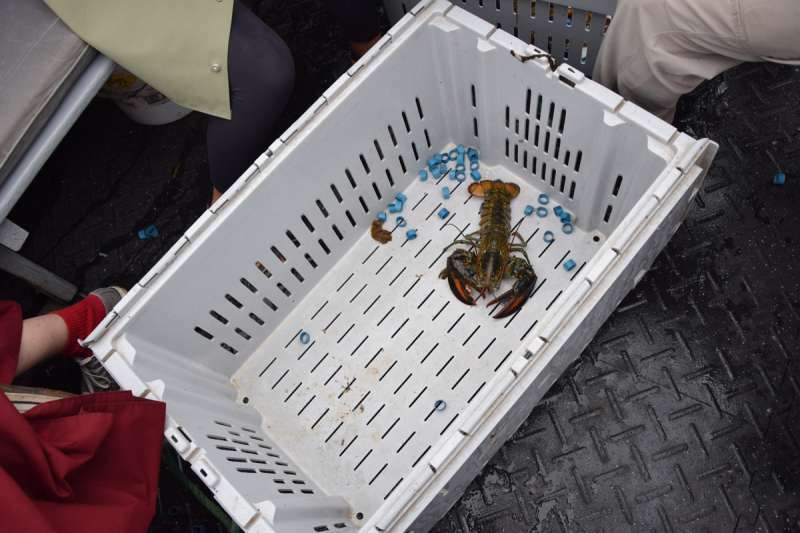 The cold winds kept the boat rolling as we released almost 200 lbs of lobsters in the same waters where many of them had been caught earlier that day. 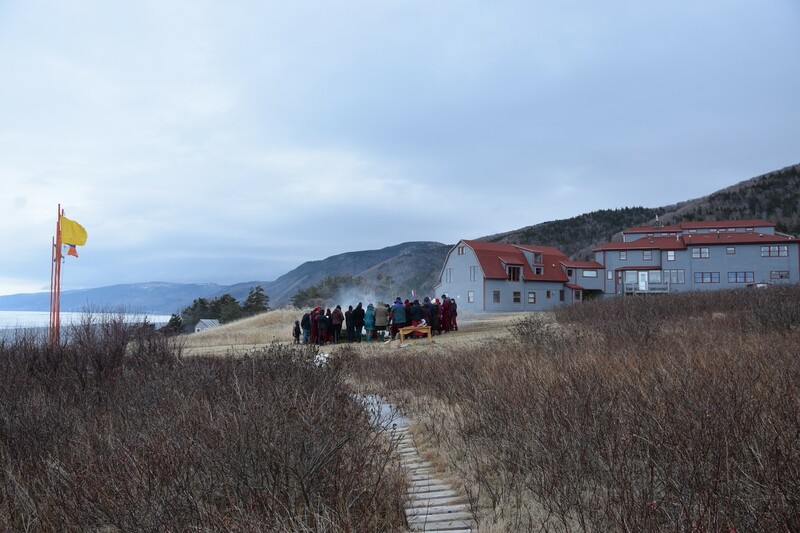 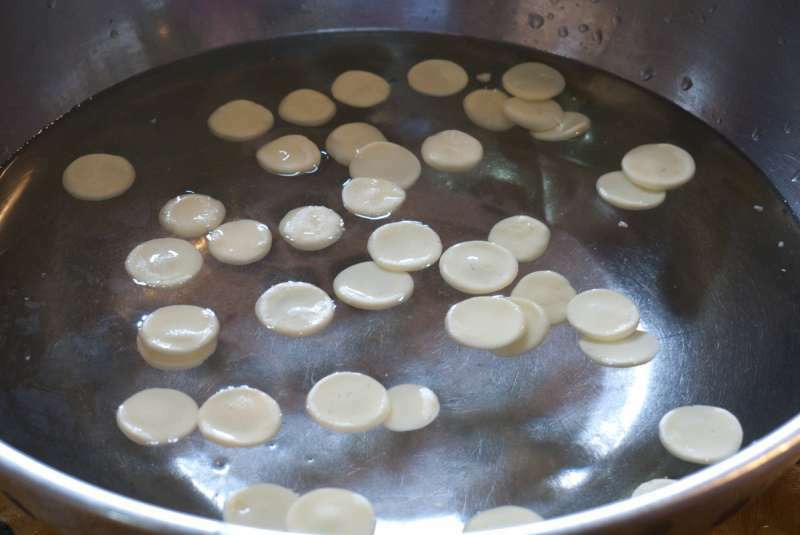 The annual Yarne retreat at Gampo Abbey traditionally includes two weeks of silent intensive retreat when meals are eaten Oryoki style. 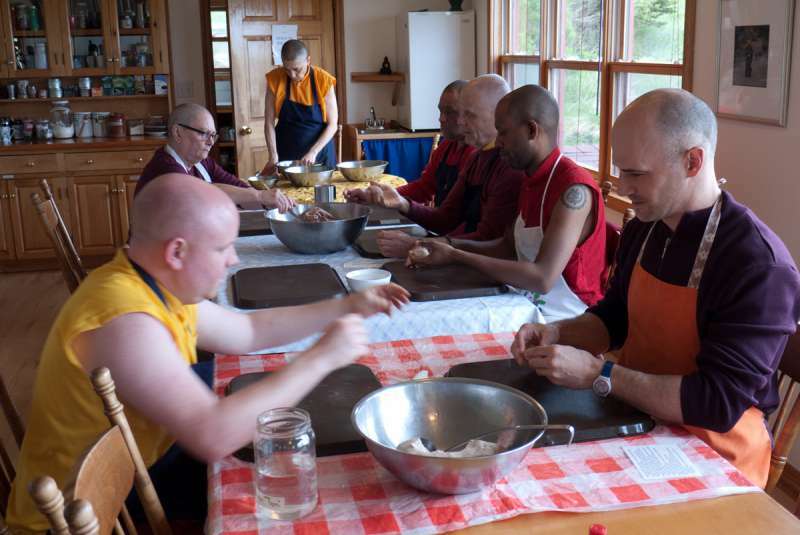 These photos were taken during the 2016 Yarne retreat. 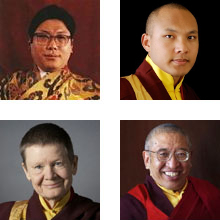 For more information on Oryoki practice within the Shambhala community follow this link.